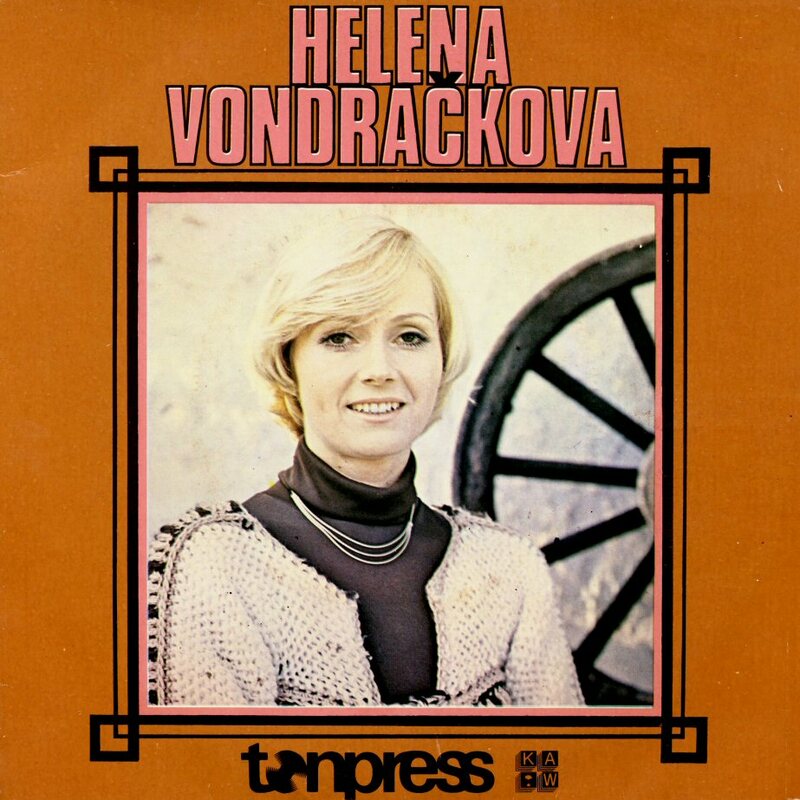 Helena Vondráčková was born on 24 June 1947 in Prague but she grew up in a little town of Slatinany in the Eastern part of Bohemia. 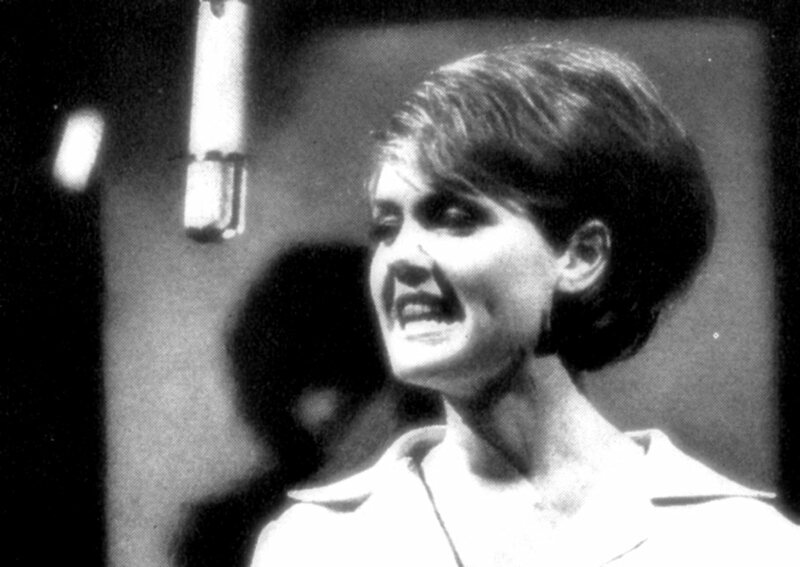 Her first appearance as singer took place in 1964 at the Lucerna hall in Prague where she participated and won the contest "We are looking for new talents". 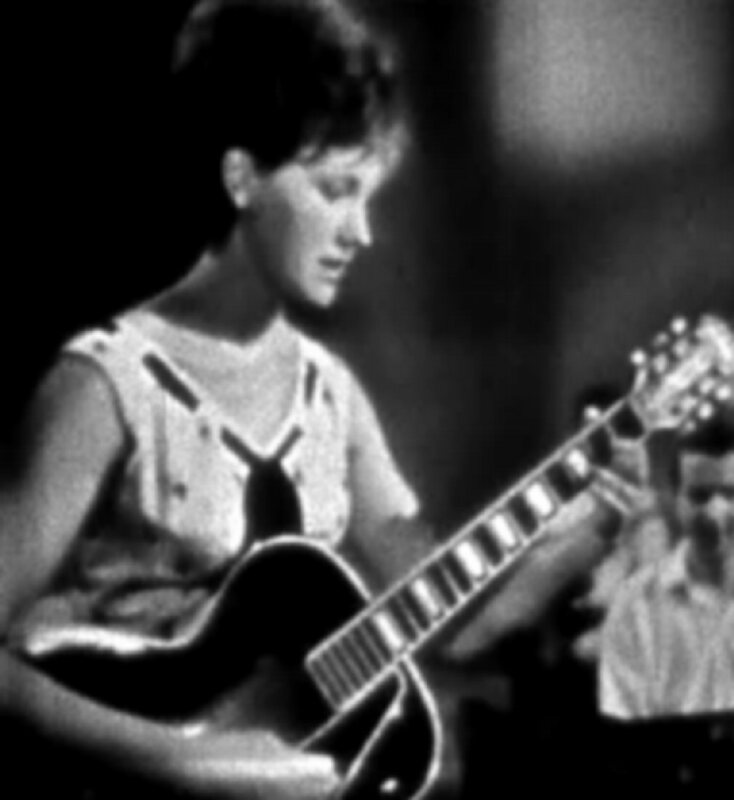 In June 1964 Helena appeared for the very first time on Czechoslovakian TV with her first hit "Cervena reka" (Red River Valley) - an American folk song with Czech lyrics. Helena recorded the song "Cervena reka" (Red River Valley) on September 3rd in the Supraphon's recording studio. It was released as a single in Czechoslovakia in the autumn 1964. It was the very first Helena single which became big hit. 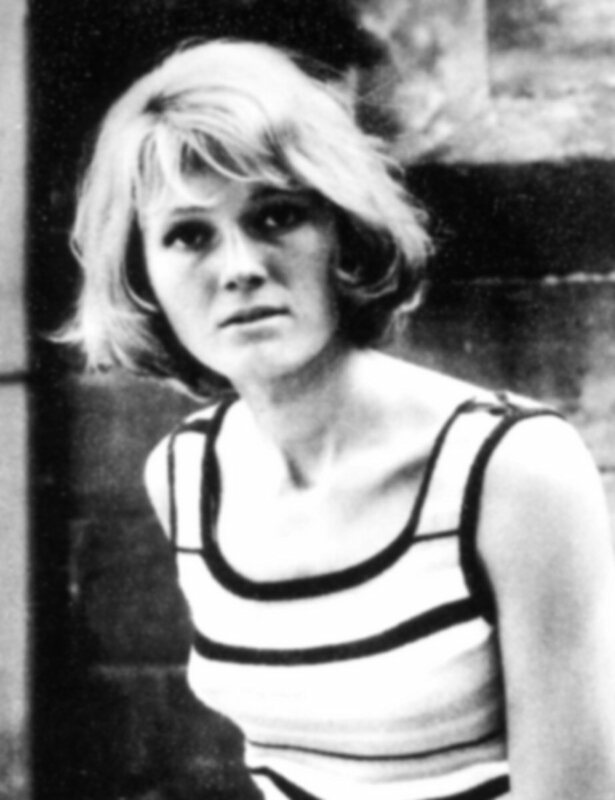 In autumn 1964 she started working at the theatre "Rokoko" in Prague. 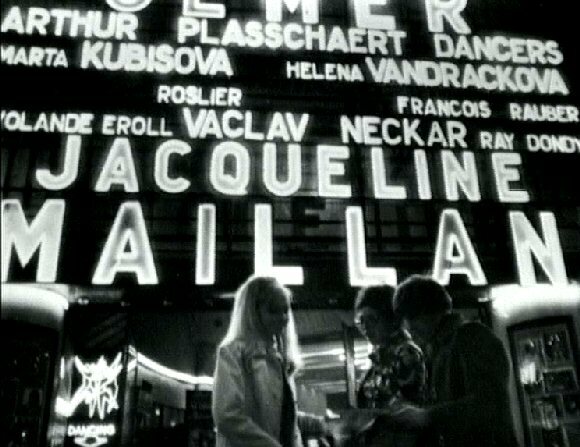 At "Rokoko" she met for the first time two other singers: Marta Kubisova (already a big name on Czechoslovakian scene) and Vaclav Neckar. Occasionally all three of them worked together and recorded some duets. The three singers recorded absolutely fabulous amount of hits during the first period at "Rokoko". 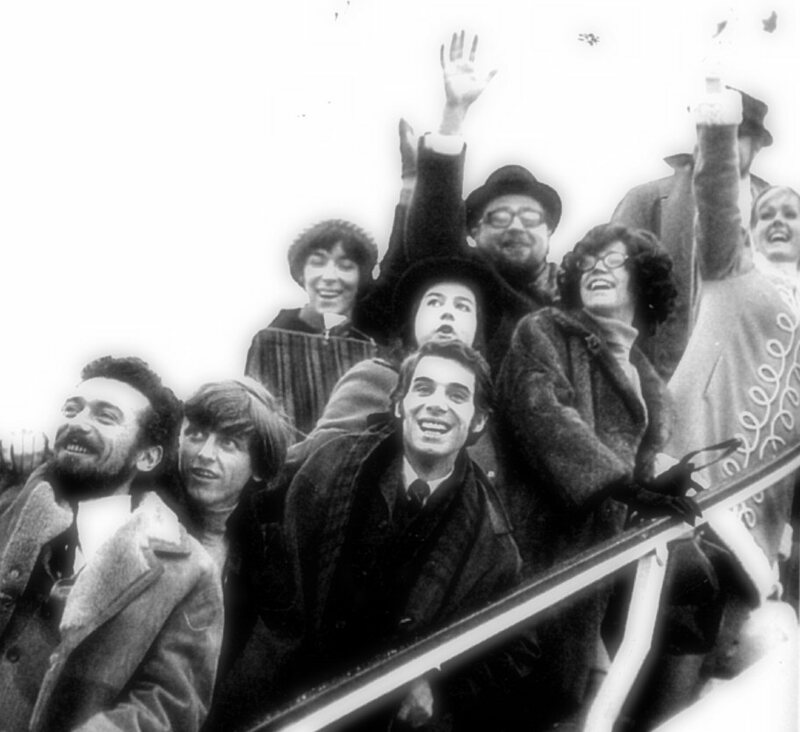 They were loved by the audience and TV viewers. They became super stars. 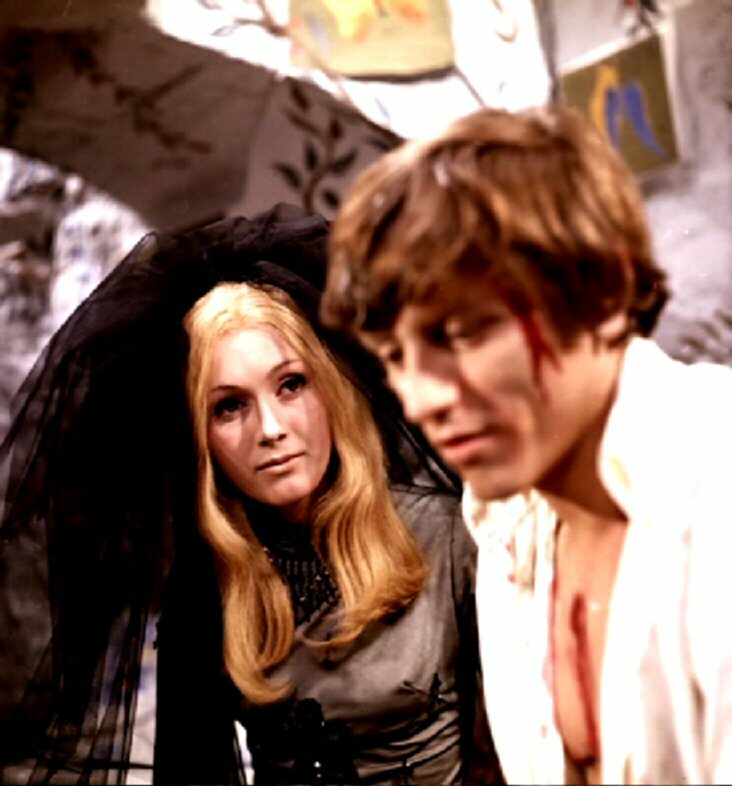 On 28 November 1965 the theatre Rokoko in Prague had premiere of the play "Ballad with rag" featuring Helena and Waldemar Matuska. 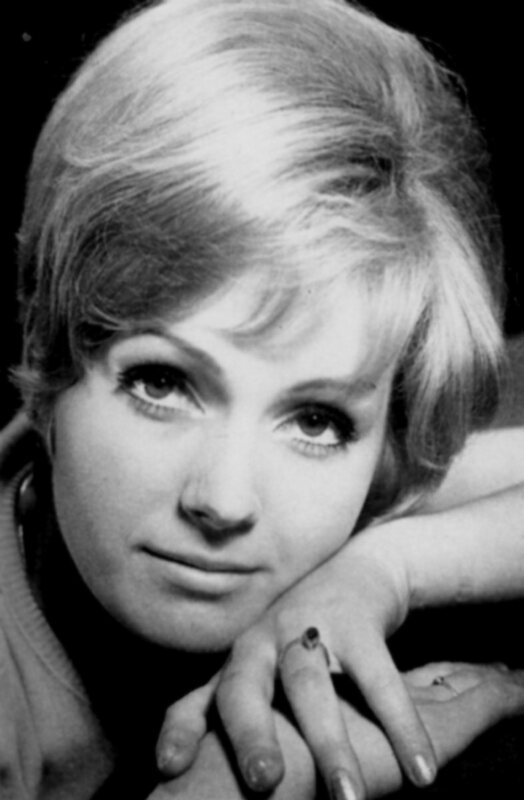 In 1965 she won "The Golden Nightingale" as the most popular singer in Czechoslovakia. 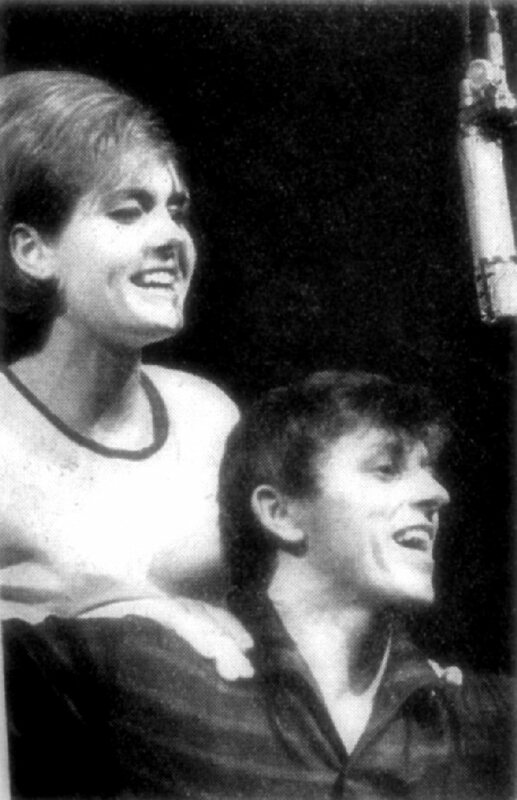 New musical at the Rokoko theatre in Prague was entitled "Waiting for Fame" and it had its premiere on January 1st, 1966. 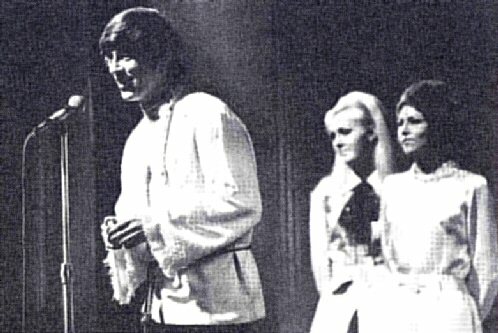 The songs were written mostly by Jan Schneider & Bohuslav Vondracek and the show featured Helena, Vaclav Neckar and Marta Kubisova playing main parts. 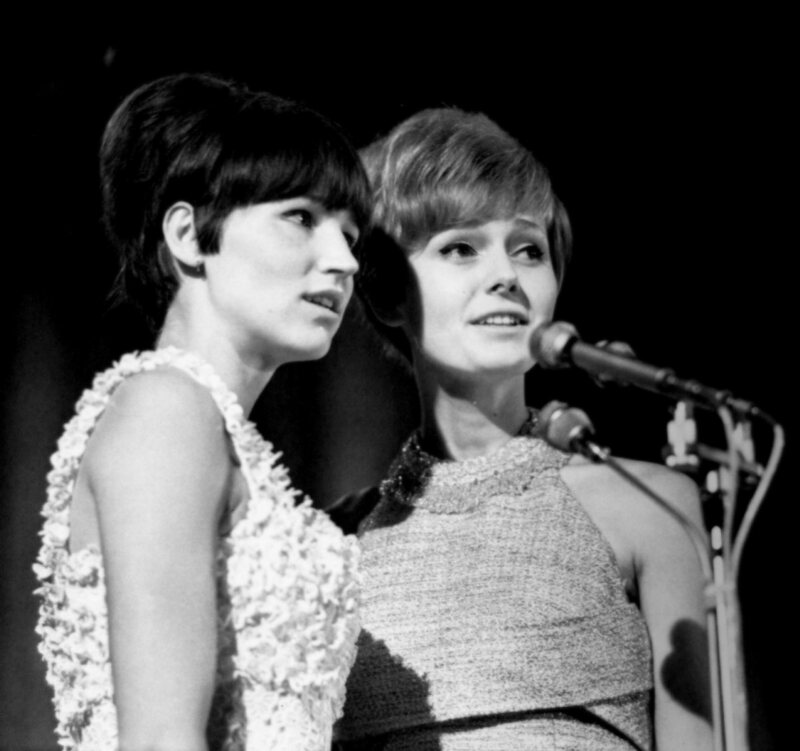 They sang songs which would become big hits in Czechoslovakia. In the summer Helena and Marta Kubisova participated in the Song Festival "Bratislavska Lyra" in Bratislava. They performed the song "Oh Baby Baby" written by Jan Schneider and Bohuslav Ondracek and won the second prize - The Silver Lyra. 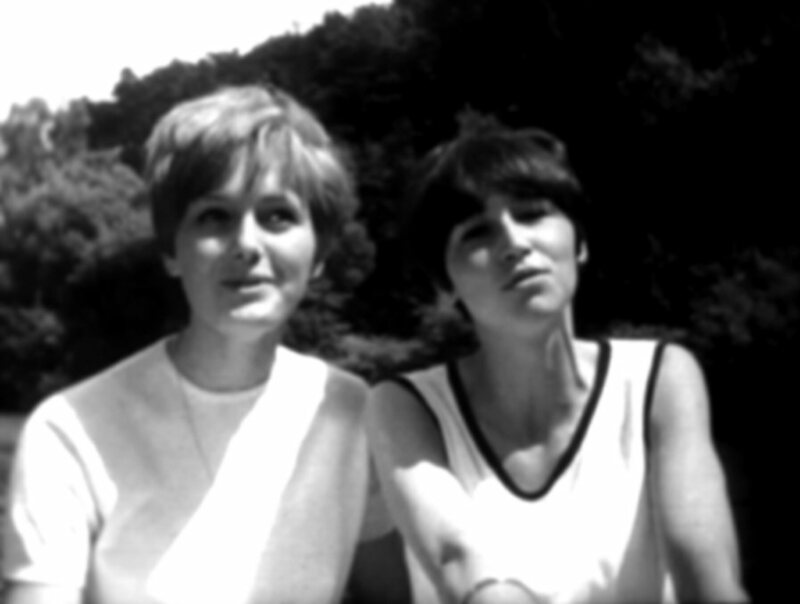 Helena and Marta participated even in a new started festival of dance music which was held also in Bratislava in June 1966. They performed "Oh Baby Baby" and won the third prize. 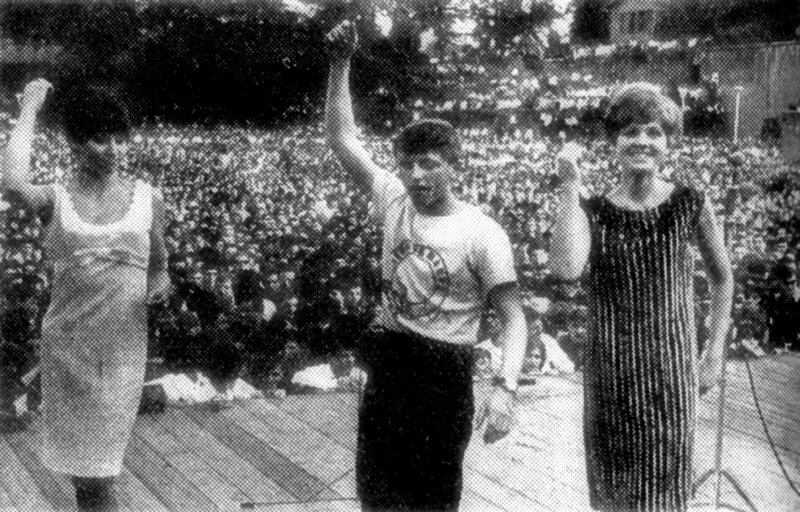 Helena, Marta and Vasek performed on the student festival "Majales" in the summer 1966. 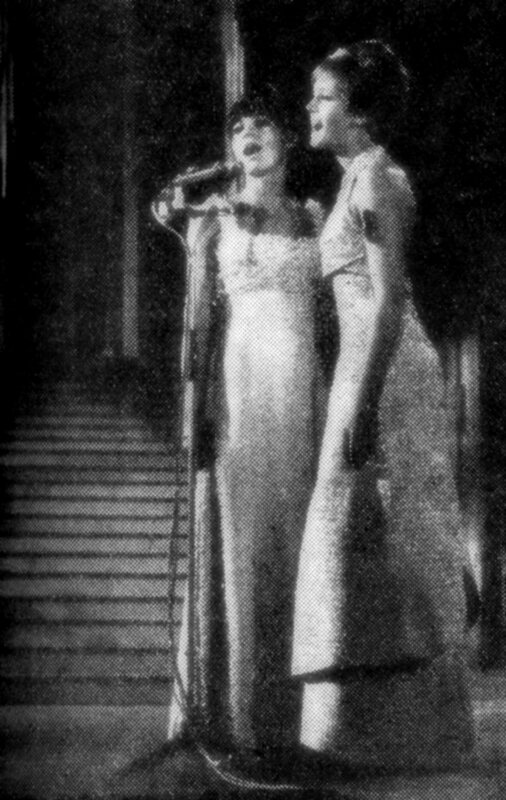 Helena and Marta performed their latest hit "Oh Baby Baby" which by the same time had entered the Czechoslovakian hit list at #2. The same year Helena had a possibility to act in a real movie picture. 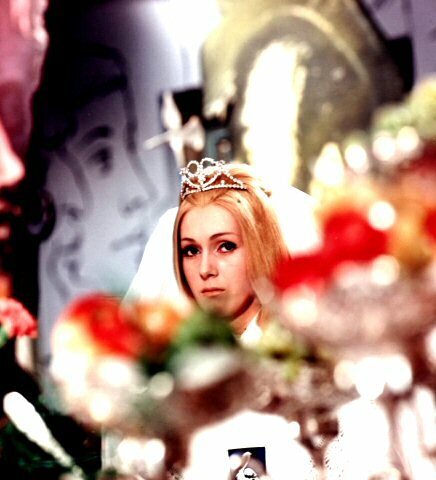 She played the main role together with Vaclav Neckar in the film "Silene smutna princezna" (A very sad princess). In 2005 the film was released on DVD. 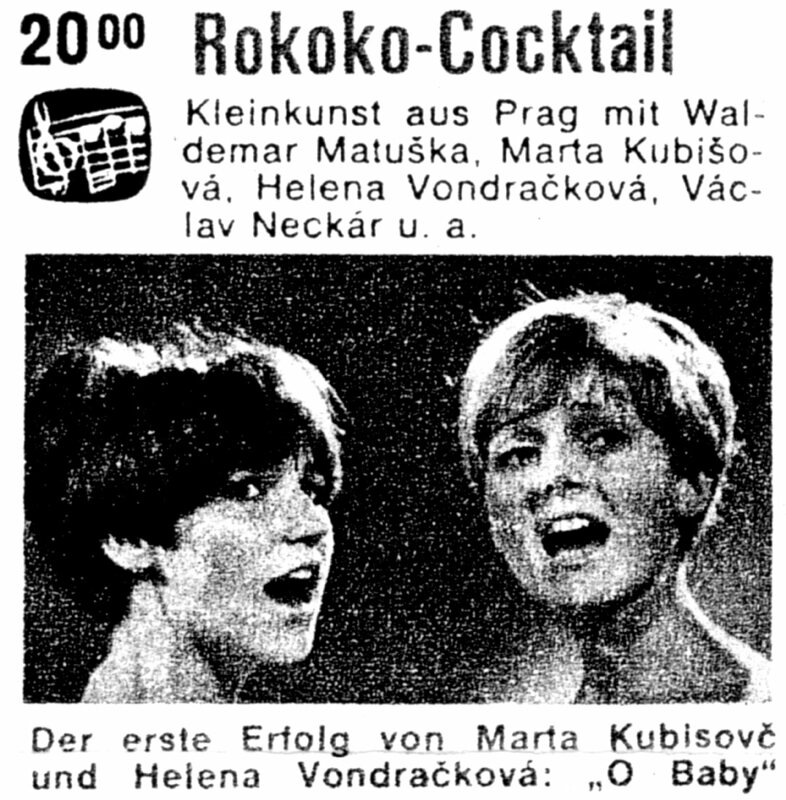 On May 3rd, 1967 West German TV ZDF broadcasted a show "Rokoko Cocktail" featuring Helena and Marta Kubisova on prime time at 8 p.m. 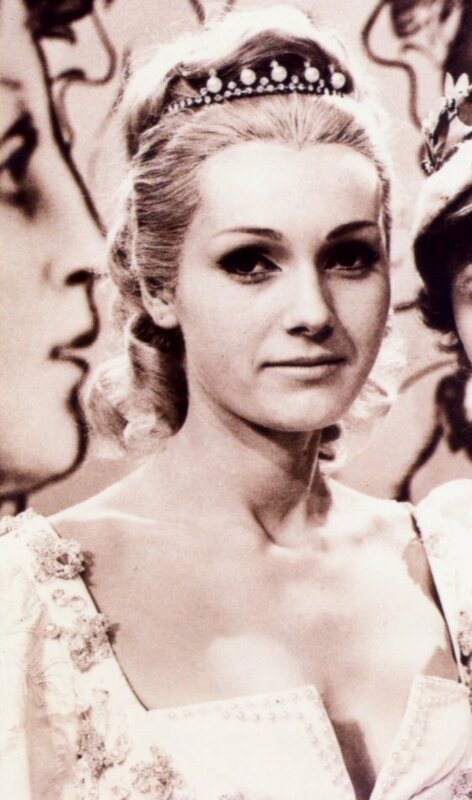 It was beginning of Helena's career in Germany. 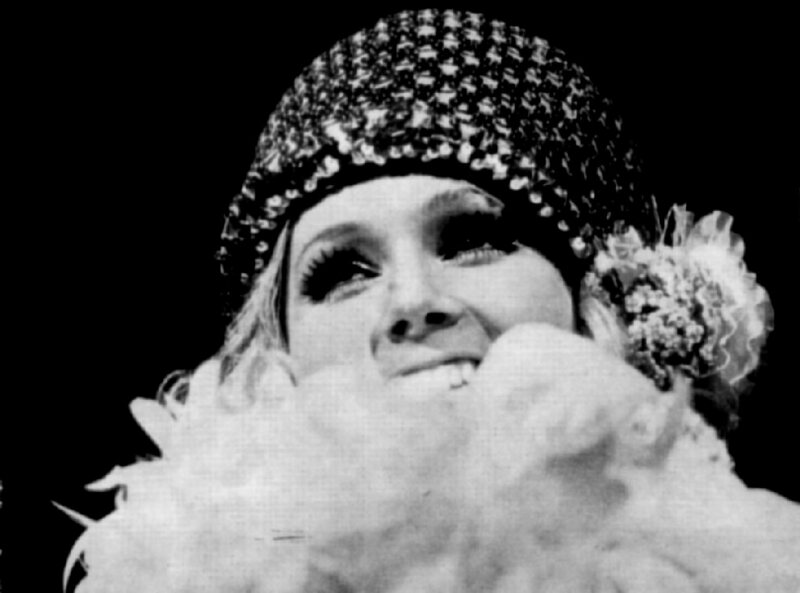 In the autumn 1967 Helena was one of the main stars at the "Rokoko" theatre in the show "Listy duverne" (Confidential letters). 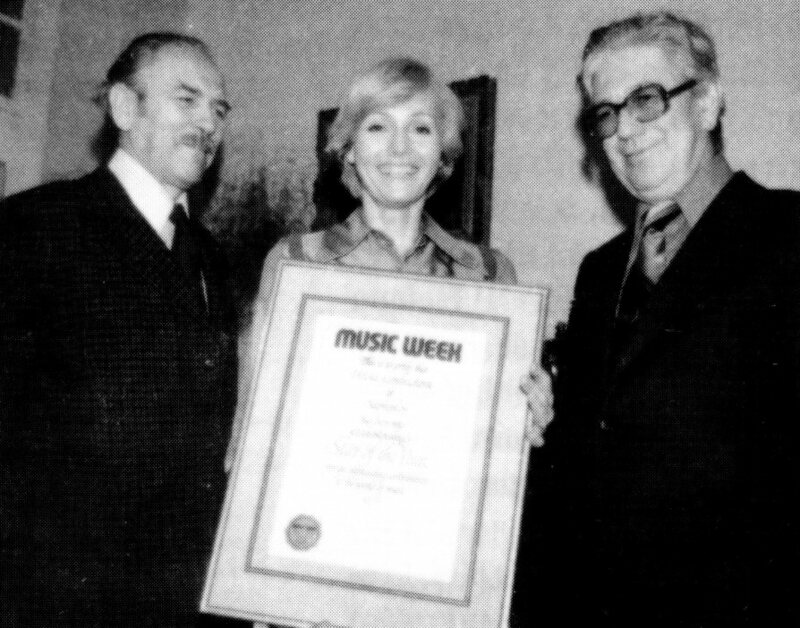 She performed her songs together with Marta Kubisova and Vaclav Neckar. 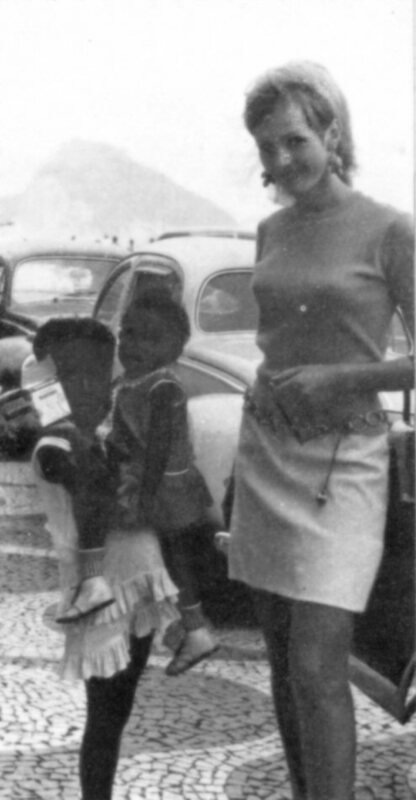 In November 1967 Helena represented Czechoslovakia on the music festival in Rio de Janeiro. She performed the song "Vzdaleny hlas" (Distant voice) written by Karel Svoboda who followed with Helena to Rio. 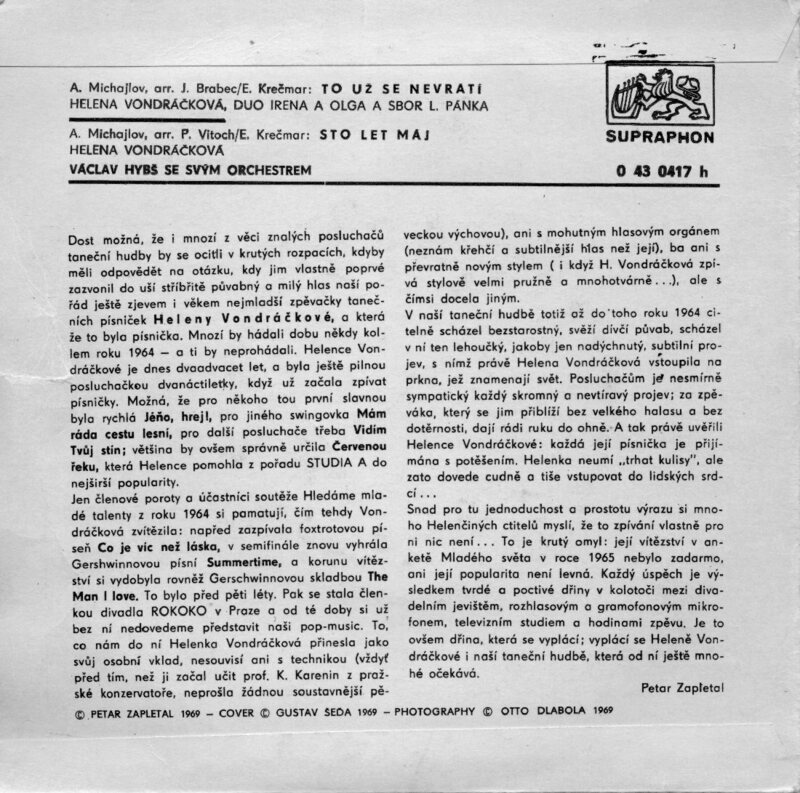 The single containing two classical Karel Svoboda compositions the hit "Vzdaleny hlas" (Distant voice) and "Posledni prazdniny" (The last holidays). The single was released with two different covers. The single entered the Czechoslovakian single chart in December 1967 at #6. 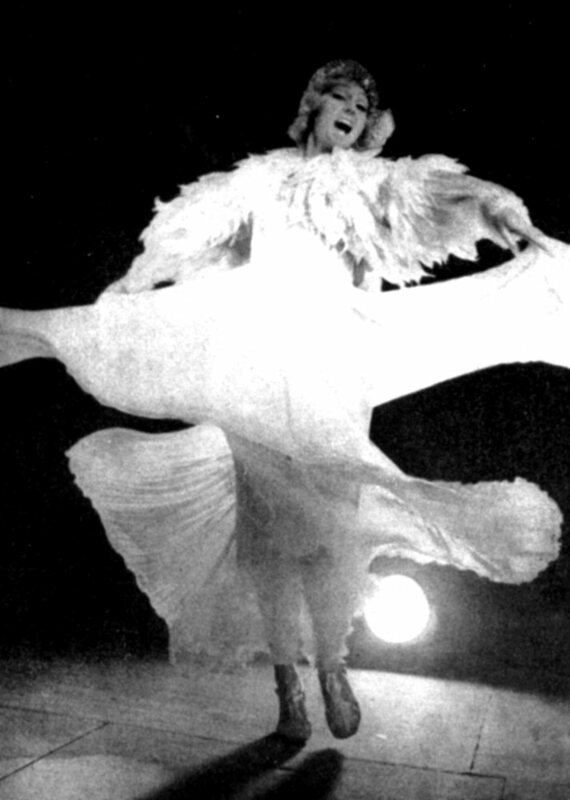 Another Helena single "Ruze kvetnou dal" (L'important c'est la rose) originally performed by Gilbert Becaud topped the chart at the same time. 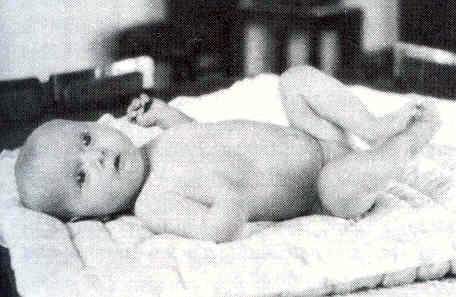 Jan Schneider was born in 1934 in the beautiful city of Tabor. The first steps as a poet he took in... Poland and France where he worked as journalist and translator in 1956. 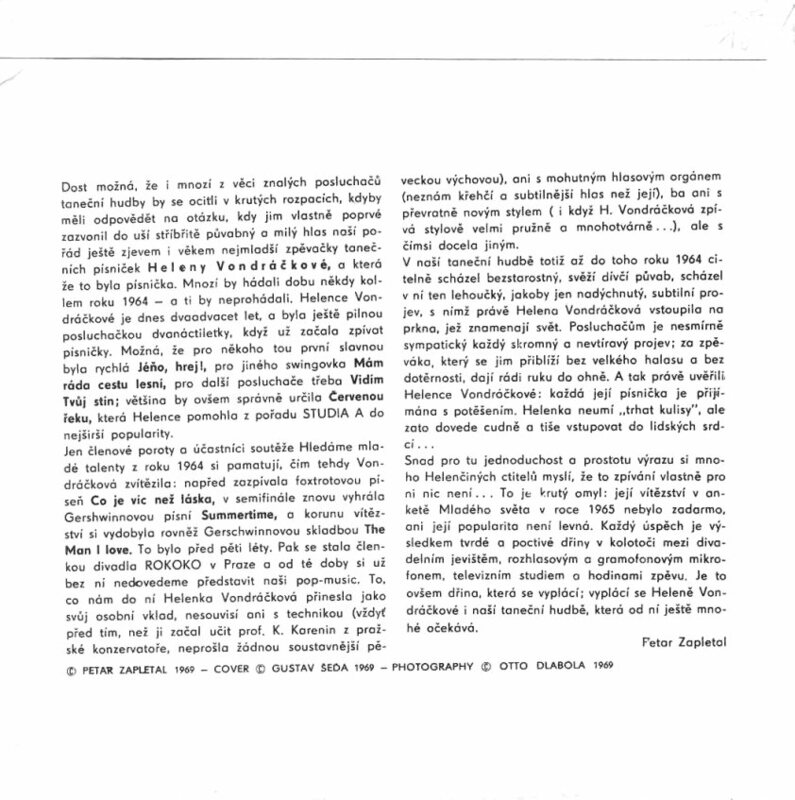 The first works published in Czechoslovakia were for the paper "May and culture". 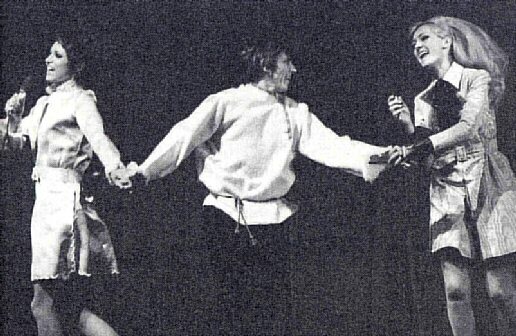 At the beginning of the 1960s he started collaboration with the famous theatre "Semafor" in Prague and one year later with the theatre "Rokoko". He worked with various theatres in Czechoslovakia and it made possible to meet Marta Kubisova who by that time performed at the theatre "Stop" in Pardubice. In Plzno Schneider met another talented singer - Vaclav Neckar. Both Kubisova and Neckars came finally to Prague to the Schneider theatre "Rokoko". 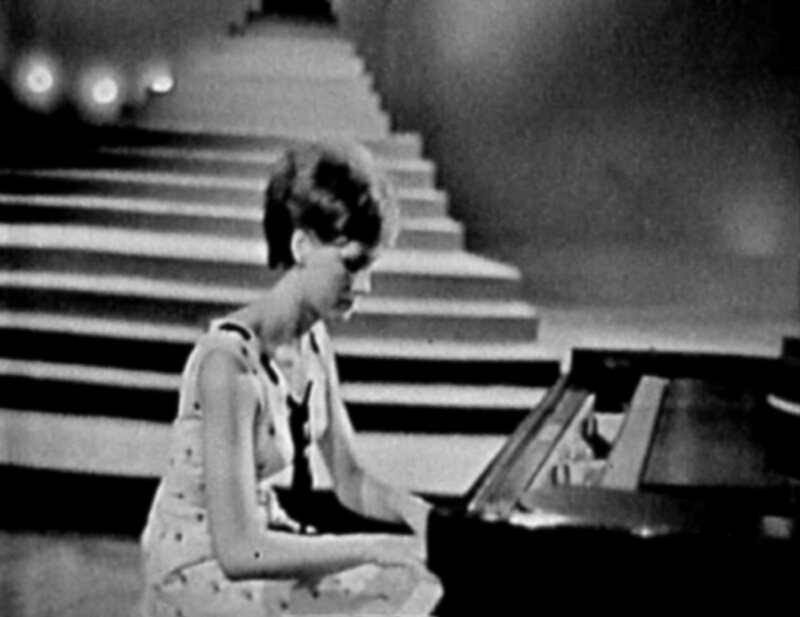 Even Helena Vondrackova joined them after winning the talent competition in 1964. Vondrackova, Kubisova and Neckar were at the beginning three solo artist on their own rights before they started the group "Golden Kids". 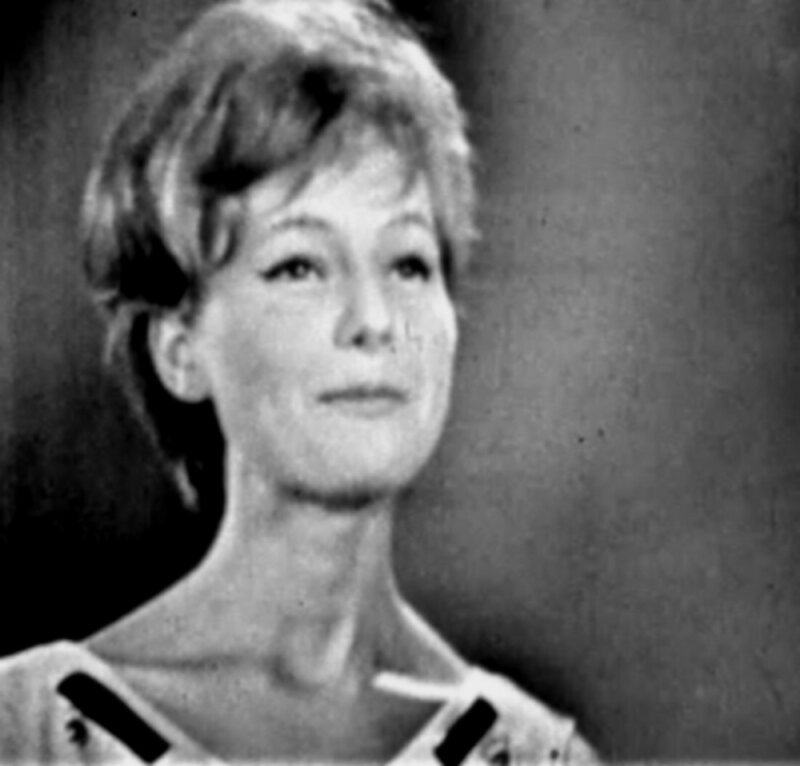 During the first period of 1964-69 Jan Schneider wrote lyrics to about 11 songs recorded by Vondrackova. 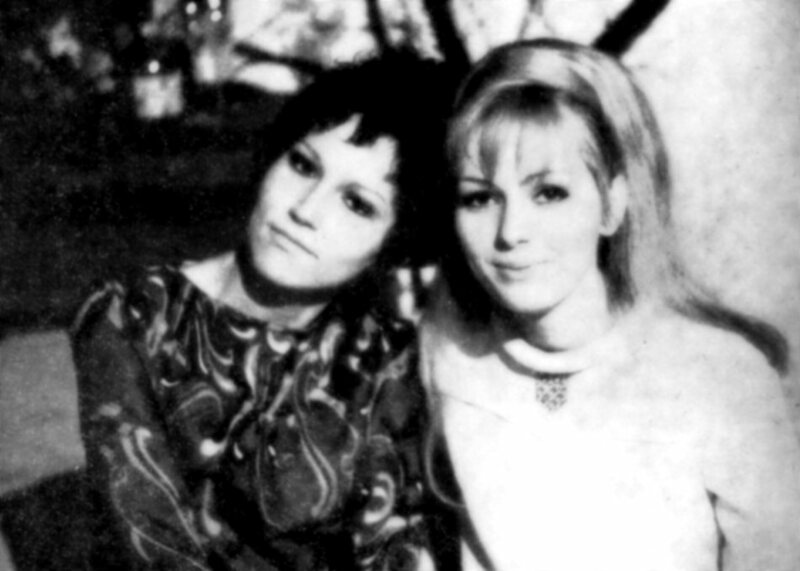 Even one of the biggest hits ever recorded by Vondrackova and Kubisova "Oh baby baby" was written by Schneider as well as another smash hit "Hribe" performed by Vondrackova and Neckar. Schneider is still working with his old pals Kubisova and Neckar. The latest big collaboration with Kubisova was a whole album with Jan's "small stories" which has even its stage version at the theatre "Ungelt" in Prague. 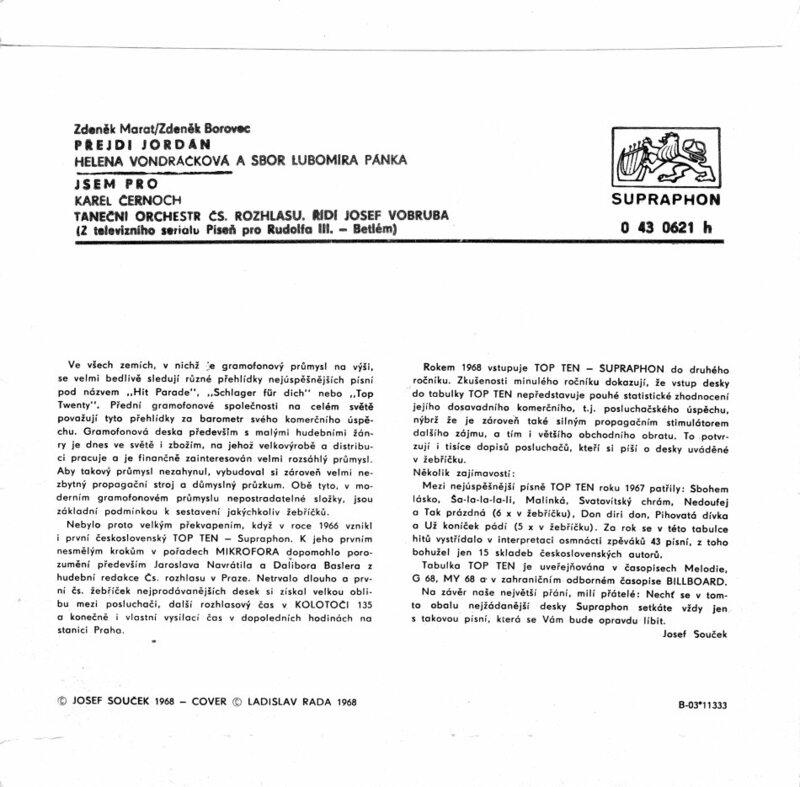 In 1967 the Czechoslovakian TV started a very popular musical series "Pisen pro Rudolfa III" (The song for the king Rudolf III) where the most popular Czechoslovakian artists performed their latest hits. Among the biggest pop stars there was already established Marta Kubisova and 20-year-old Helena Vondrackova. 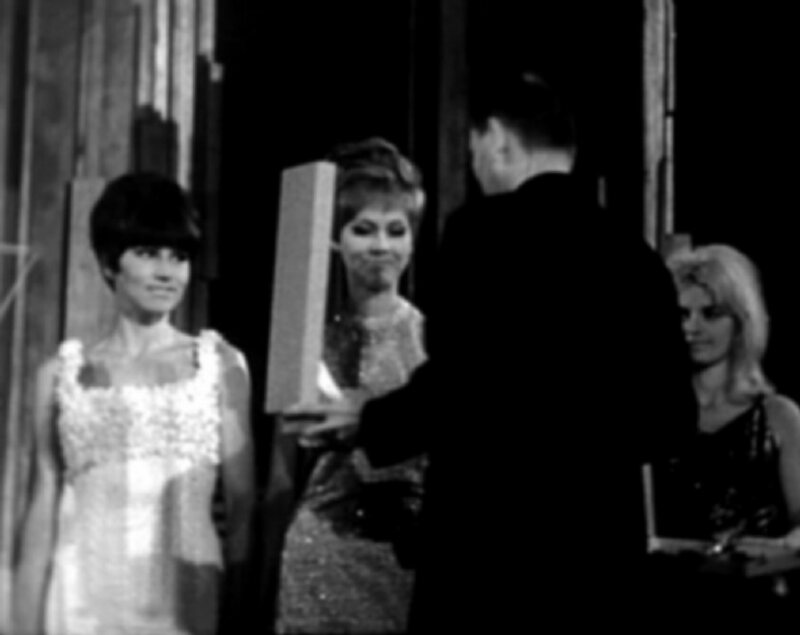 The series were broadcasted until August 1968 when the Russian troops entered Prague. 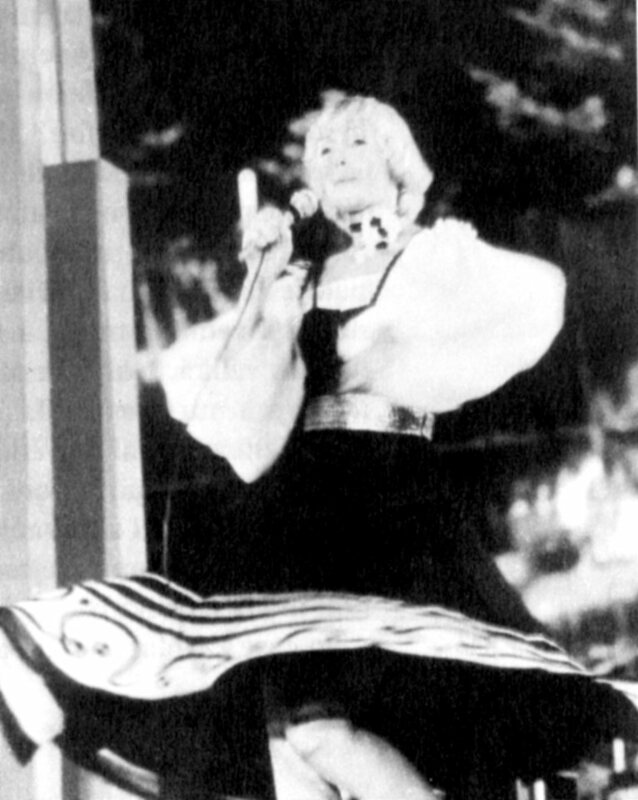 In the first show entitled "The Chair" Helena performed one duet together with Waldemar Matuska. At the beginning of the year Helena together with other Czechoslovakian artists represented the country on the record company fair MIDEM in Cannes. Helena performed two songs solo (Cink Cink and French language version of Vzdaleny hlaz (Distant voice). Together with Kubisova and Neckar Marta sang two more songs which were warmth welcome by the audience. 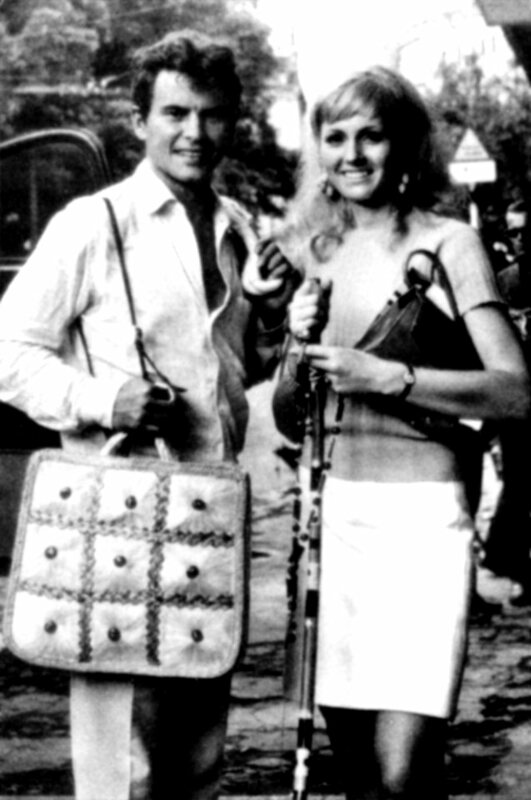 On 1 April 1968 Helena, Marta Kubisova and Vaclav Neckar left Prague for Paris. 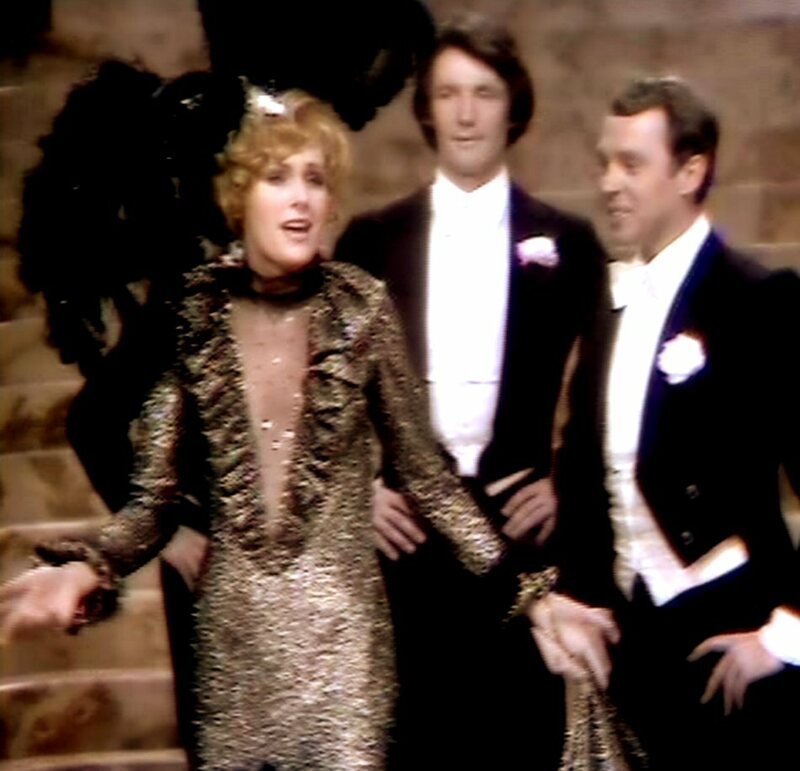 The trio would appear within a bigger show with a 20-minute-performance including three solo songs each and two songs sung by all three of them. They performed as three artists on their own rights and not as a group. 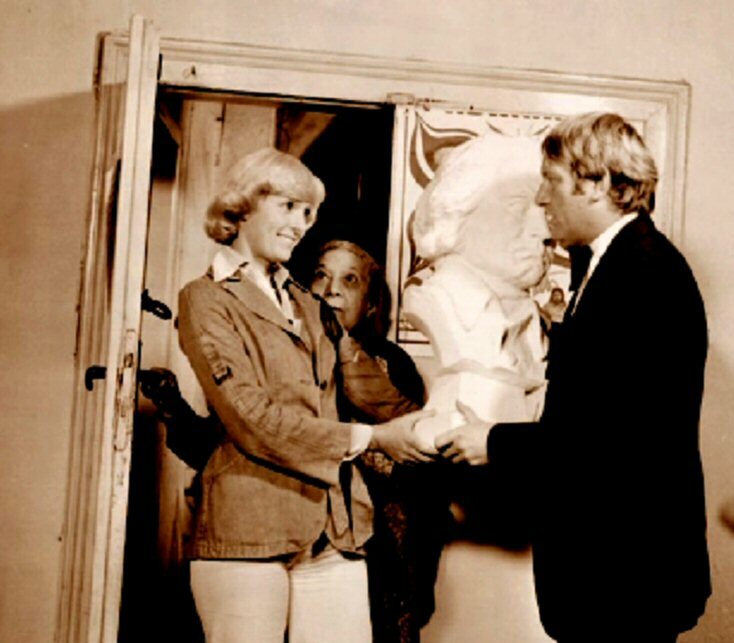 The stay in Paris was a great time for three young people from Czechoslovakia. 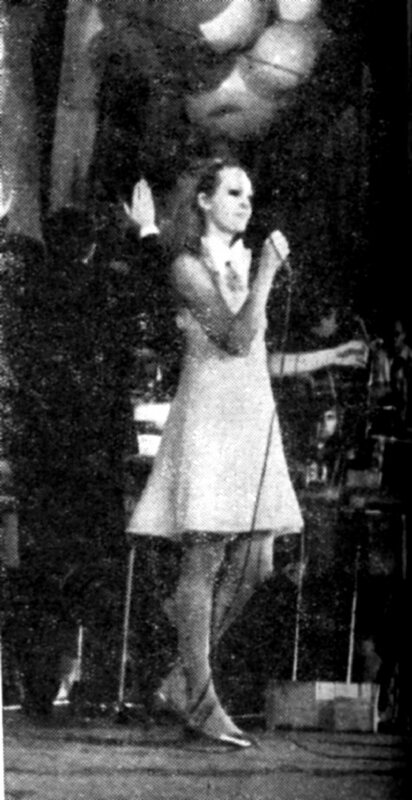 Helena participated in the International Festival of pop songs "Bratislavska Lyra" in the capital of Slovakia - Bratislava in the summer 1968. 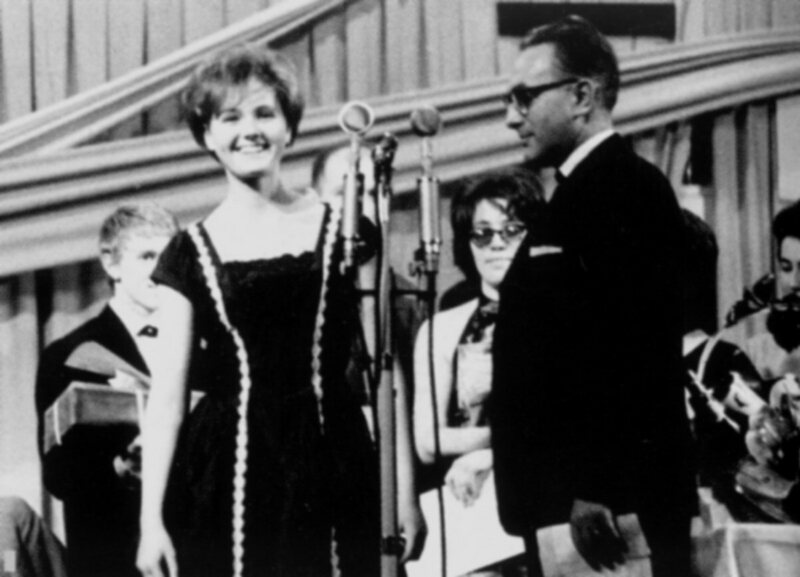 Helena performed together with Waldemar Matuska "To se nikdo nedovi" (Nobody will know) and took the second prize. The first prize went to Marta Kubisova. 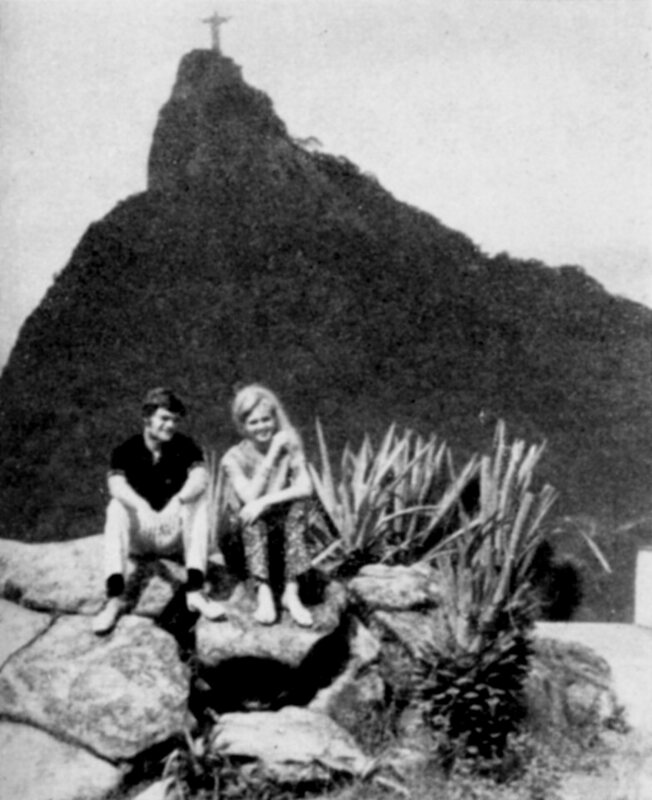 Two big hits performed by the future members of Golden Kids were released as a single in 1968. 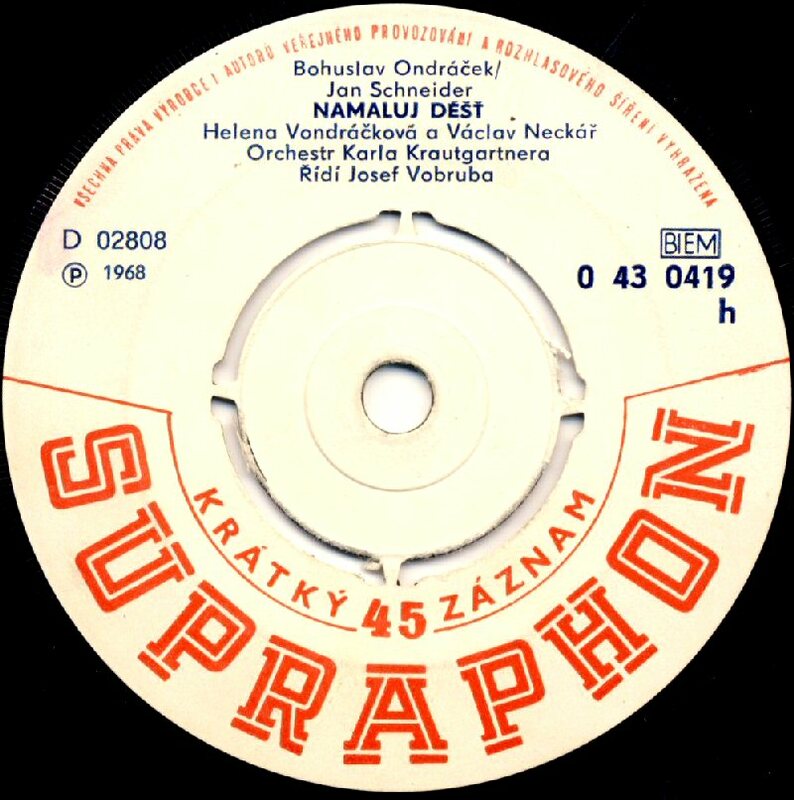 The composition on the A-side "Namaluj dest" (Paint the rain) was performed by Helena together with Vaclav Neckar and the song on the B-side featured Helena and Marta Kubisova duet "Hej, pane Zajicii". 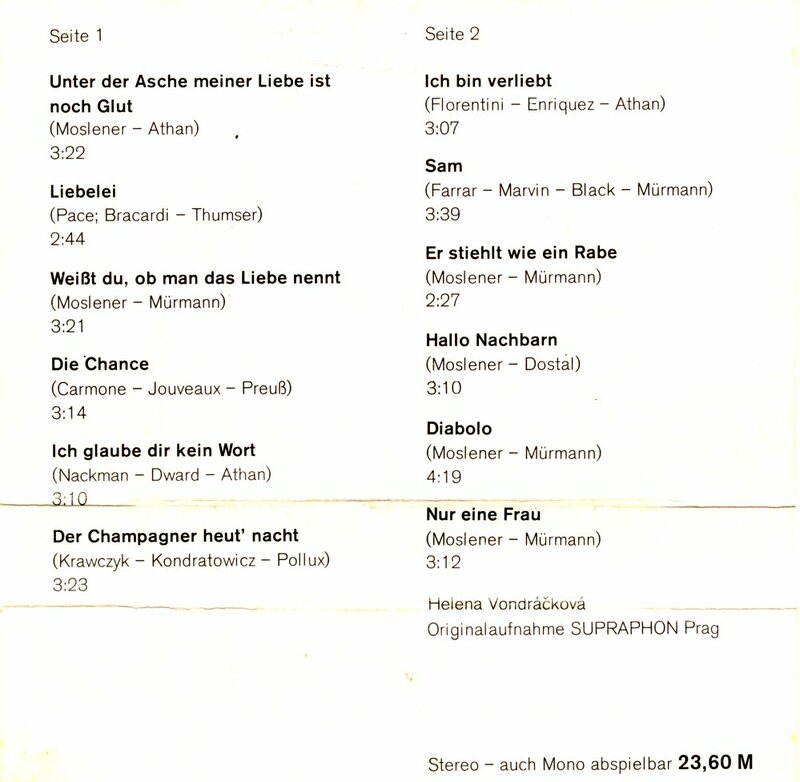 Lyrics to the both songs had been written by Jan Schneider and the music by Bohuslav Ondracek. 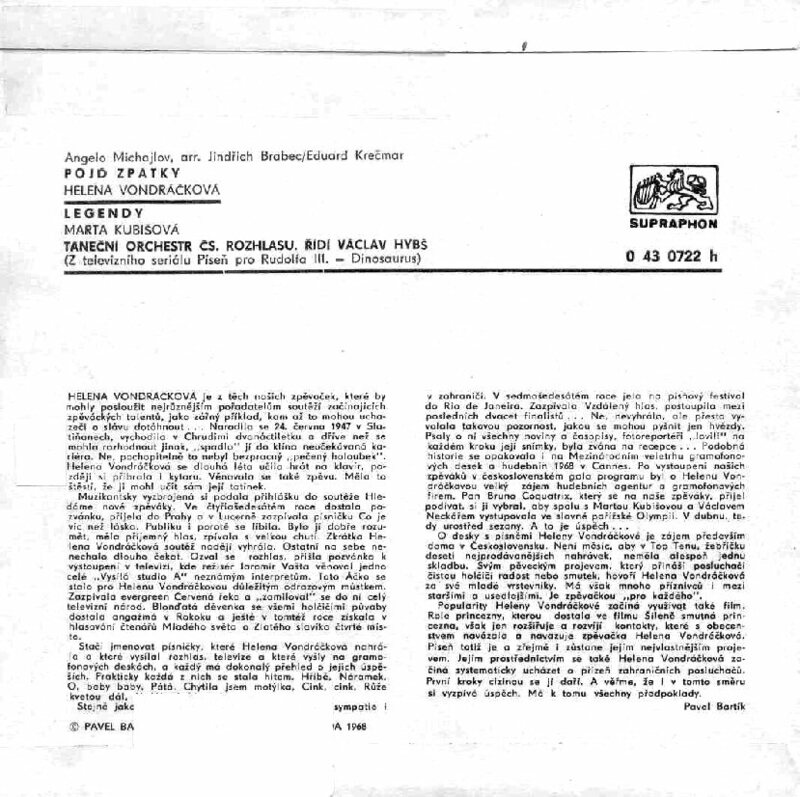 The single was re-released in 1969 with different cover. A new single featured two songs performed by Helena solo: "To uz se nevrati" (It won't come back) and "Sto let maj" (Hundred years). The songs were not available on any LP and came out first time on CD in 1997 in the series "Helena Remasters". The single would be re-released in 1969. In the summer Helena invited her collegue Marta Kubisova to her family home in Slatiniany where they could relax some days together with Helena's family. During the stay there were taken many pictures of Marta and Helena. 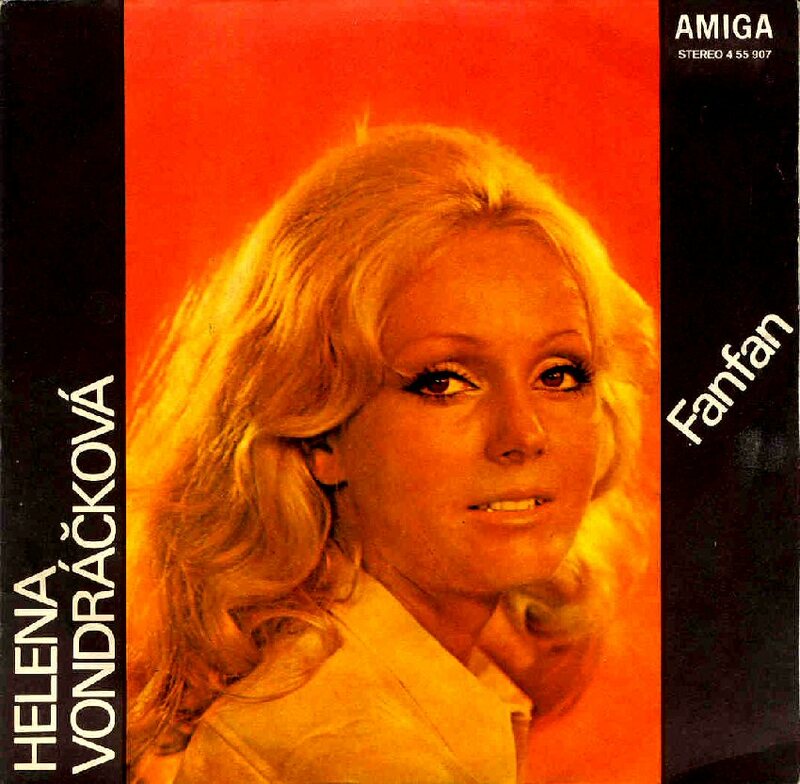 Helena loves Italian songs and during her long career she recorded many of them both in Czech and Italian. 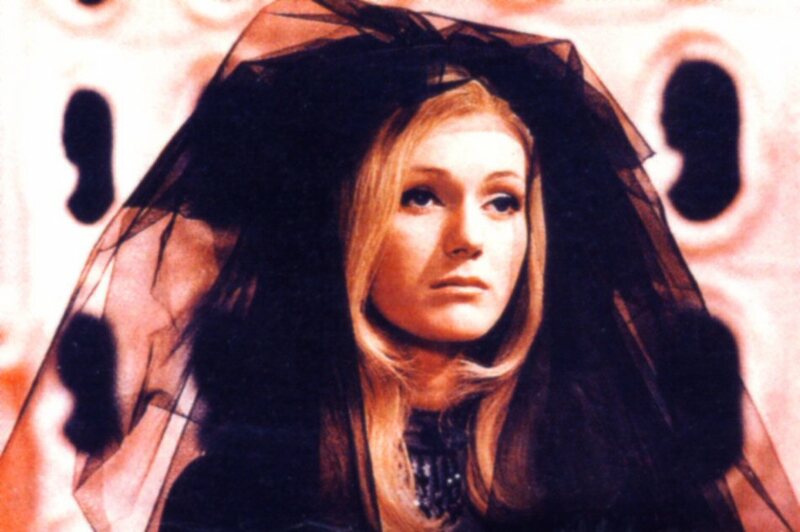 One of the first cover versions made in 1968 was the song "Utikej" (Run away) which was originally entitled "Gli occhi miei" and performed on the Sanremo Festival in Italy at the beginning of February 1968 by the Italian singer Wilma Goich. 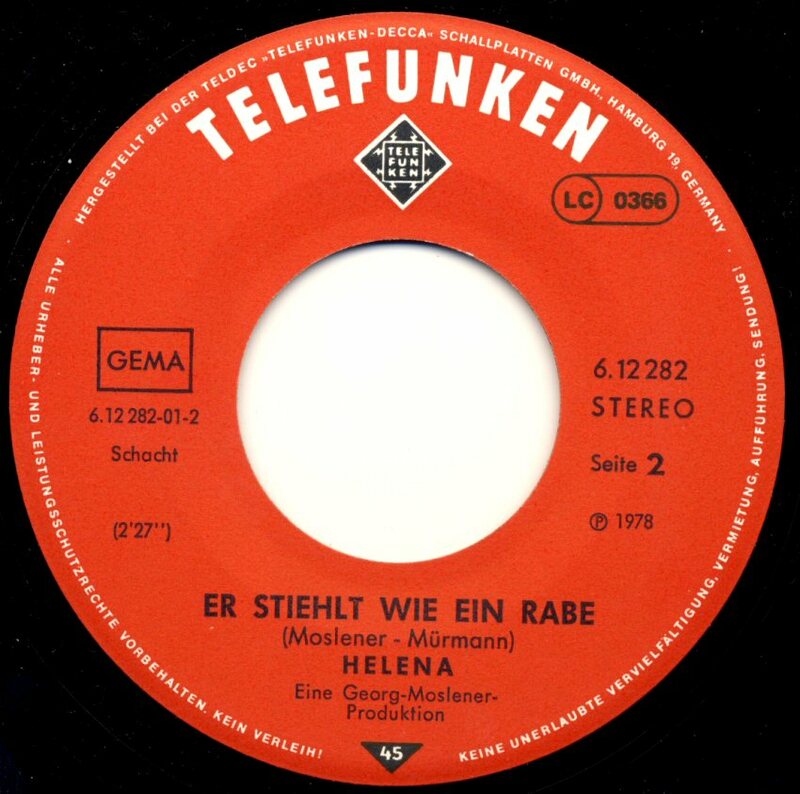 Helena started her career in West Germany already in 1968 when Polydor released her single "Frag' nicht". 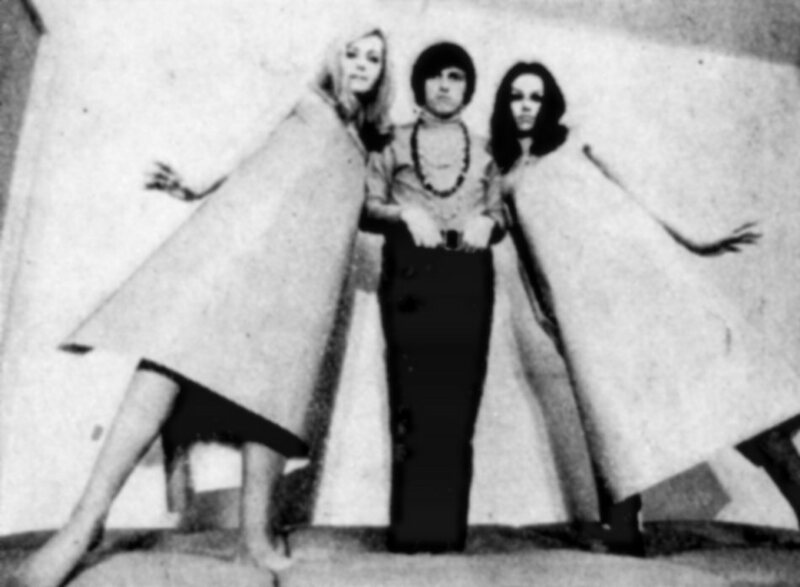 Helena, Marta and Vaclav Neckar were by that time the absolute biggest artists in Czechoslovakia and there was a certain interest for them in West Europe. 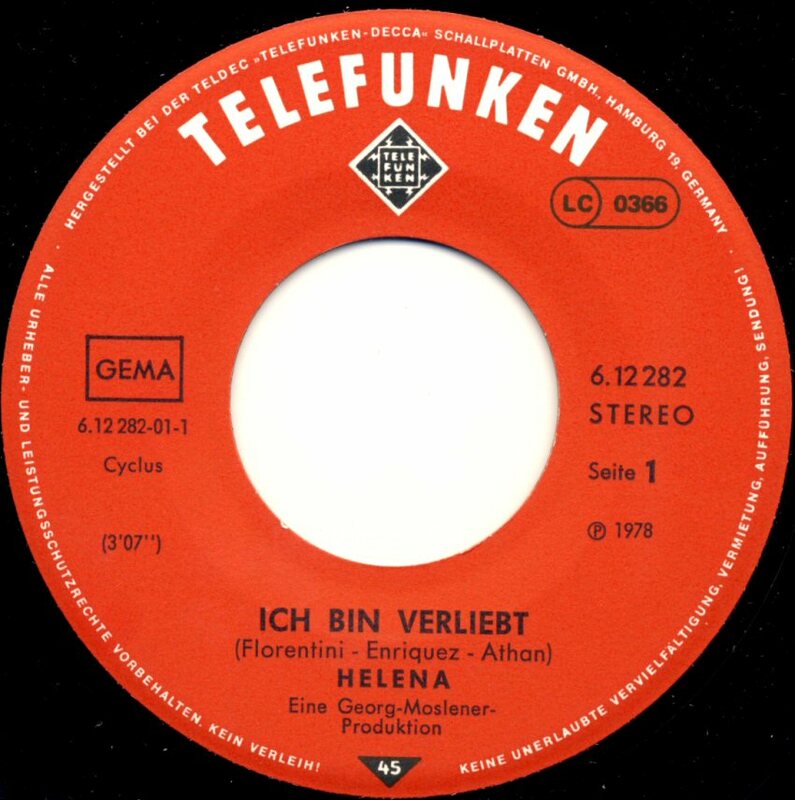 Helena would release several singles and two albums in West Germany during the 1970s. 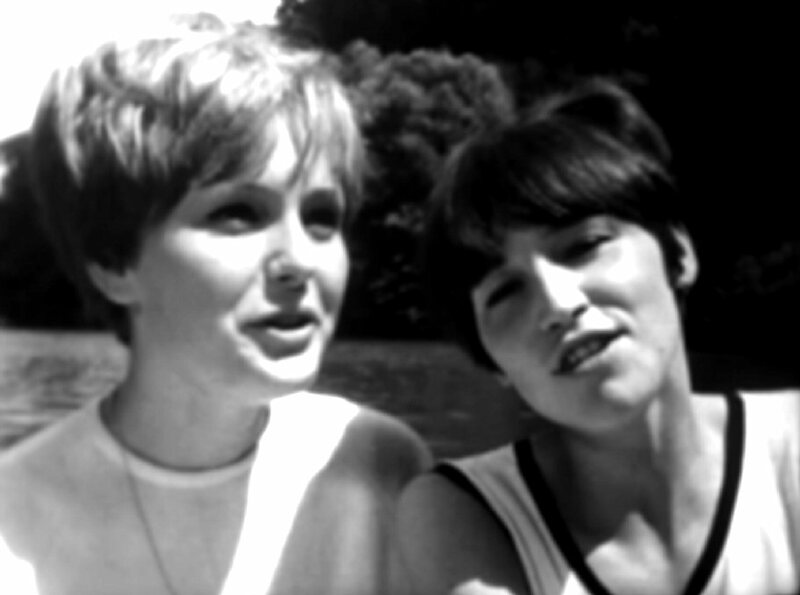 A videoclip for "Frag' nicht" was filmed in Prague. 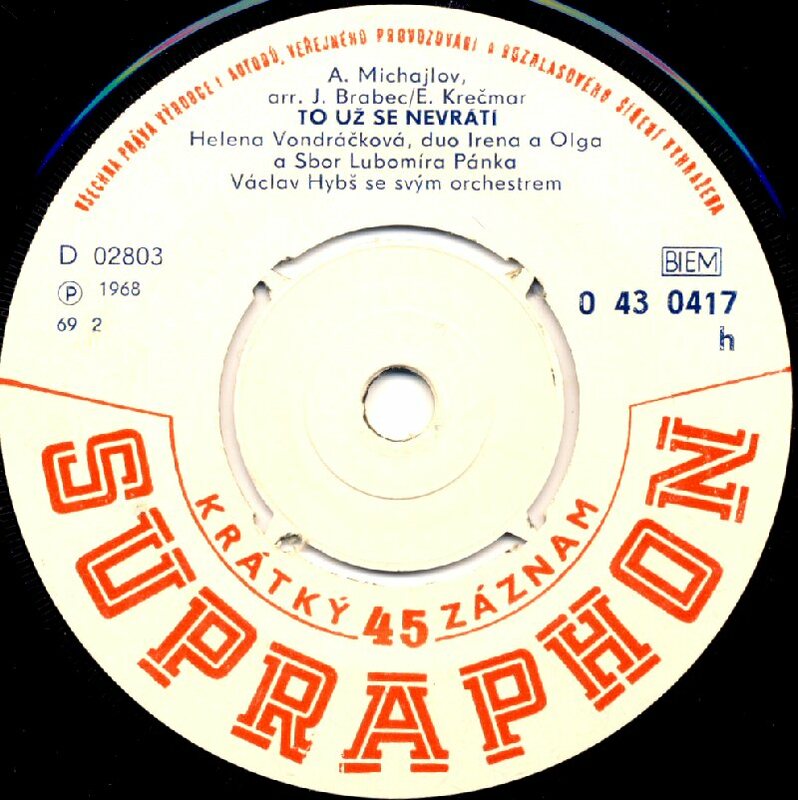 The hit from the Bratislava festival - "To se nikdo nedovi" (Nobody will know) performed together with Waldemar Matuska was released as a single in Czechoslovakia in the summer 1968. 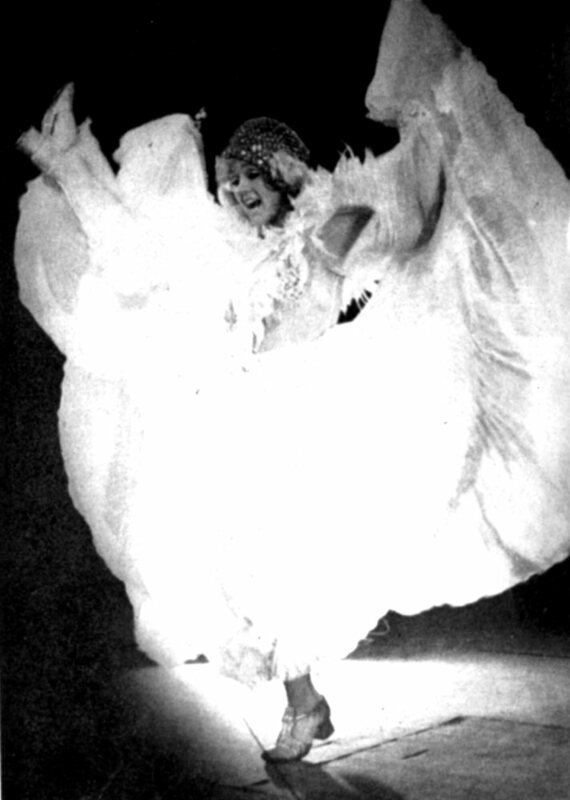 The song became a big hit for Helena. 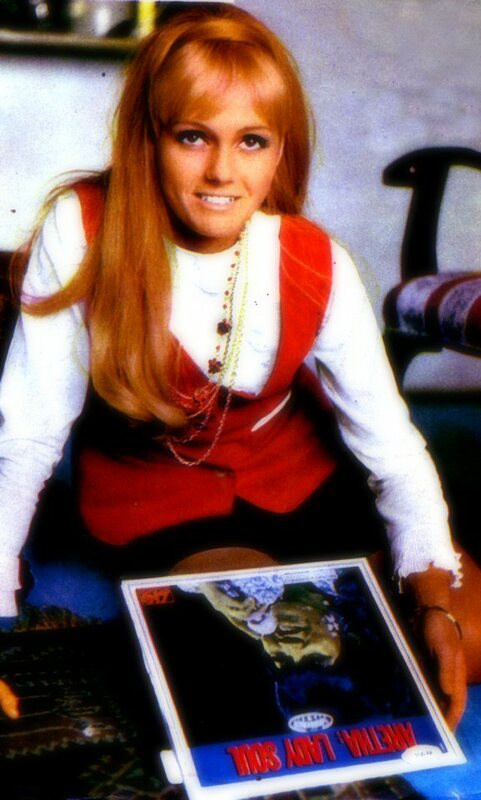 On 1 November 1968 she started together with Kubisova and Neckar the pop group called "Golden Kids". The group gained a great popularity from the very beginning. 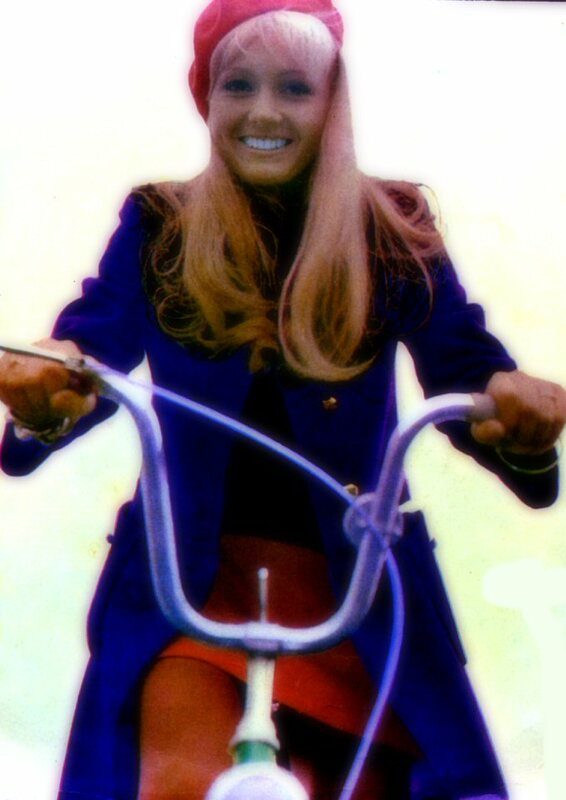 Golden Kids had several top hits in Czechoslovakia and even a certain interest for the group came from West Germany. 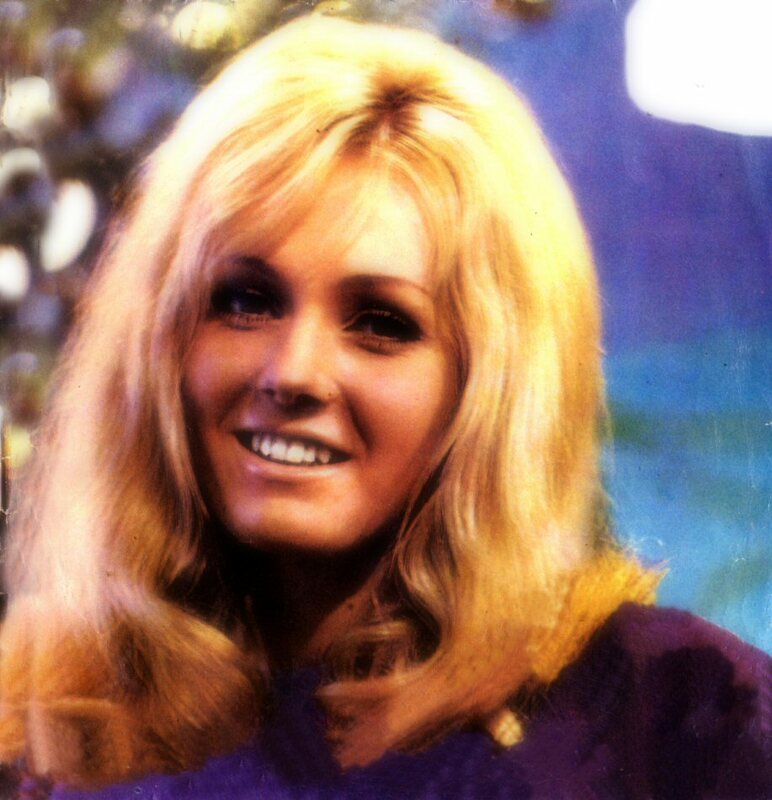 One of the biggest Helena hits from the early era - "Prejdi jordan" saw its single release on November 29, 1968. The single saw its release with two different covers. It was even re-released in 1969. 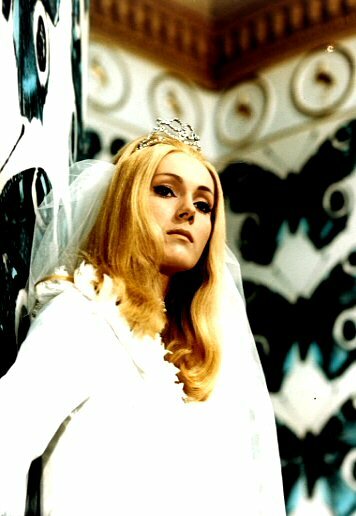 The song was featured in the TV series "Pisen pro Rudolfa III" (The song for the king Rudolf III) which was aired during 1968-1969. 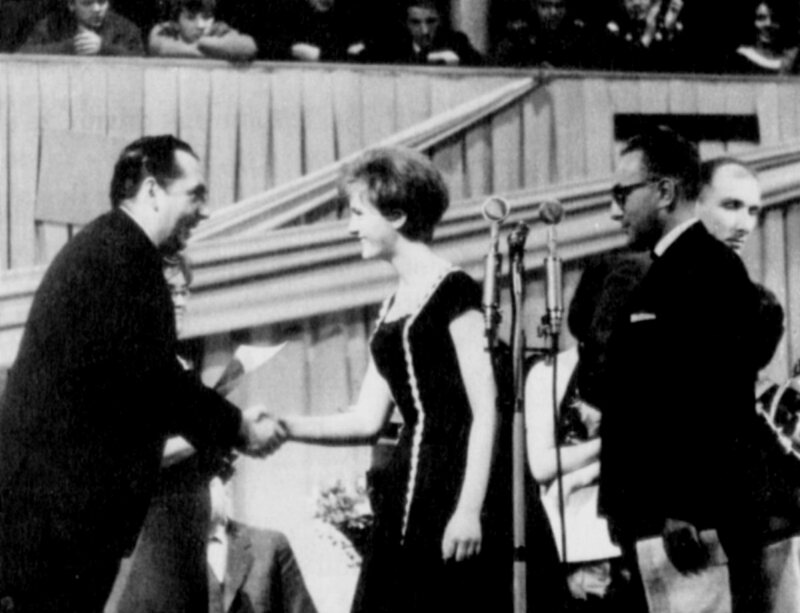 The music prize "Golden Nightingale 1968" gala was held at Lucerna in Prague in December. 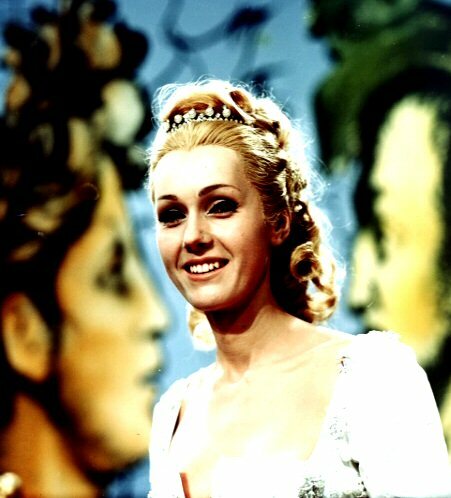 Helena became the third most popular singer in Czechoslovakia in 1968 and she performed on the gala. 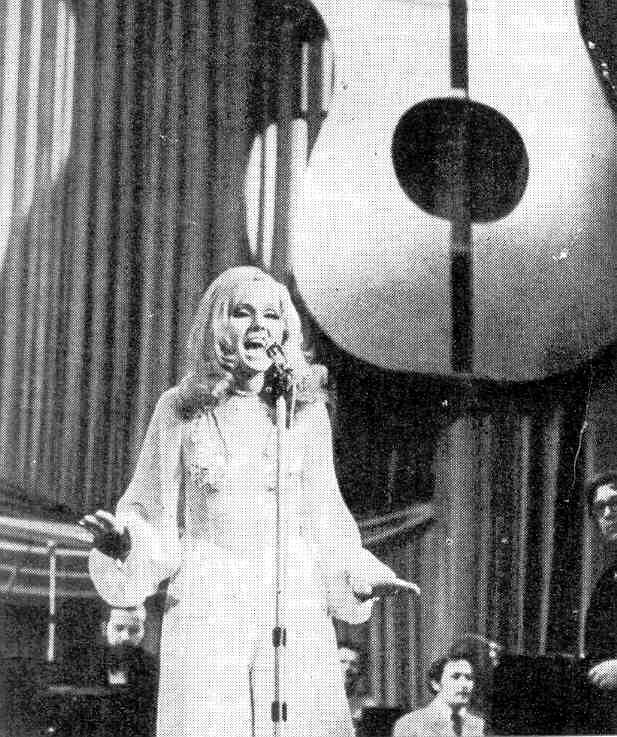 The very first Helena TV appearance in 1969 took place on 1 January in TV show "Gramo hit" which presented the greatest hits in Czechoslovakia in 1967 and 1968. Helena released the single "Jdi o dum dal" (Go to the next house) b/w "Vladce nasich dni" . 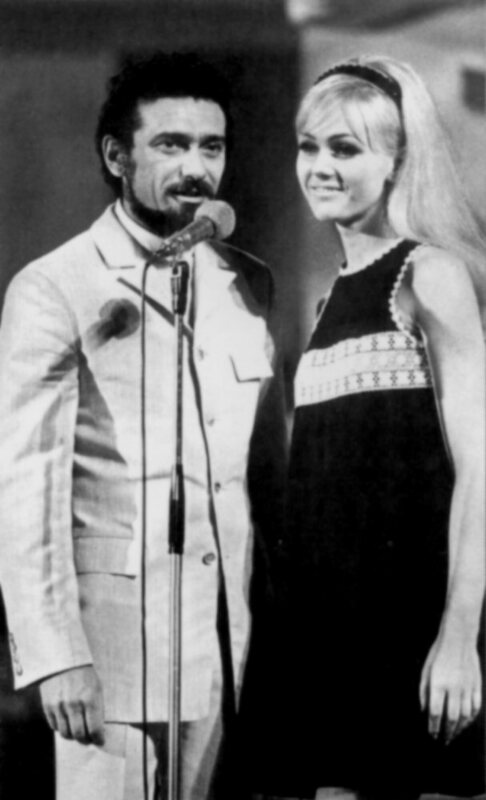 The latter song was Czech language version of Jerry Ragovoy's hit "What`s It Gonna Be" covered even by Dusty Springfield in 2000. 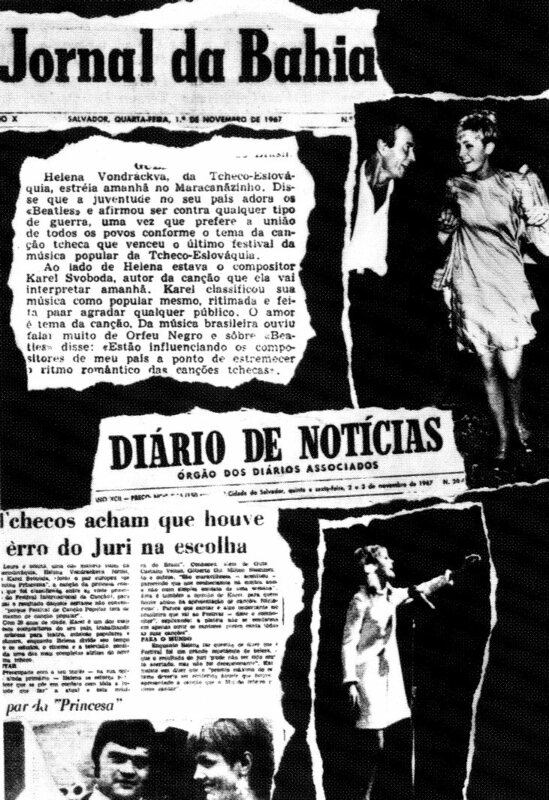 Helena was featured in the magazine "Kvety" on February 22nd, 1969. 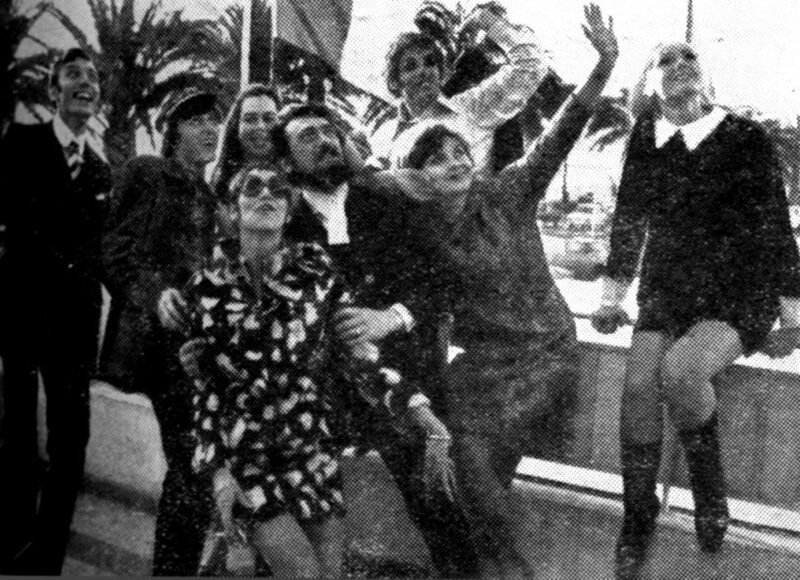 The Golden Kids were the absolute highlight on the Festival MIDEM in Cannes in 1969 and were invited to Paris for several performances at Olympia. 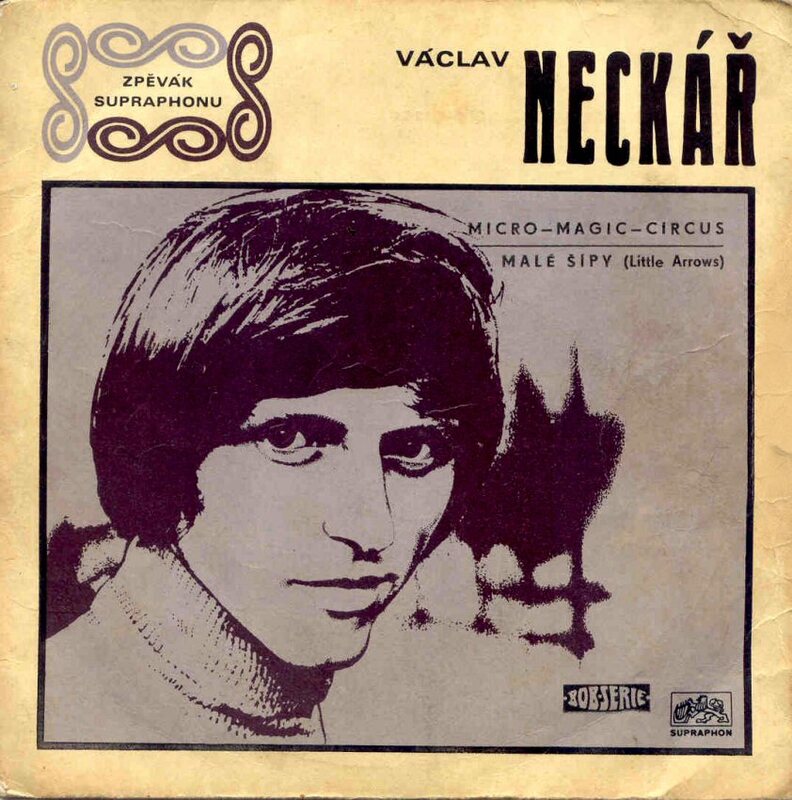 The Golden Kids' hit "Micro-Magic-Circus" was released as Vaclav Neckar single in 1969. The first Golden Kids album was entitled "Micro Magic Circus" and it saw its release in 1969. 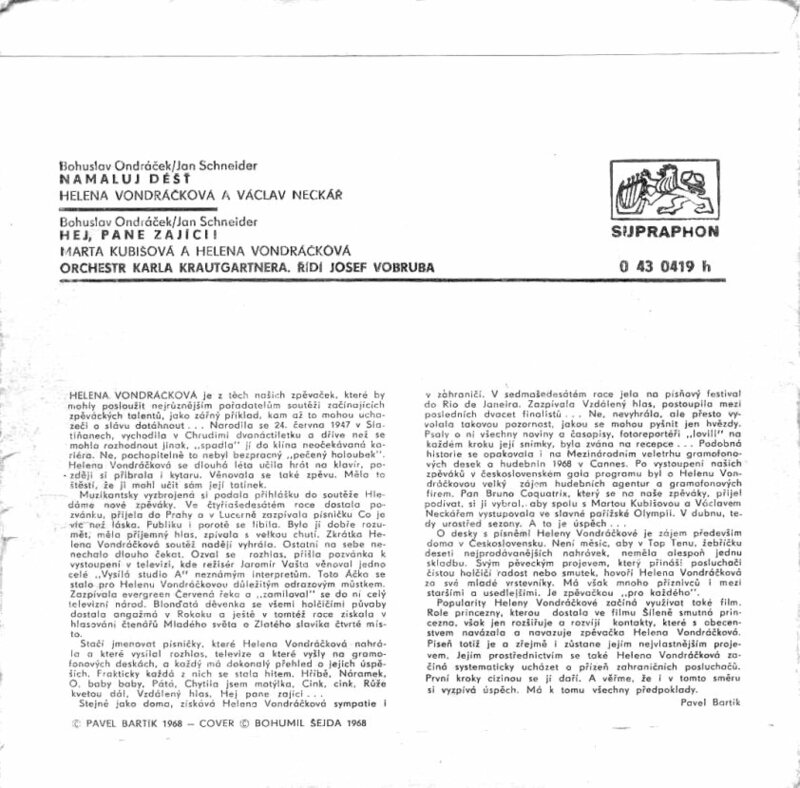 The album contained 14 songs performed by Helena, Marta and Vaclav. Helena had lead vocal on 4 songs. 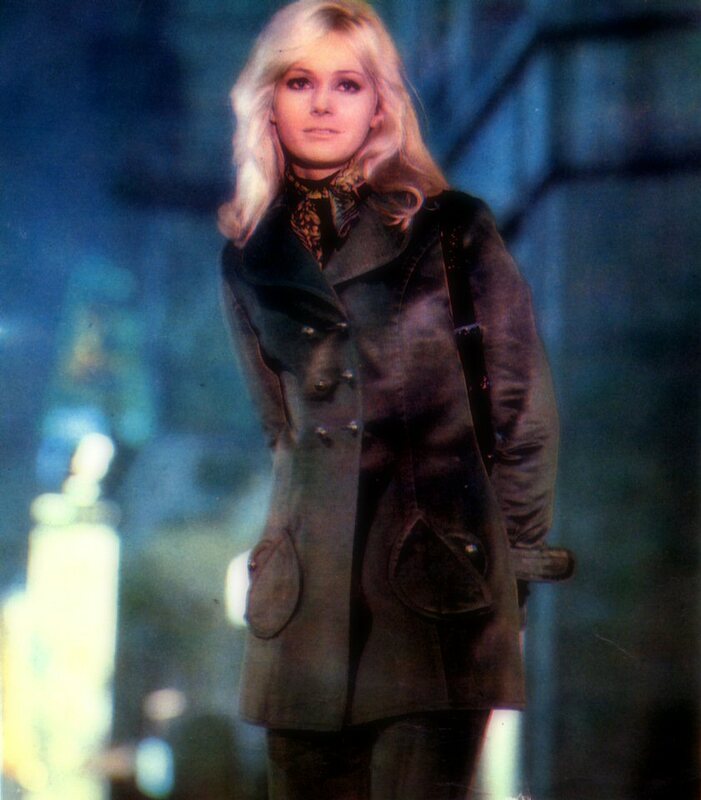 The album became very successful in Czechoslovakia and the group went out for international promotion. 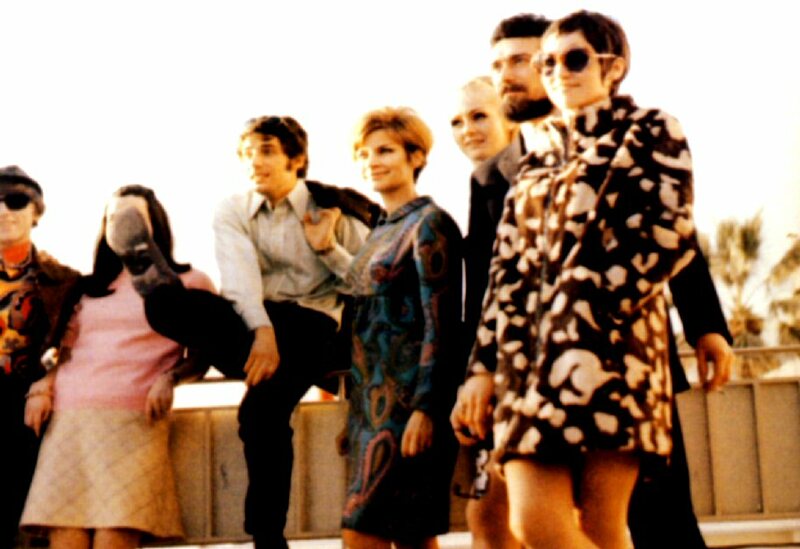 The classic Golden Kids photo session from the summer 1969. 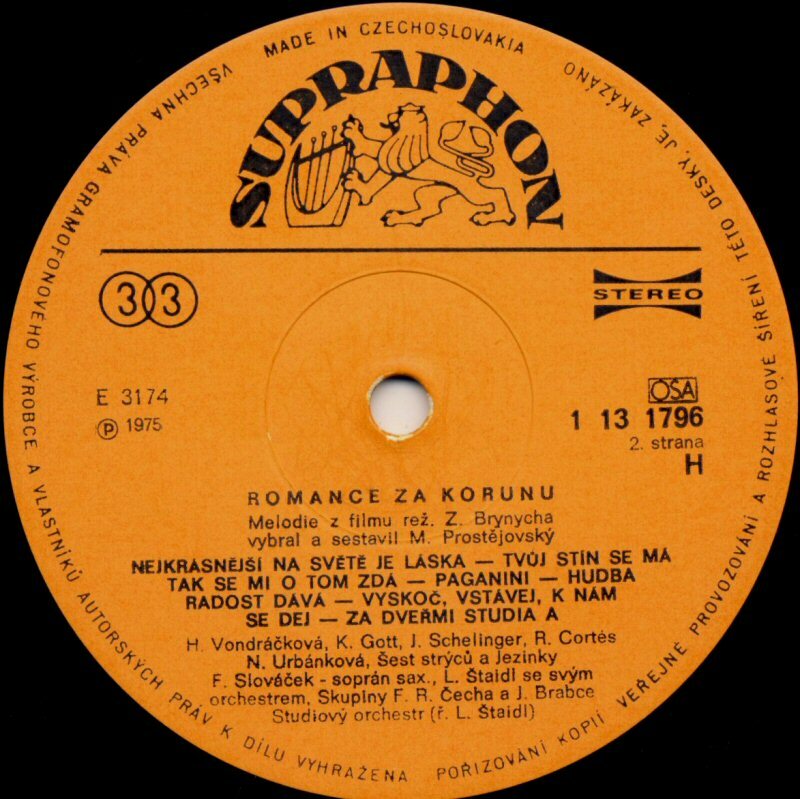 In 1969 the record company Supraphon released a single containing two songs from the TV series "The song for Rudolf III". On the side A there was Helena's song "Pojd zpatky" (Go back) and on the side B "Legendy" (Legends) performed by Marta Kubisova. 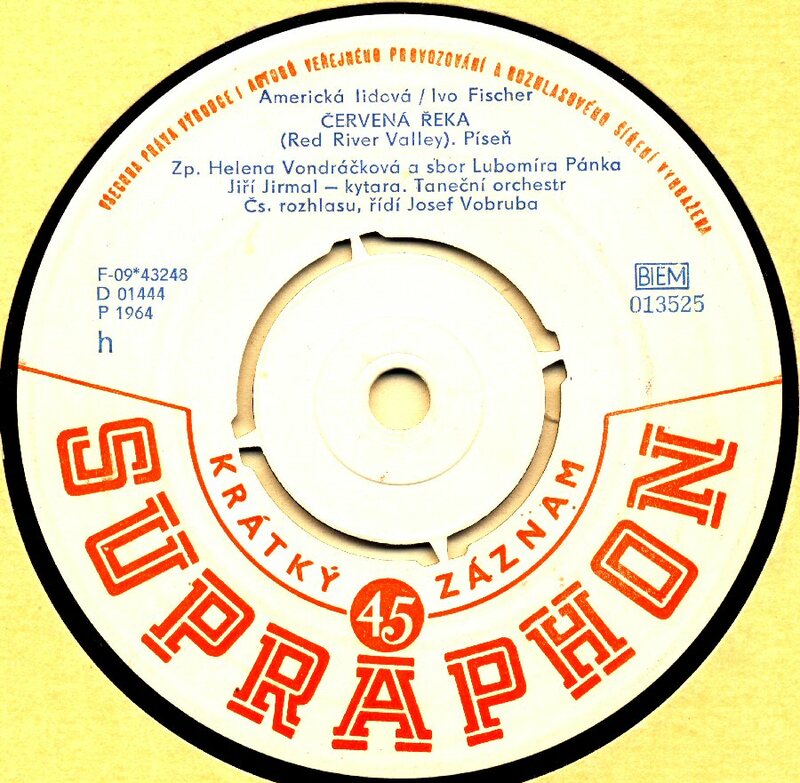 After 5 successful years with lots of hits the record company Supraphon released Helena's first album called "Ruze kvetou dál" - Czech title of the song "L'important c'est la rose" performed originally by French singer Gilbert Bécaud which was Helena's favorite song from the very beginning as she heard it for the first time. 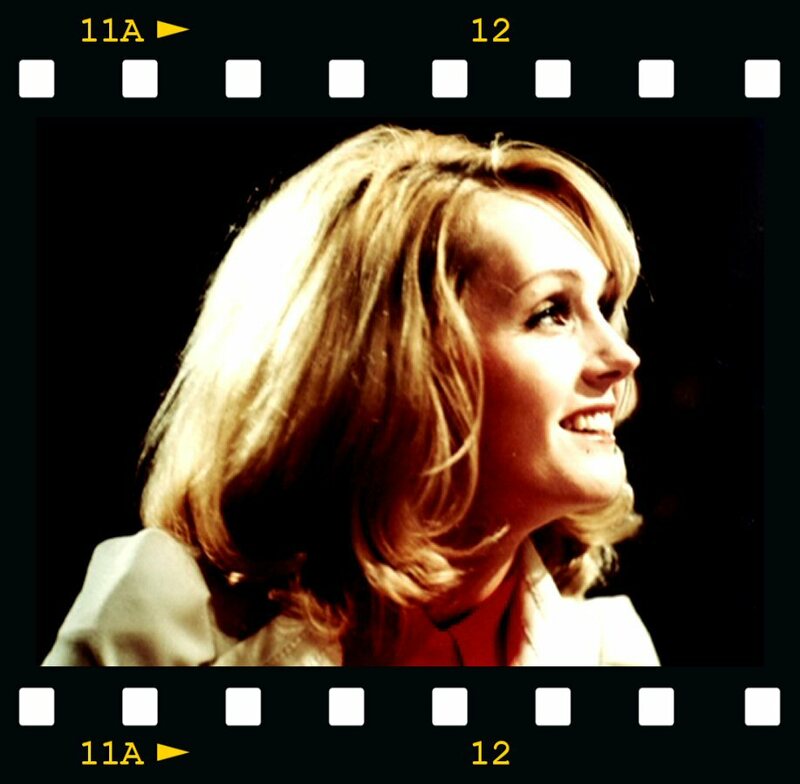 She did her own interpretation of the song which was included on the album among other well-known world hits as "Down Town", "Red River Valley", "I Only Want to be With You" and "They Say it's Wonderful". Totally the LP contained 13 songs. New single featured Golden Kids performing Bob Dylan's song "The Mighty Quinn" entitled in Czech "Pritel Quinn". 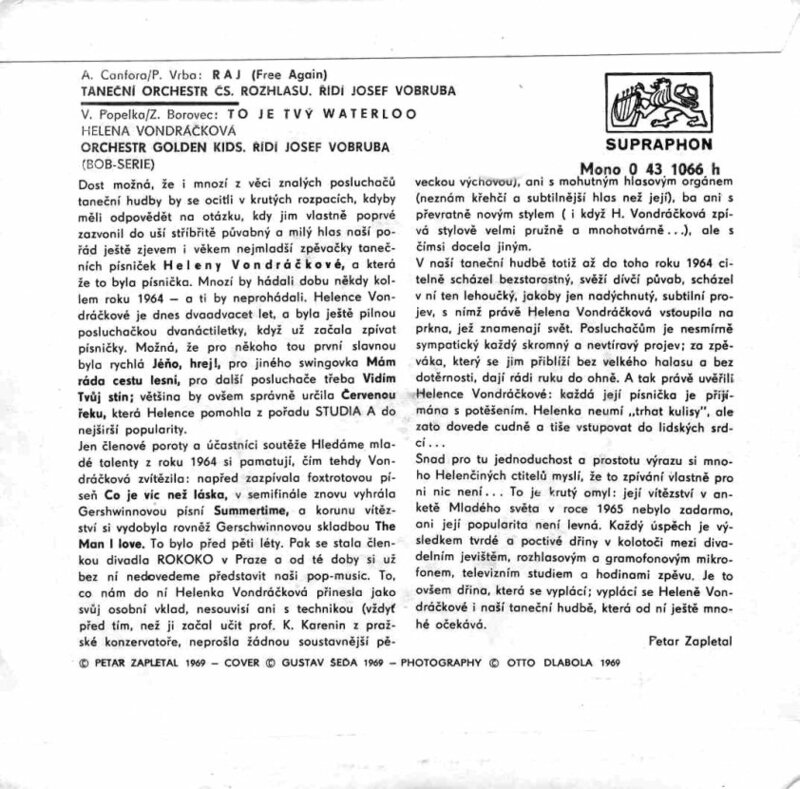 Side B contained a song "Zpev nas vezdejsi" performed by Helena with the Golden Kids band and choir. 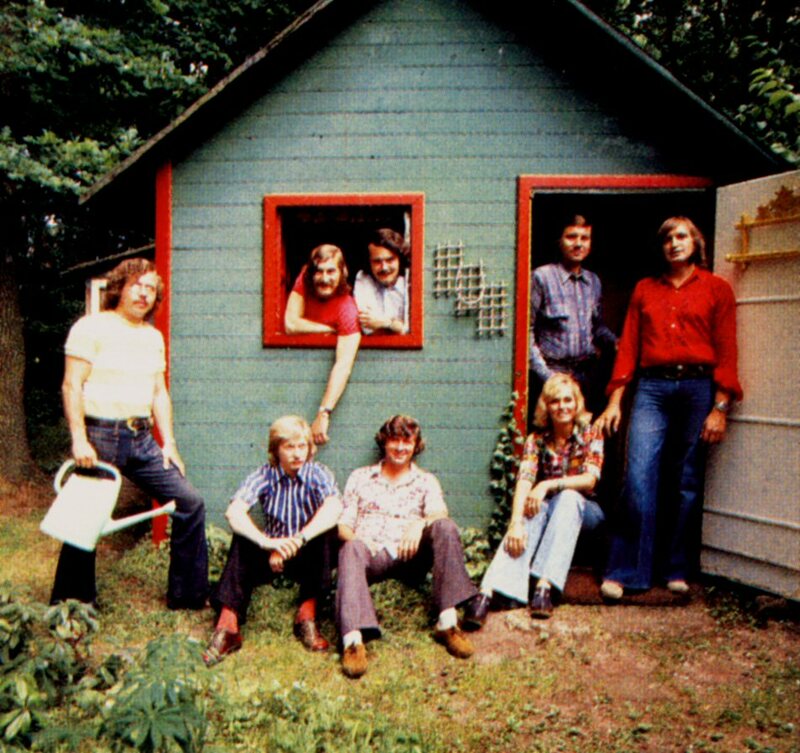 On 26 October 1969 Golden Kids recorded Czech version of a song written by internationally unknown Swedish composers Björn Ulvaeus and Benny Andersson entitled "A Flower in My Garden" with Helena's lead vocals. 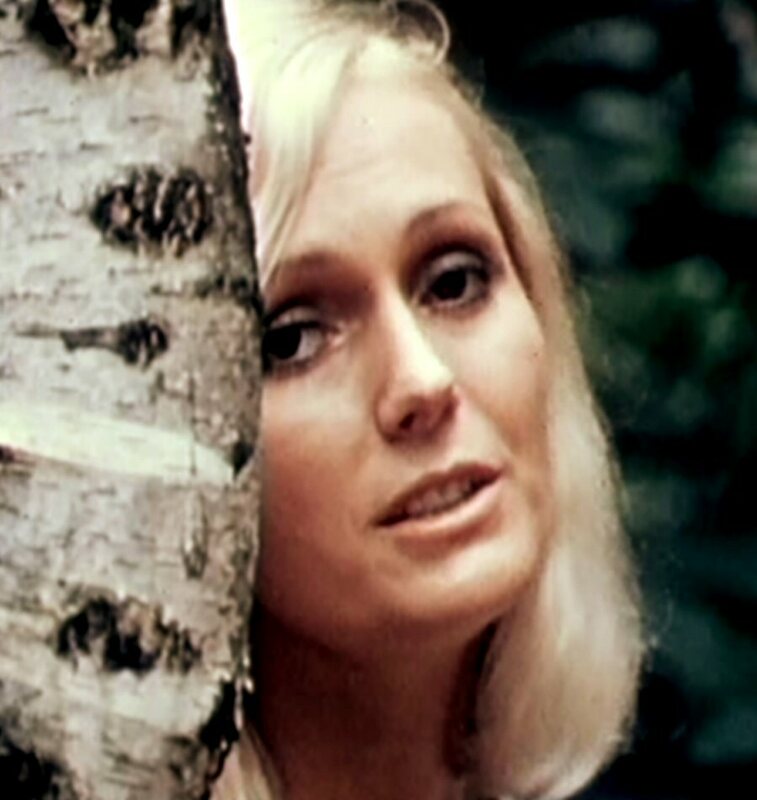 The funny thing is that the original version of this song had been recorded by Hep Stars with female lead vocal (Lotta Hedlund) almost precisely 1 year before on 29 October 1968. This was the very first time when Helena's and Björn's and Benny's paths crossed each other. The song would be released on Golden Kids' second and last album "1" at the beginning of 1970. 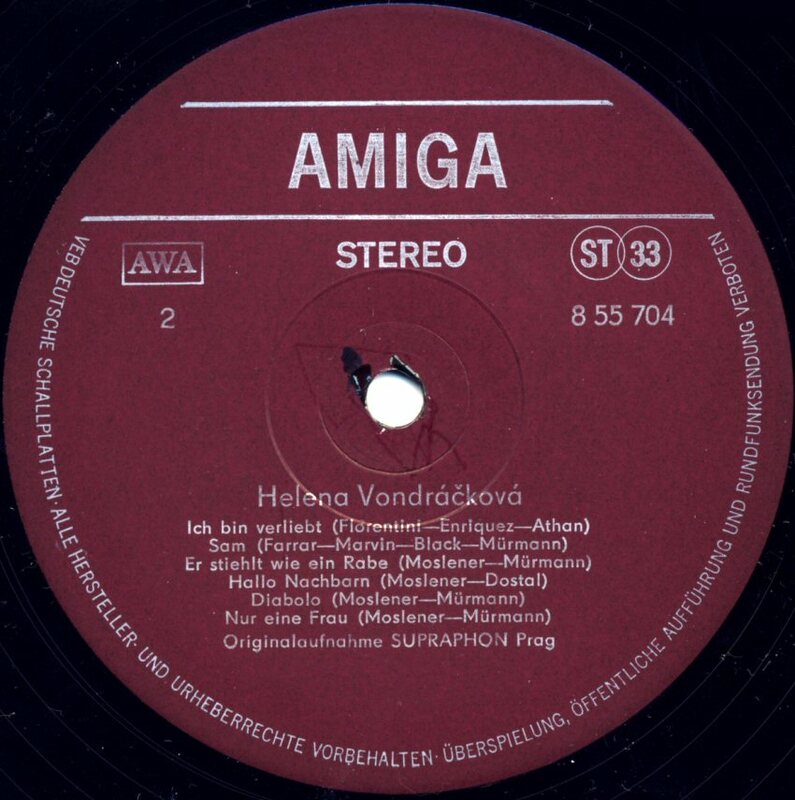 Strangely the song was credited only to Björn Ulvaeus on the LP cover. 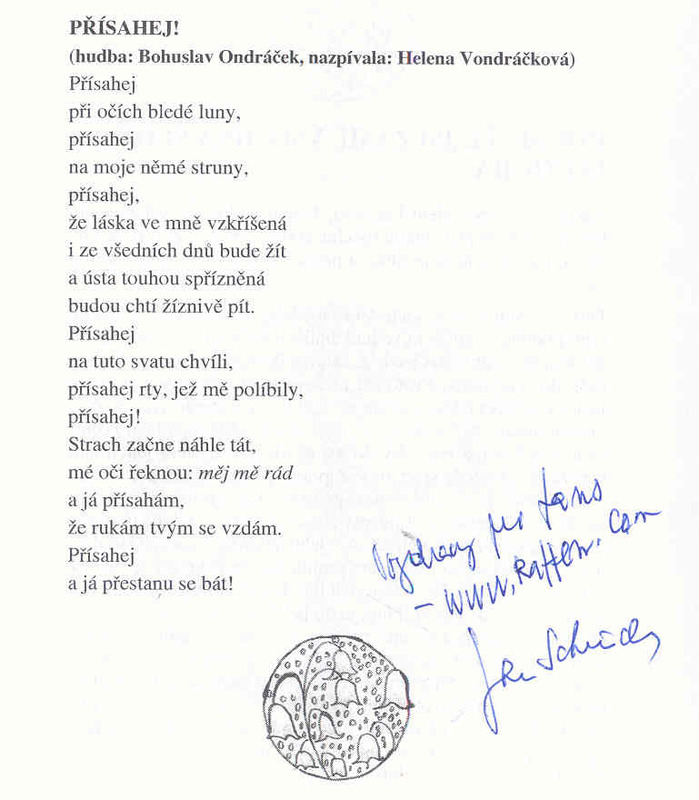 The Czech lyrics were written by Zdenek Borovec. 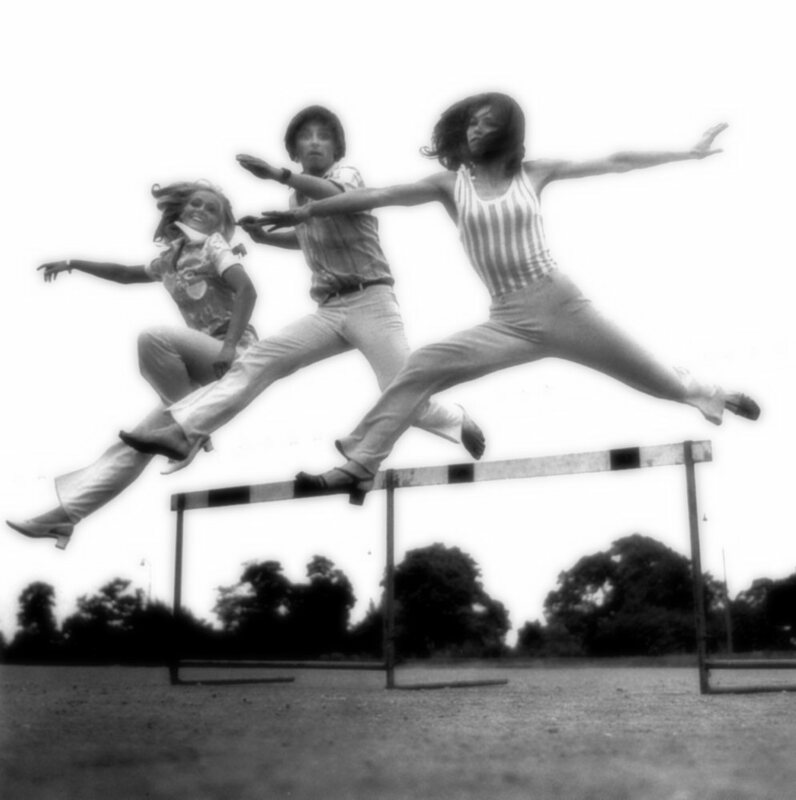 All the three members of Golden Kids released several solo singles in West Germany. 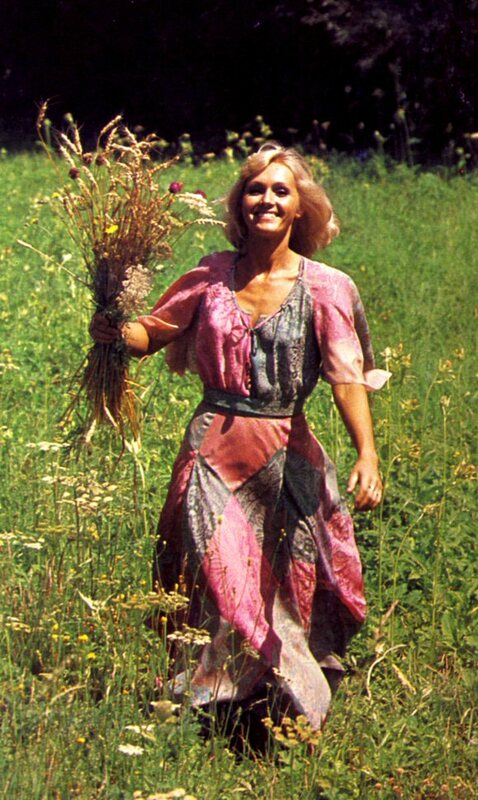 The most successful of them all was Helena who even released several albums in both West and East Germany. 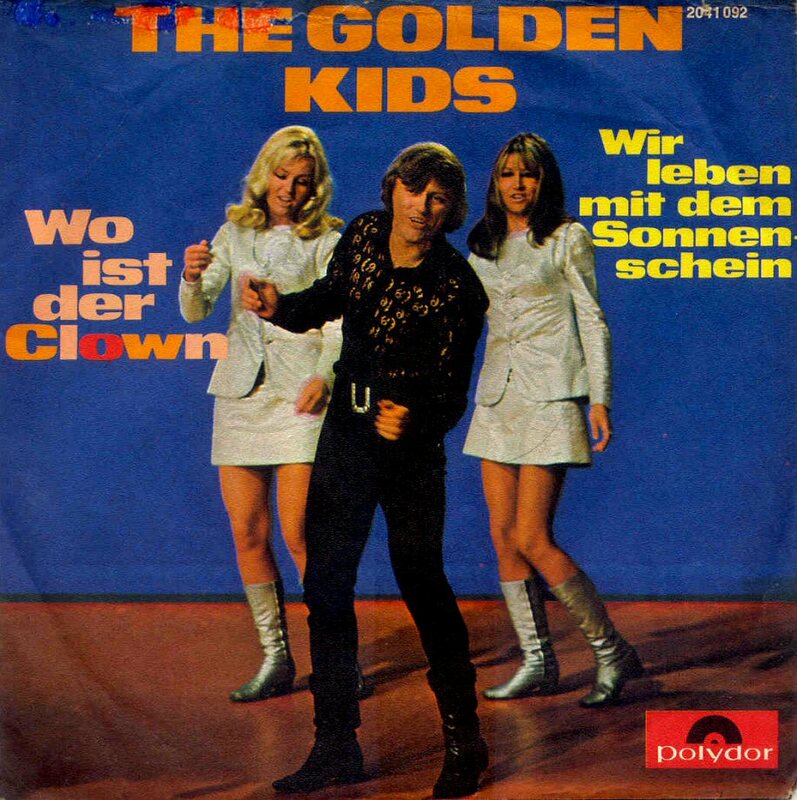 Golden Kids released two singles in West Germany and recorded a TV special for Hessischer Rundfunk in Frankfurt in 1969. 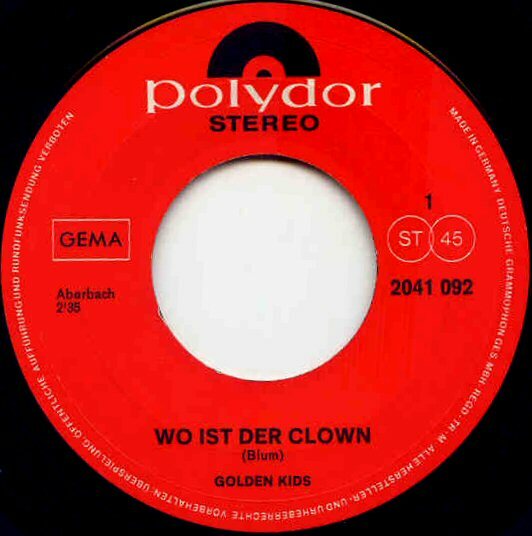 The first single featured the songs "Wo ist der Clown" and "Wir leben mit dem Sonnenschein". 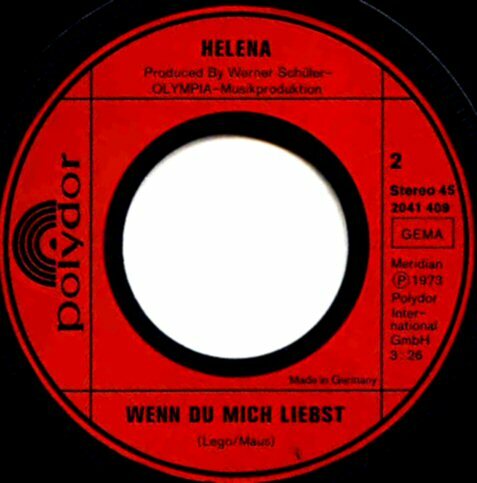 The latter song was the German version of Helena's hit : "Chytila jsem na pasece motylka" which was cover of "I Only Wanna Be With You". 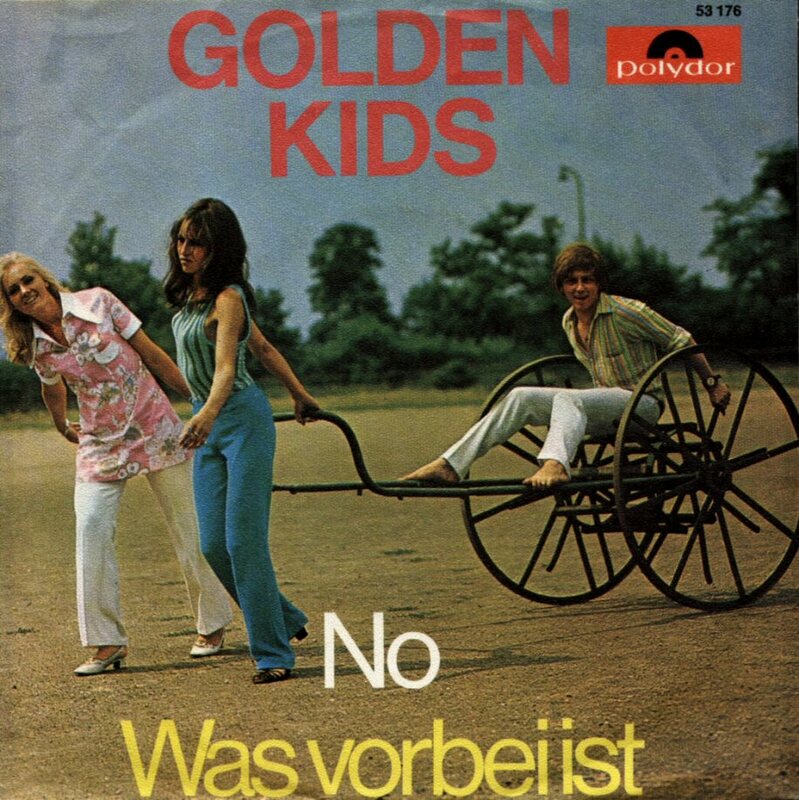 The second single released by Golden Kids in West Germany contained the songs "No" and "Was vorbei ist". 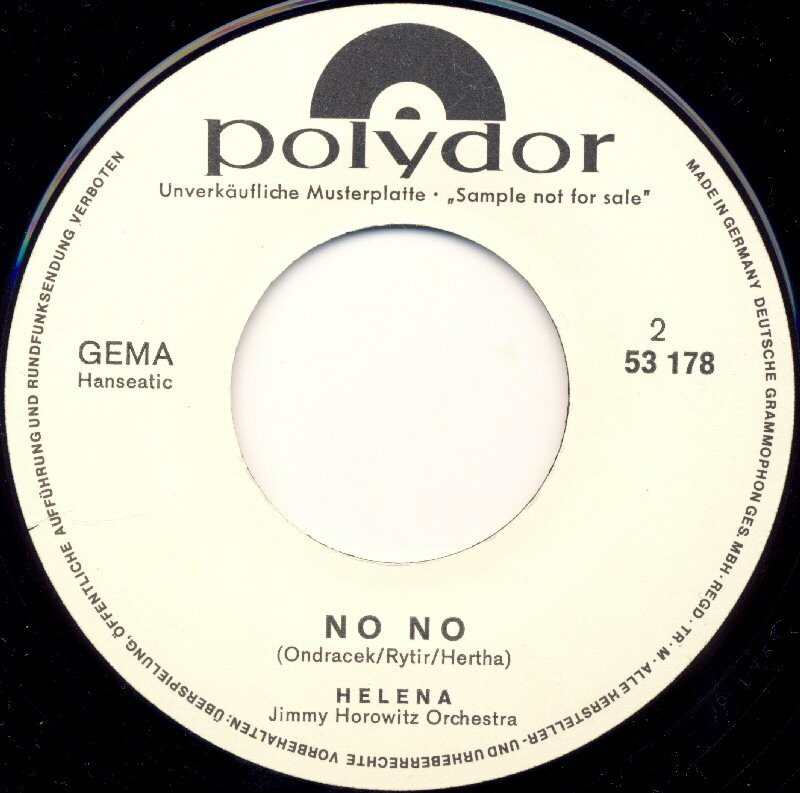 The song "No" was the German version of Golden Kids' very first hit "Hej, pane zajici" (feat Marta and Helena). "Was vorbei ist" was the German version of Vaclav Neckar's hit "Dobra zprava". 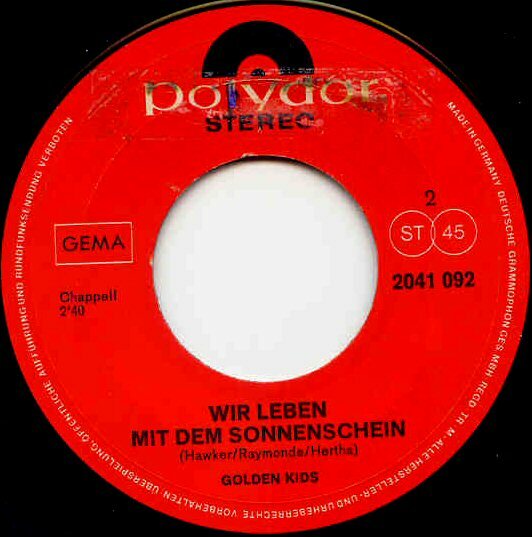 Golden Kids appeared in several West German TV shows singing their hits before the decision about split up taken by Czechoslovakian socialist party and government was taken at the beginning of 1970. The second Golden Kids LP entitled "1" was released at the beginning of 1970. This album would become their last studio album as Marta became forbidden as a singer by the regime for 19 years to come. Helena had lead on 4 of 11 tracks on the album. 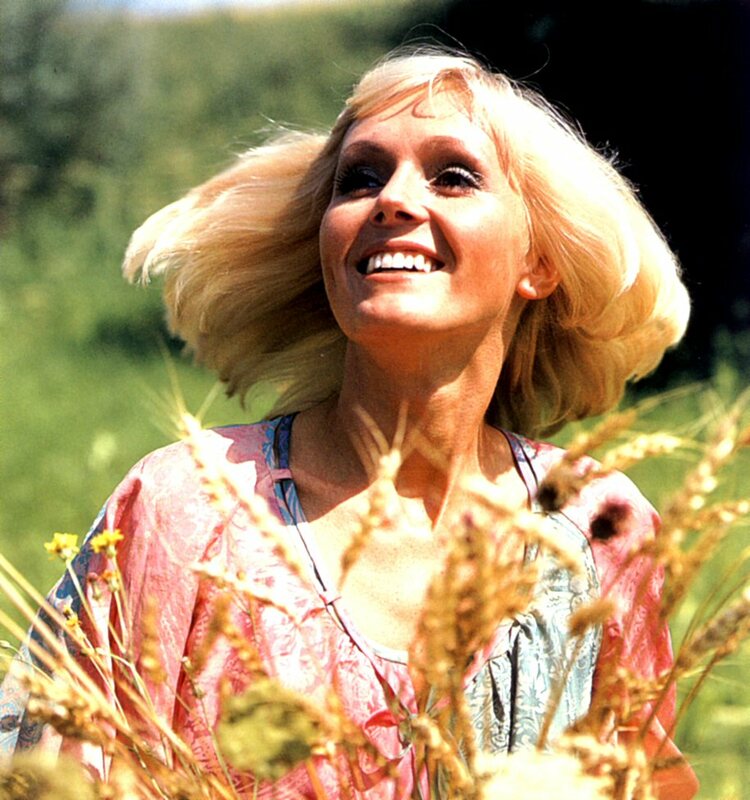 One of the songs on the album was "Maly princi, co s tvou ruzi" written by Benny Andersson and Björn Ulvaeus as "A Flower in My Garden" in 1968. 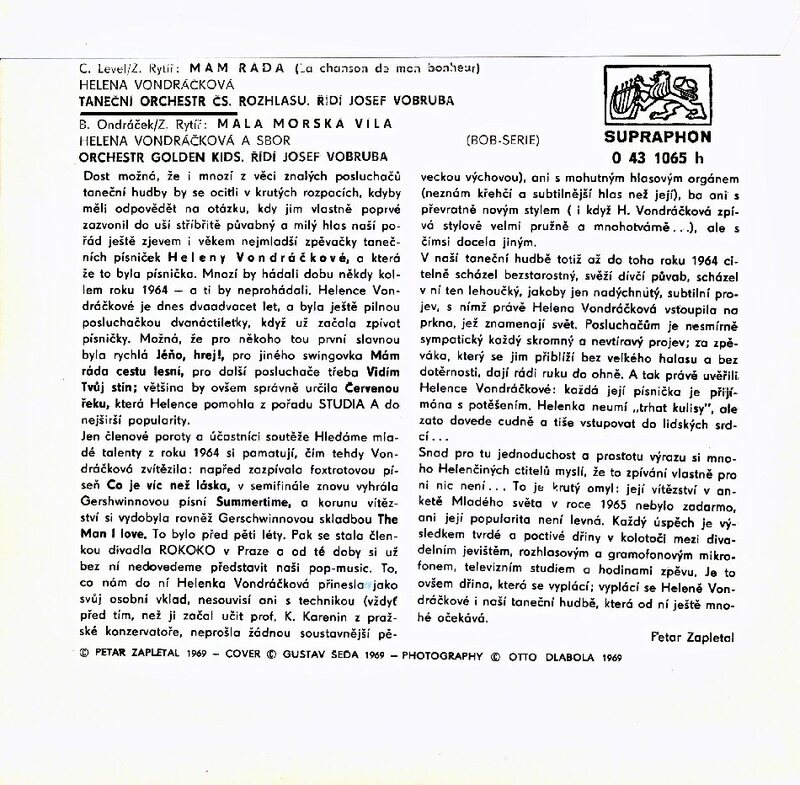 Due to the Marta's situation in Czechoslovakia the LP was deleted very quickly from the market and the review article which had been ready was never published in any Czechoslovakian newspaper. 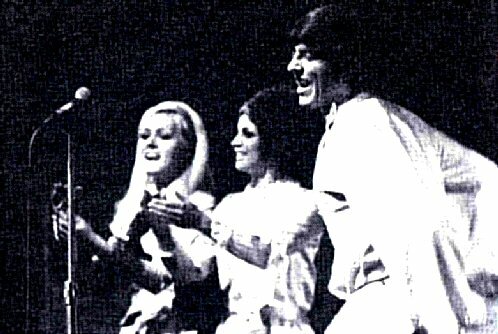 Golden Kids were officially disbanded in February 1970. 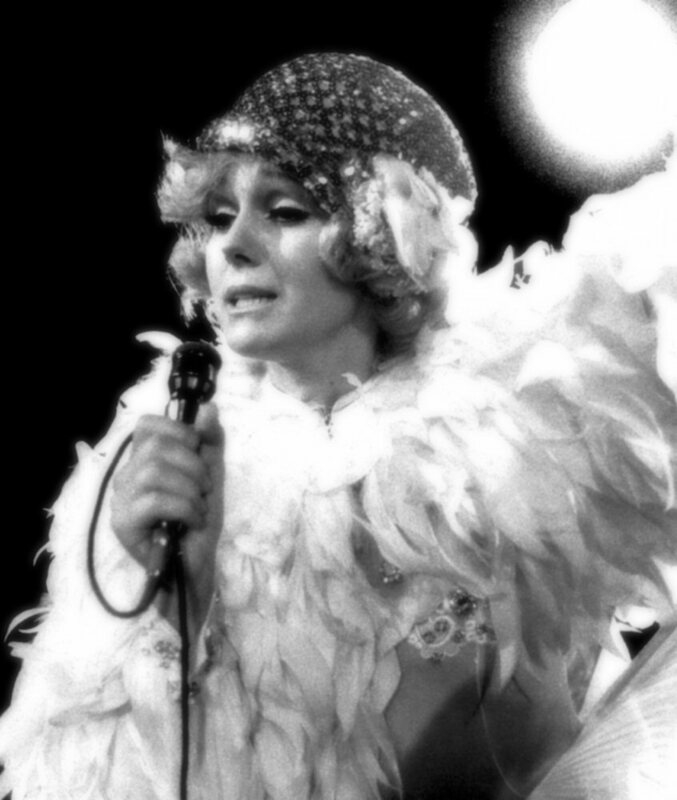 In June 1970 Helena performed on the Festival of Funny Shows in Knokke in Belgium. She would be back in Knokke even two years later. 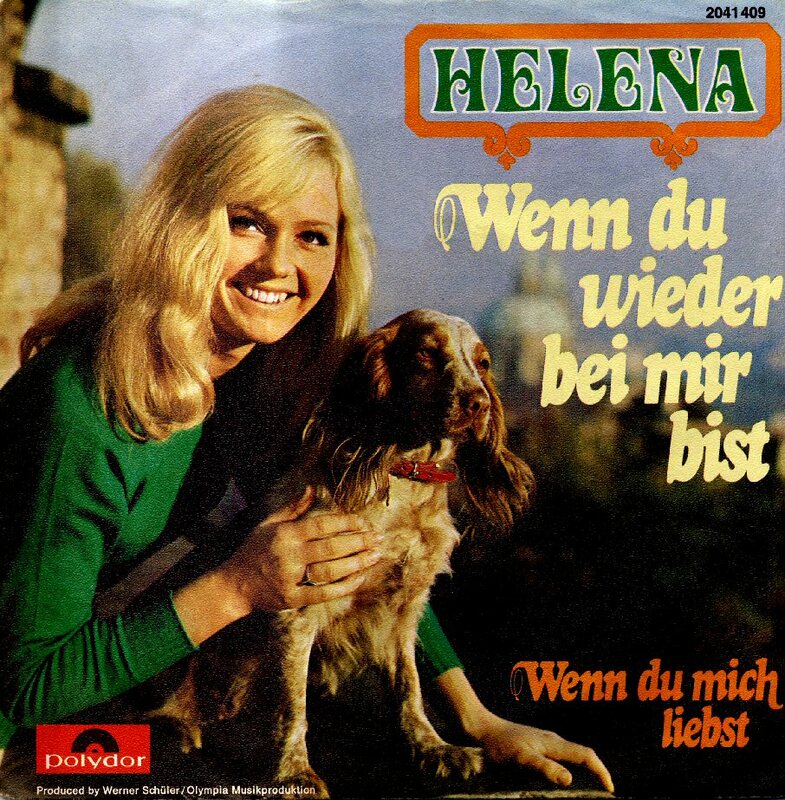 After the split up of Golden Kids, Helena continued as a solo artist even in West Germany. 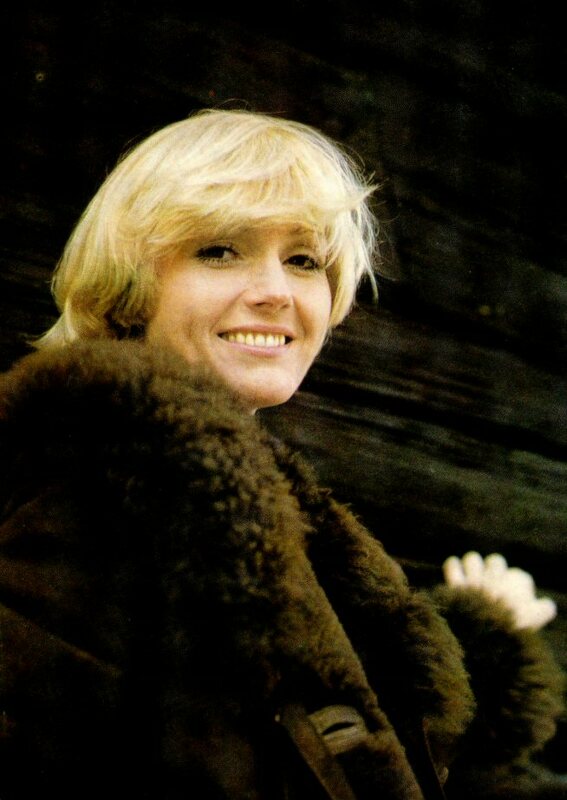 In 1970 she released a new single with two songs written by Bohuslav Ondracek performed in German. 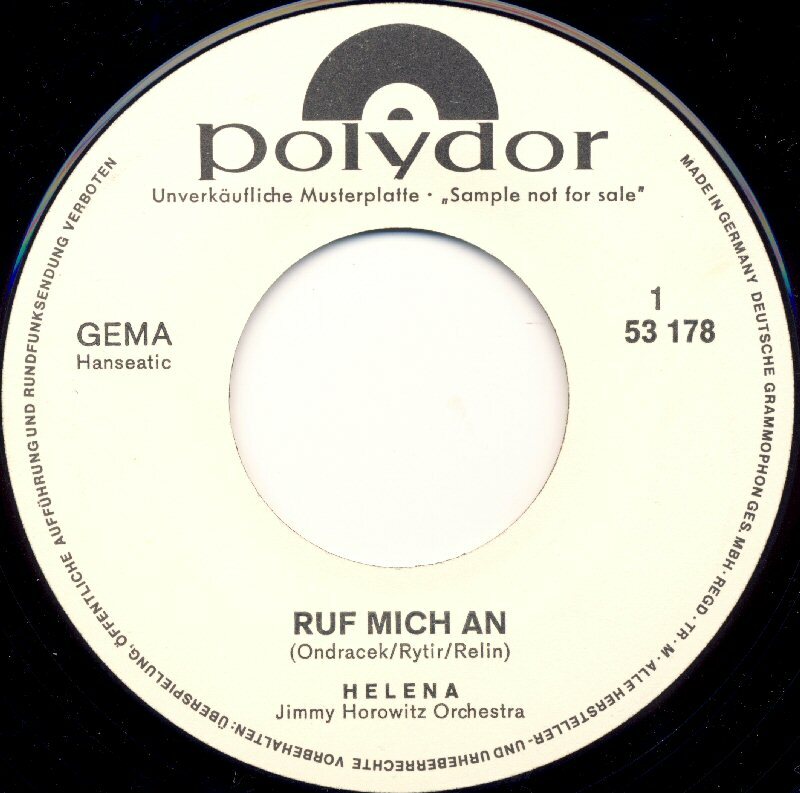 The songs were "Ruf mich an" and "No No No". The single is today extremely hard-to-find item in Germany. The most successful Helena single in 1970 featured the hit "Tva mala Jane" (Your Little Jane) b/w "Mr Sen" (Mr Dream). 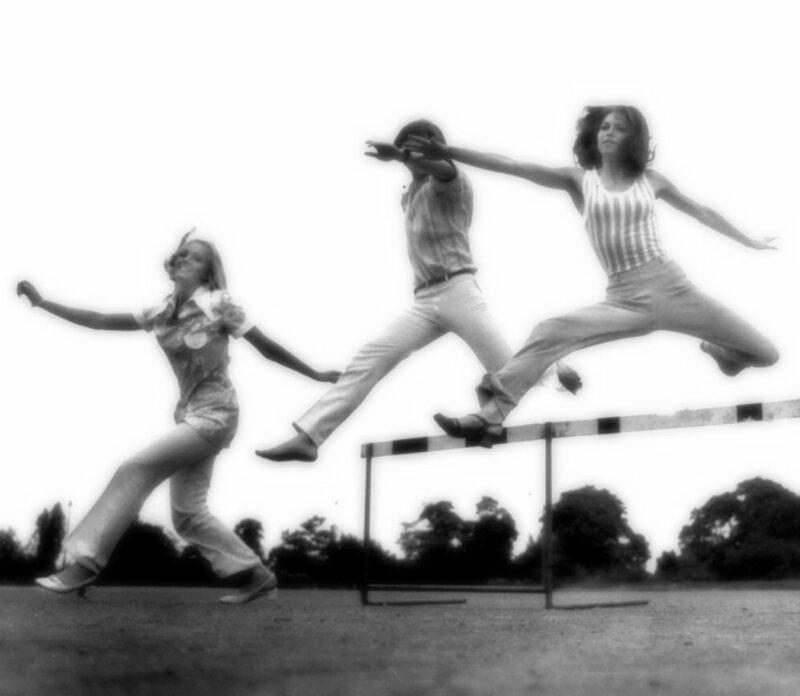 Photo sessions from the year 1970 by the photographer Otto Diabola. Helena followed the UK hit chart and she covered some of them from time to time. 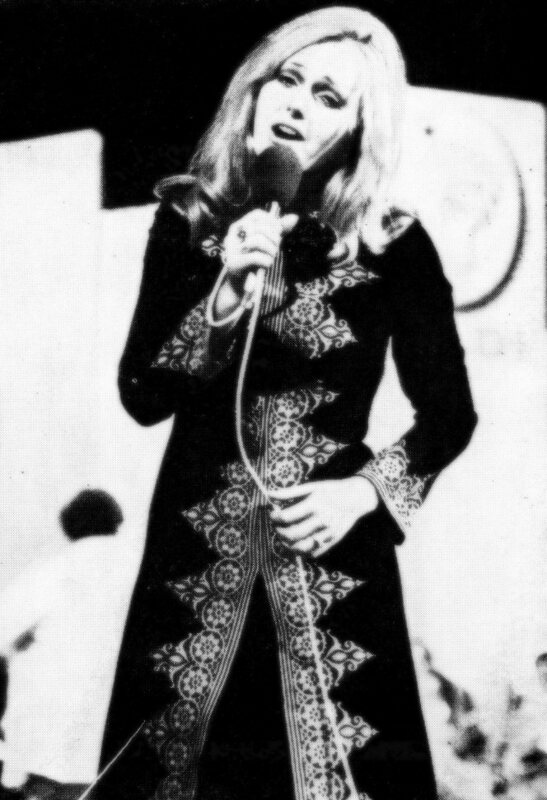 The single released in the summer 1970 featured two British Top 10 hits: "In the Ghetto" performed originally by Elvis Presley (UK #2 in 1969) and "Temma Harbour" performed by Mary Hopkin (UK #6 at the beginning of 1970). 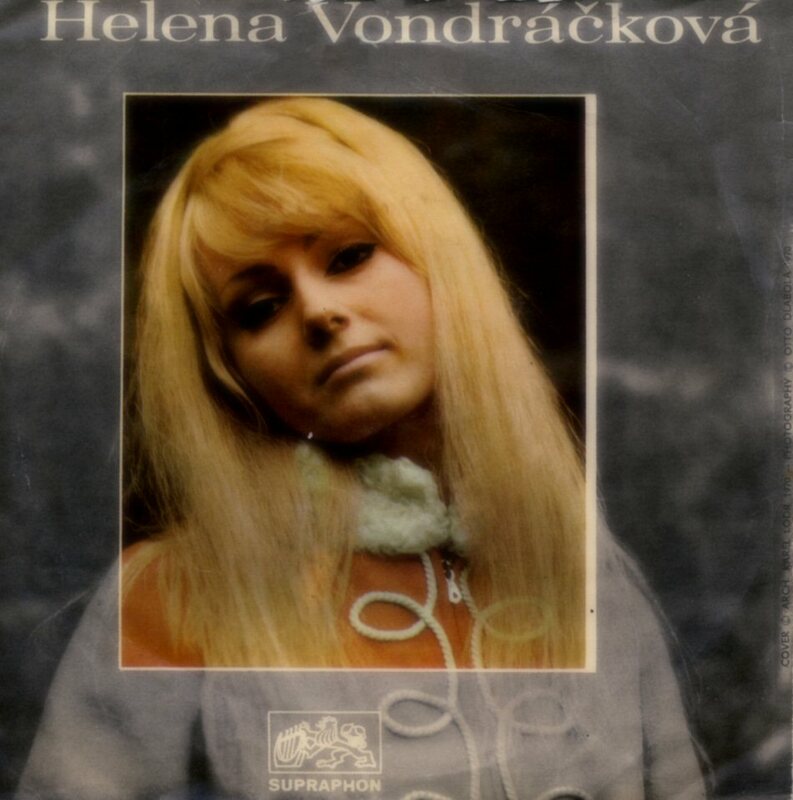 In 1970 Helena released her second studio album entitled "Ostrov Heleny Vondrackove" (The island of Helena Vondrackova). The album had been recorded at the beginning of February 1970. The group Golden Kids still existed during the first recording sessions for Helena's solo album and Marta Kubisova was background singer on 4 tracks. 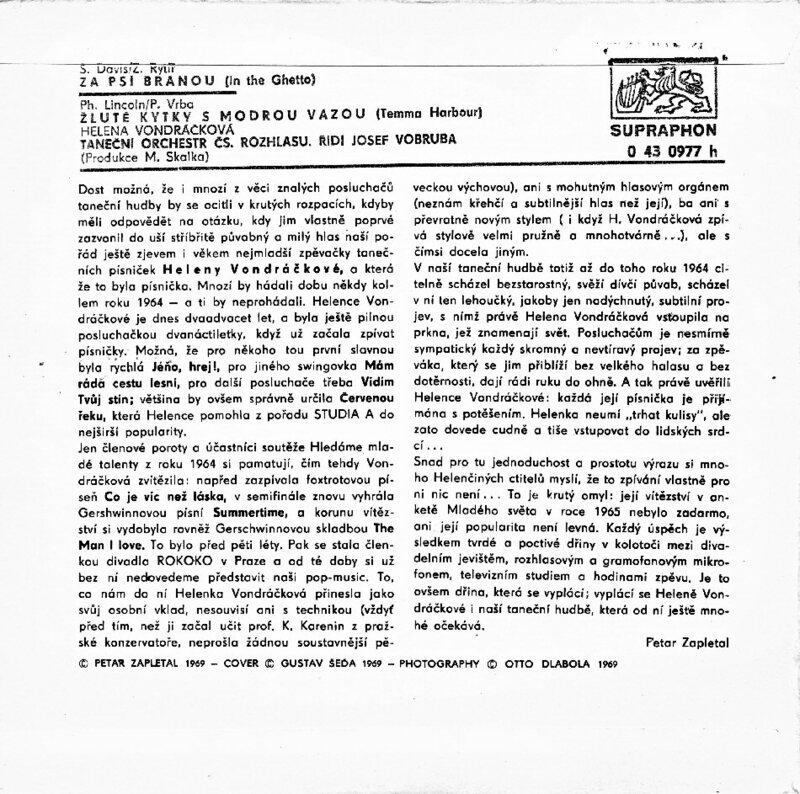 The single promoting "Ostrov Heleny Vondrackove" featured two tracks from the album: "Jsem buh i dabel" (I am god and devil) which was a cover version of the american hit "Without her" performed originally by Nilsson and "Pojd jen bliz" (Come closer). 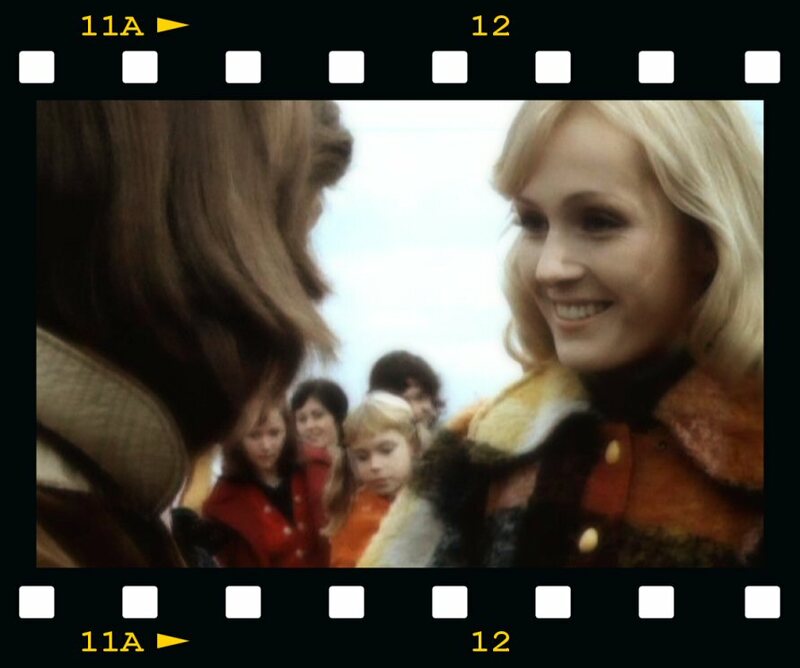 In September 1970 Helena appeared in German TV show filmed in Kraków in Poland. It was one of the first solo performances after the split up of Golden Kids earlier this year. Helena performed the song "I am sorry" in German. The video was recorded in Kraków/Nowa Huta. 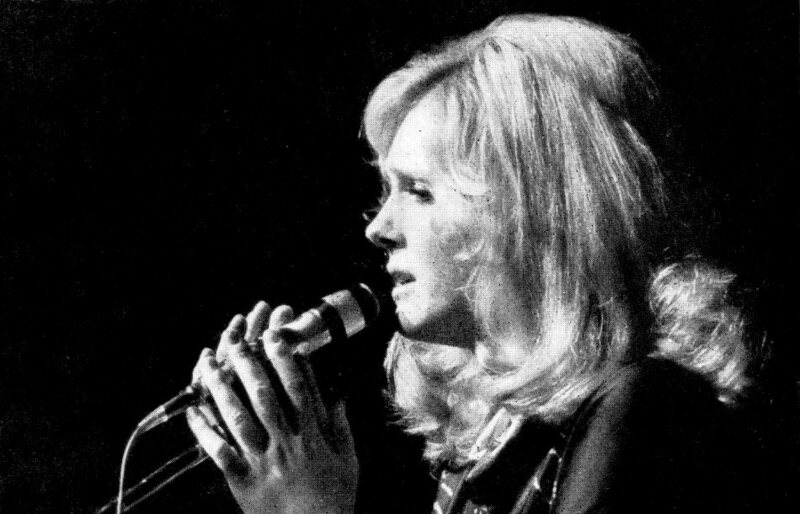 In November 1970 she had a big success in Japan winning the Prize of Hitachi on the Yamaha international song festival in Tokyo. Helena was always keen on French songs and she made several covers of French songs as well as she sang in French herself. 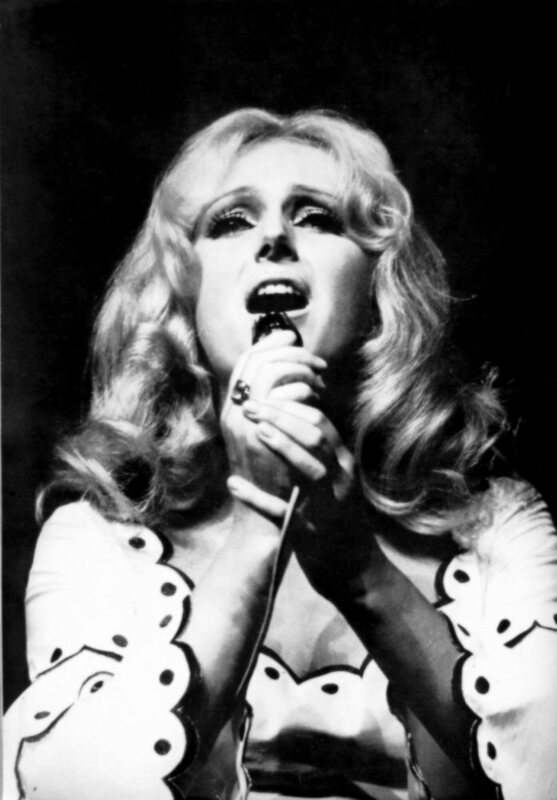 At the end of 1970 she recorded the song "La chanson de mon bonheur" originally performed by French star Mireille Mathieu. 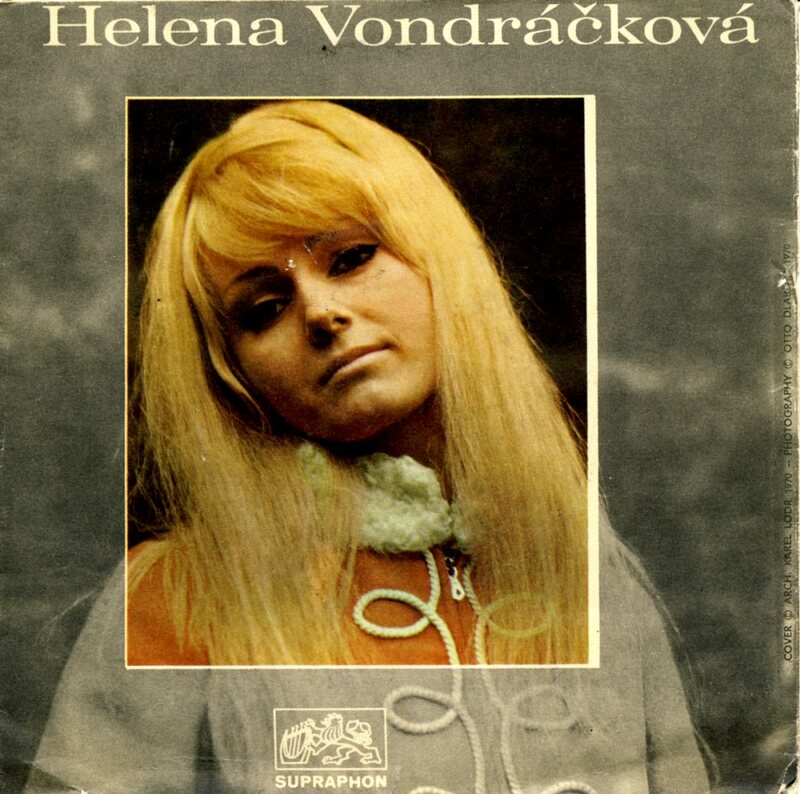 The year 1971 did not bring any new LP release from Helena but four singles which became big hits in Czechoslovakia. 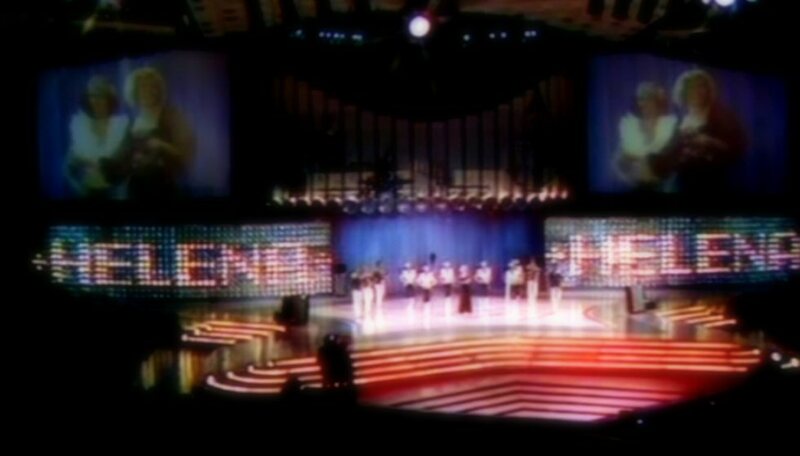 Three of the songs released on singles during this year became Helena's evergreens still performed on concerts. 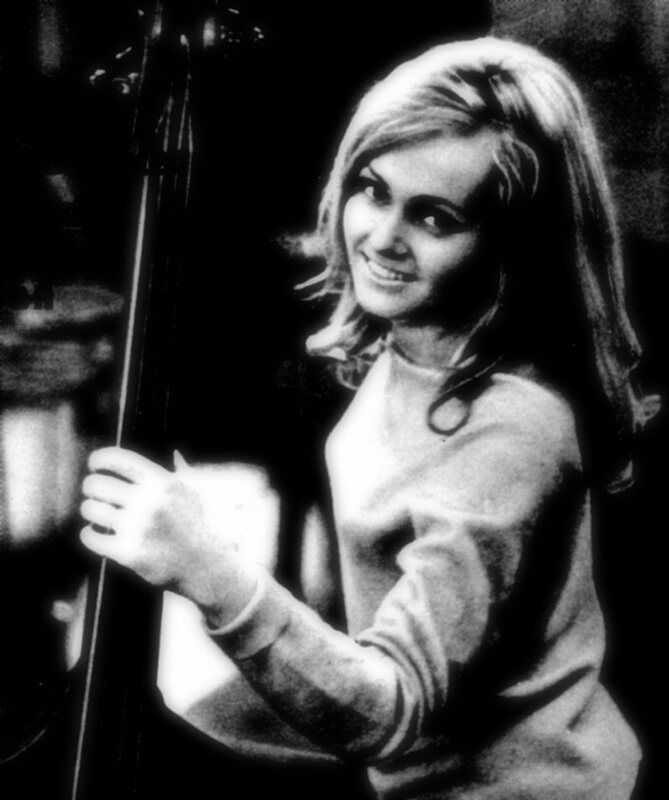 The classical "Milacku" (Sweet heart) was the first single to be released that year. The single was released in two different covers. 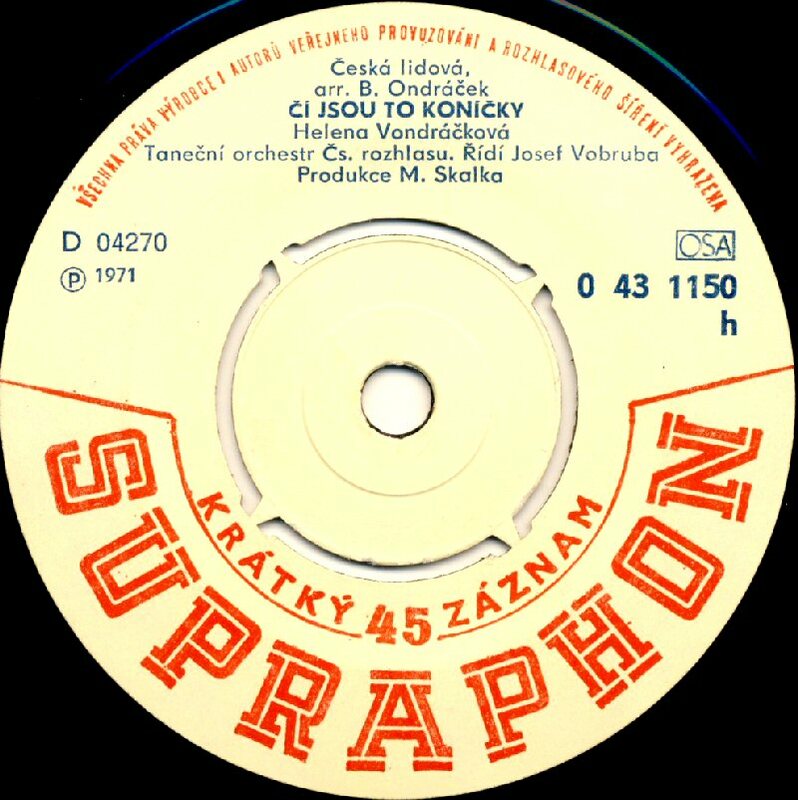 The second single in 1971 featured the songs "Kulovy kral" and a Czech folk song "Ci jsou to konicky". 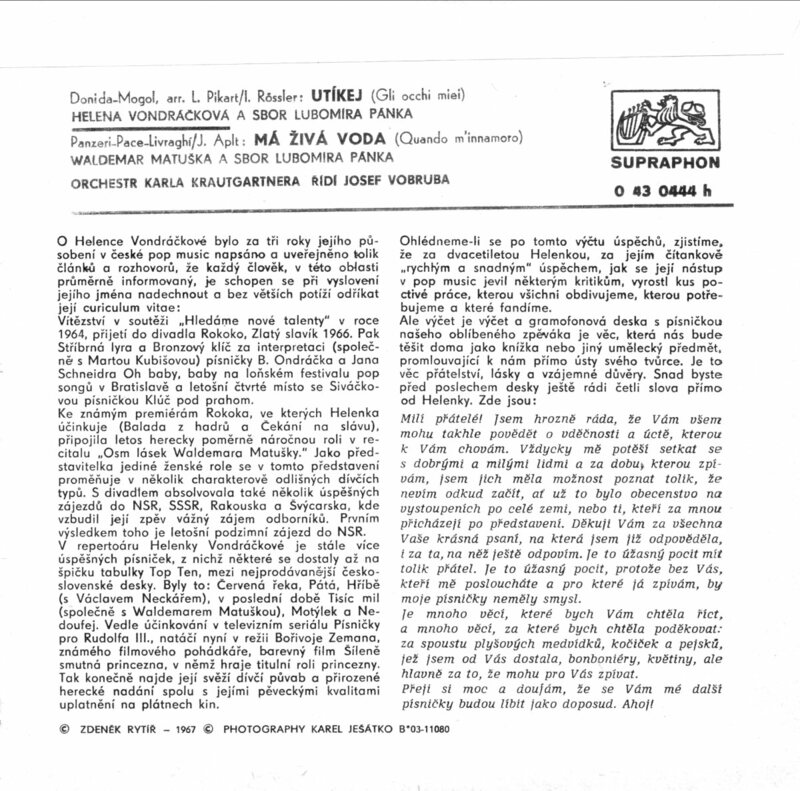 On June 30th, 1971 Helena performed in front of audience in the "Supraphon" studio in Prague. 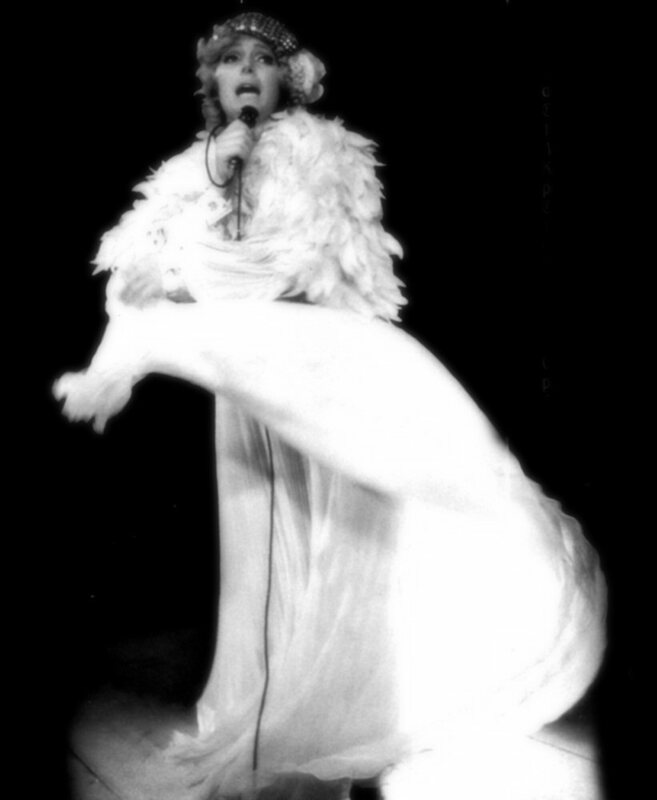 This performance was recorded for a future album release (see 1972). 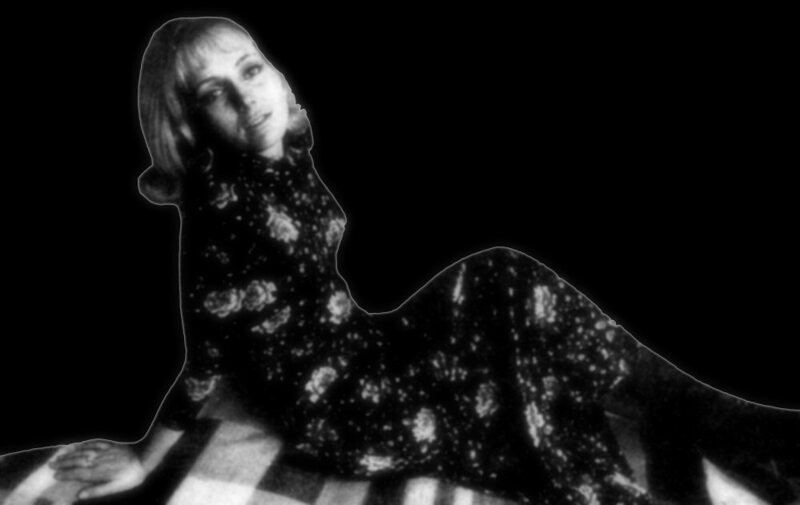 Pictures of Helena taken in connection with her live performance which were used on the cover of the 1972 live album "Helena! Helena! Helena!". The November 1971 elections in Czechoslovakia were the first to be held since 1964. These, like every election, proposed single slates of candidates for the Federal Assembly. 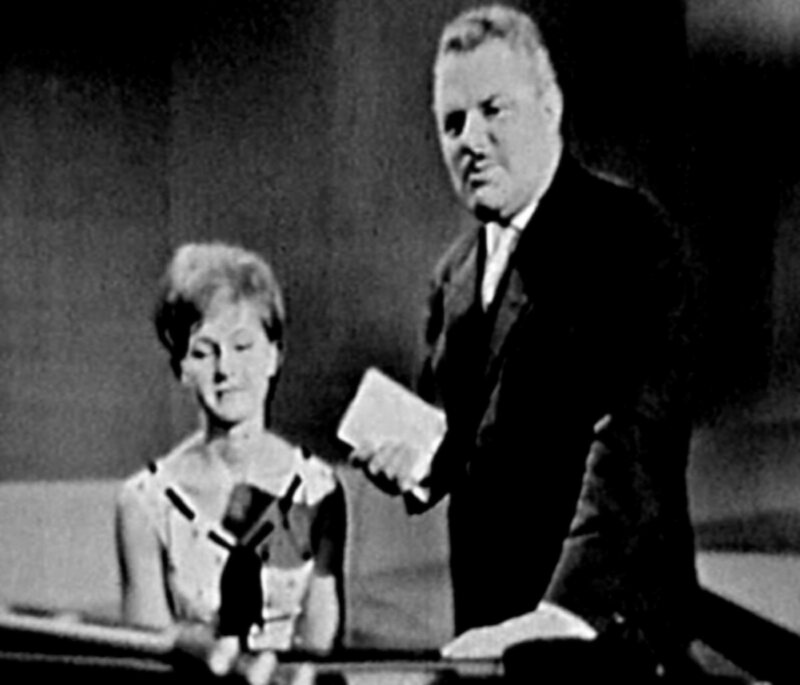 Several concerts were arranged before the elections under the title "I give my vote" with the biggest artists as Karel Gott and Helena Vondrackova. At the end of the year Helena gave a big interview for the Czechoslovakian music paper "Melodies". New pictures of the singer were published in connection to the article. 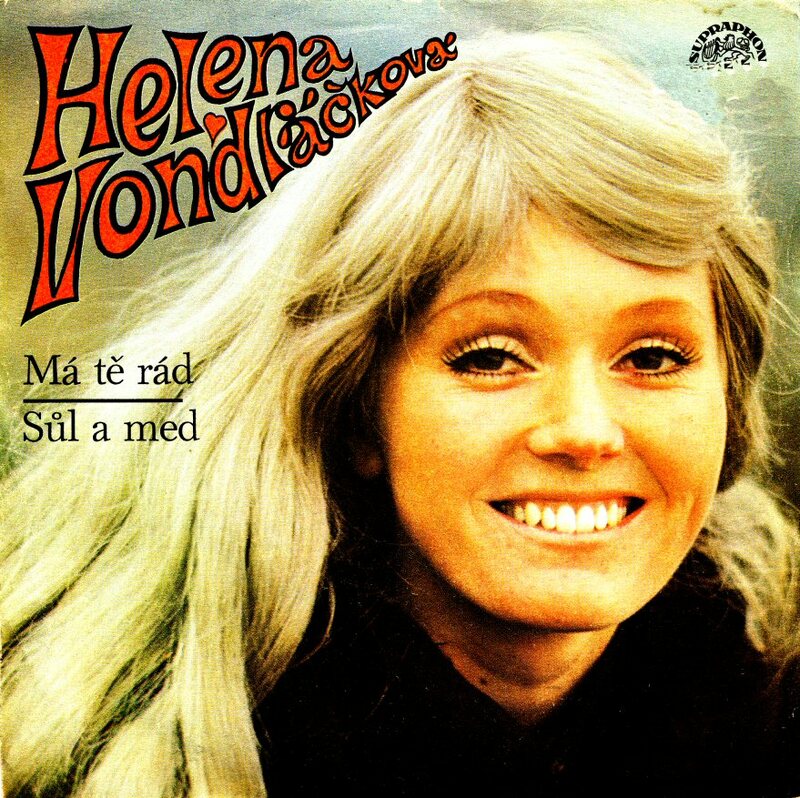 Helena made her own cover of the song performed originally by Melanie Safka "What Have They Done To My Song, Ma" (Top 40 hit in Great Britain and Top 10 hit in Norway in 1971). 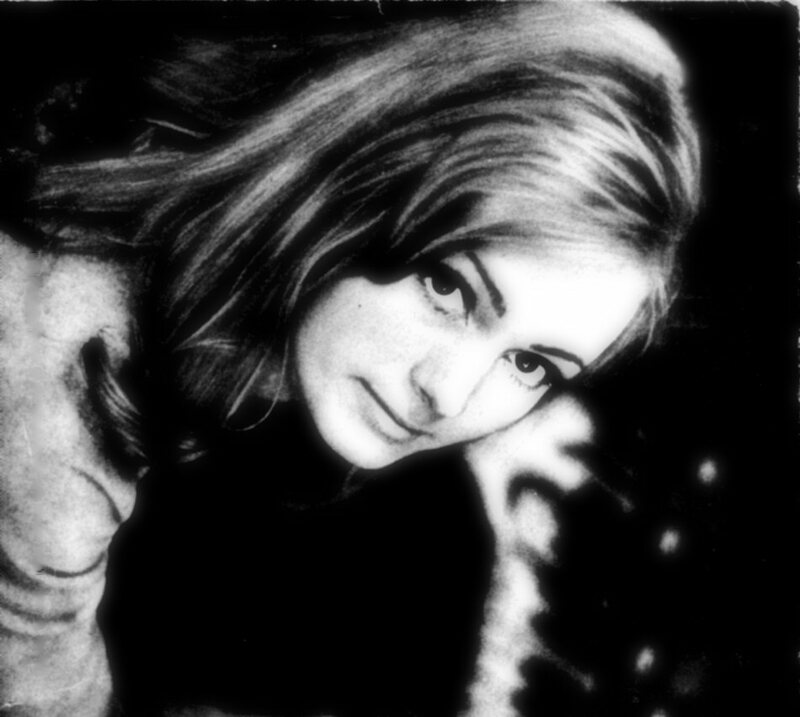 The song was entitled "Tam zmizel ten stary song" (There disappeared this old song) and it became one of the biggest hits of Helena in the 1970. 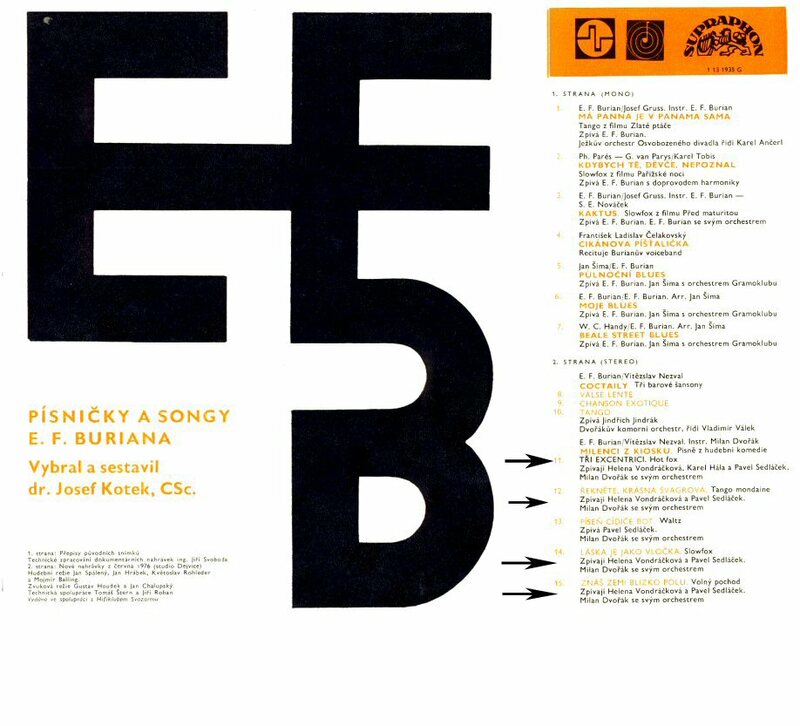 The single was released in Czechoslovakia in 1971 with "Fanfan" on the other side. 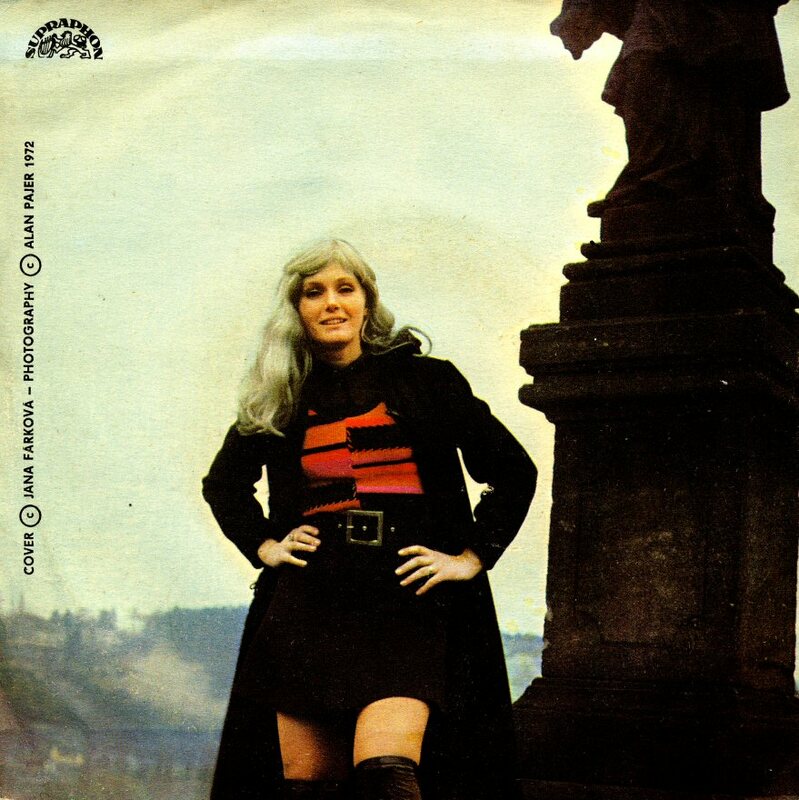 The single became a top 10 hit in Czechoslovakia in October 1971. 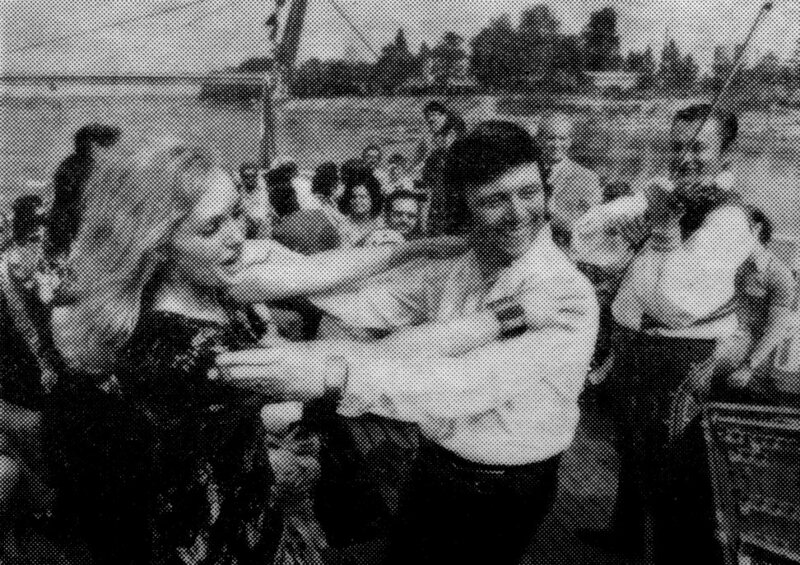 The last single release in 1971 featured the songs "Admiral" and "Mamin prvni bal" (Mother's first bal). 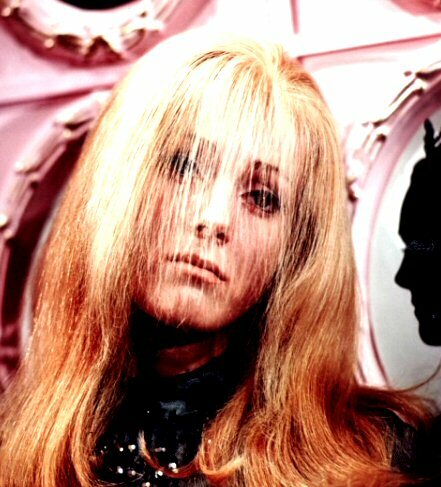 Totally Helena released only 4 singles and no albums in 1971. 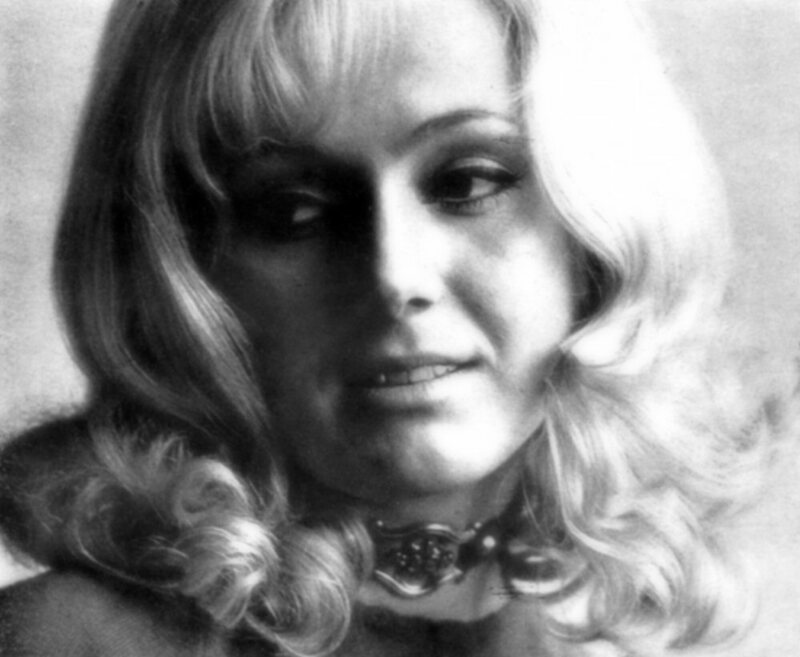 Helena became the second most successful female artist in Czechoslovakia in 1971 and she received the Silver Nightingale during the traditional "Golden Nightingale" show in December 1971 in Prague. 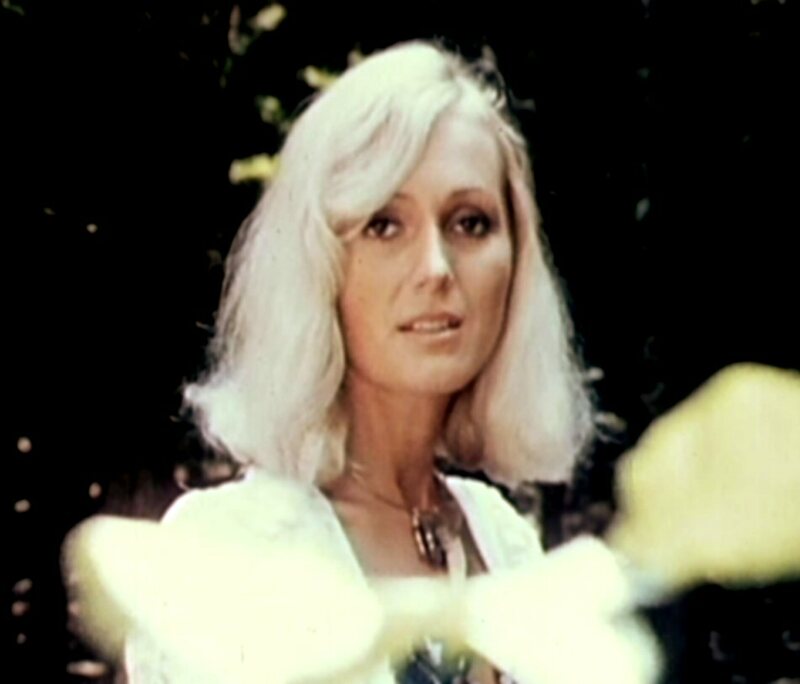 The single "Cestou poledni" b/w "Svitani na vodach" (Midday travel/Dawning on the waters) was one of Helena's single releases in 1972. The single came out at the beginning of the summer and became quite big hit in Czechoslovaka. The single was released in two different picture covers. 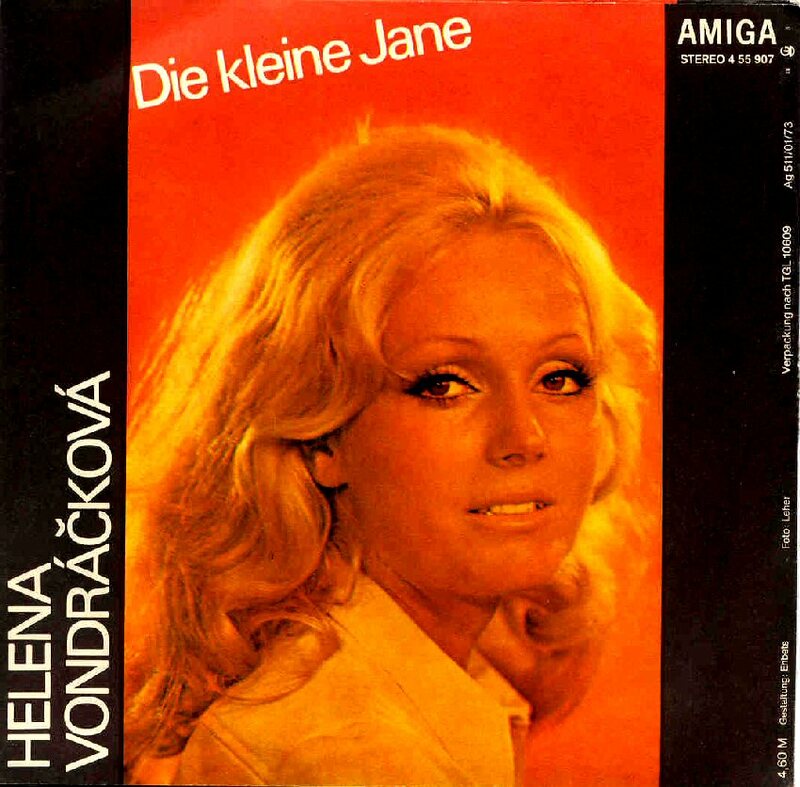 One of the most successful Helena songs was her cover version of the world hit "Apres toi" which received the Czech title "Jak mam spat" (How can I sleep). 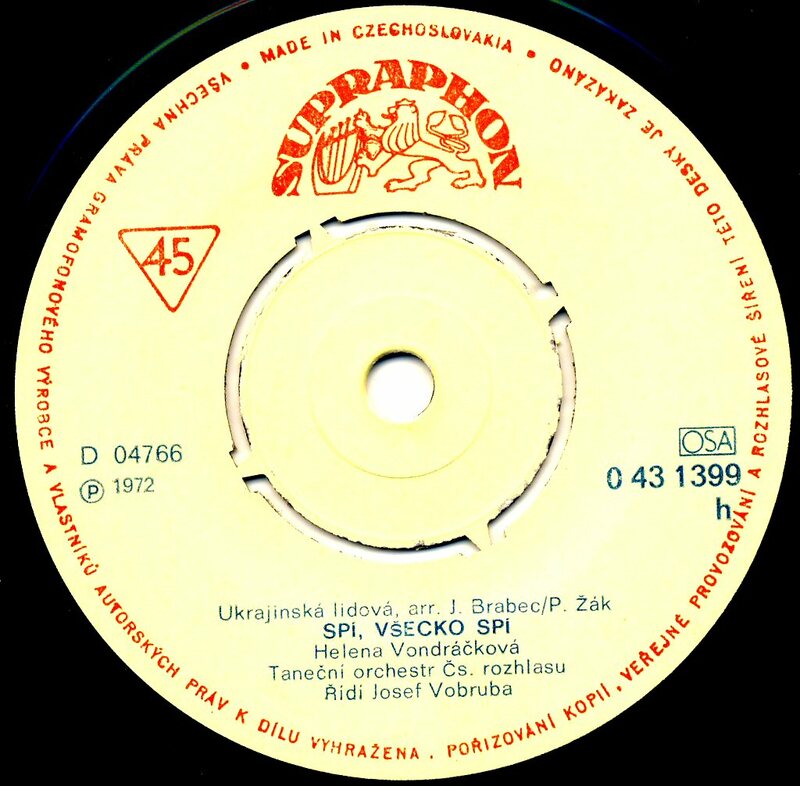 The B-side contained an Ukrainian folk song "Spi, vsecko spi" (They all sleep). The single was released with three different covers. 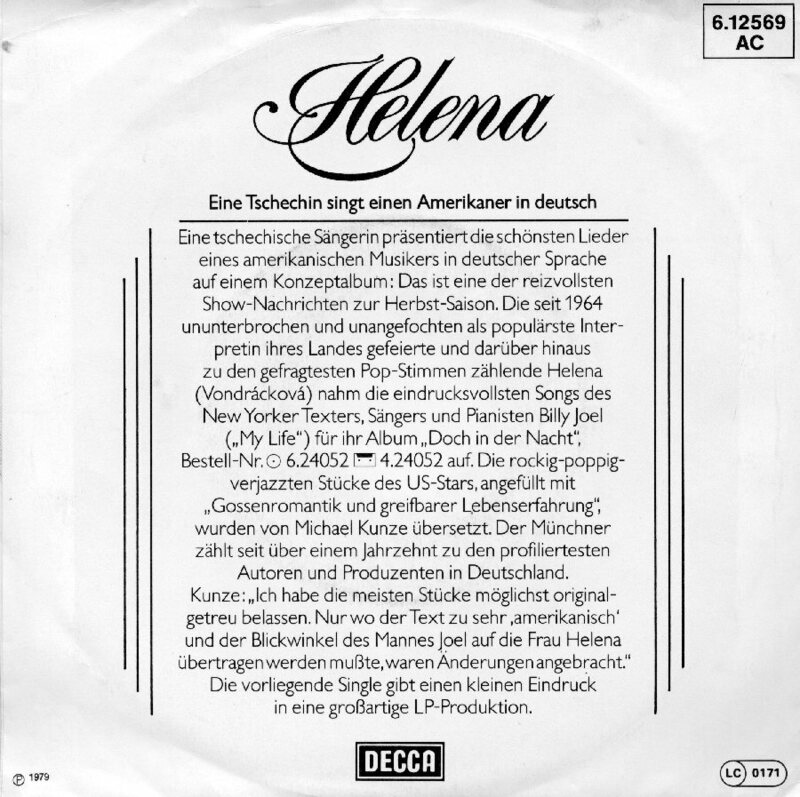 The year 1972 saw the release of Helena's live album called simply "Helena Helena Helena". The album contained 11 hits recorded in the Czechoslovakian record company "Supraphon" studio in Dejvice (Prague) with live audience. The recording was made on June 30, 1971. 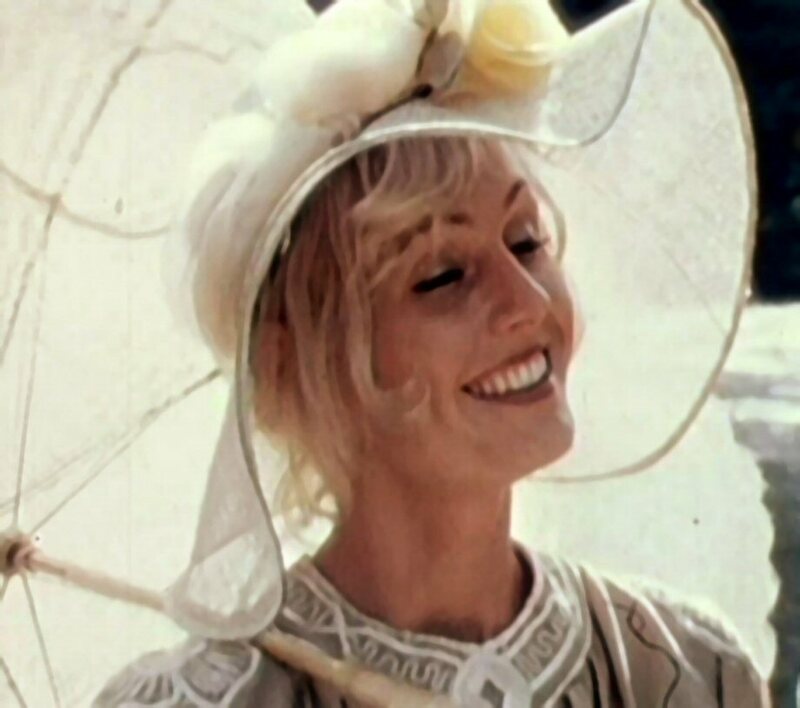 At the beginning of 1970s Helena became very successful abroad. 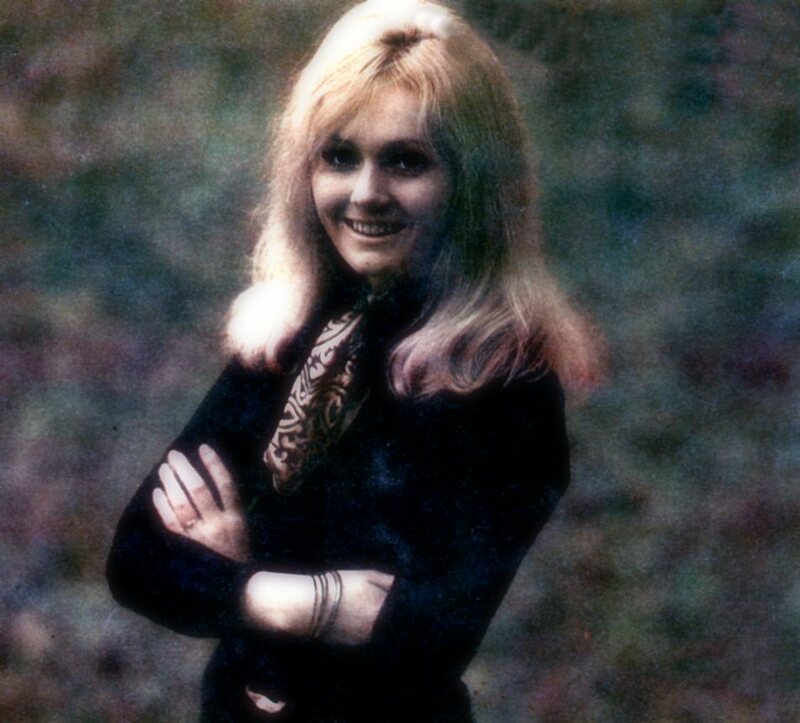 The first attempt to promote the singer abroad was done in 1972 when her first English language album "The Isle of Helena" was released in some countries. 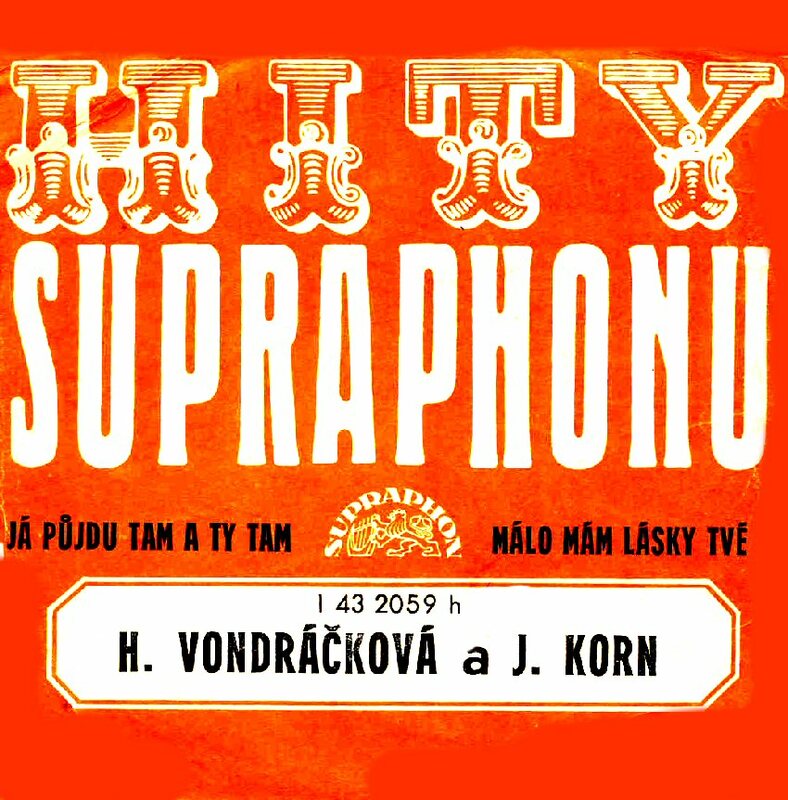 The album contained 12 songs partly written especially for Vondrackova partly covers. Among the covers there were Lennon/McCartney's "Honey Pie", Bacharach's "I Say a little Prayer" and Legrand's "The Windmills of your Mind". 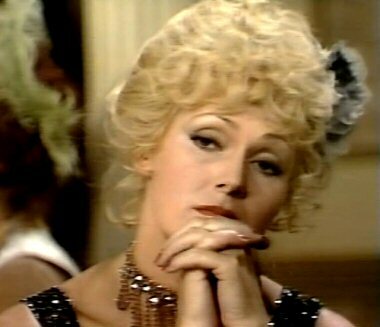 Helena in a TV show in March 1972. 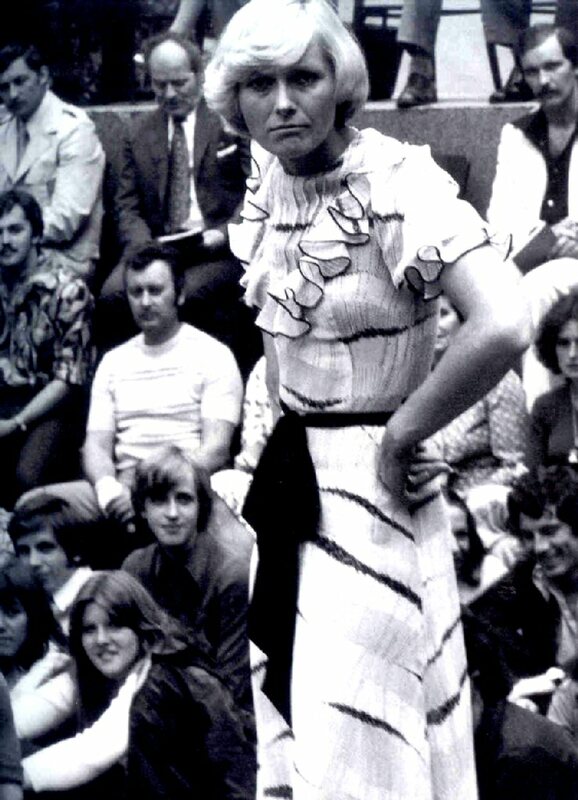 In 1972 Helena worked a lot abroad. For a singer in a socialistic country it was very important to work in Soviet Union by that time. 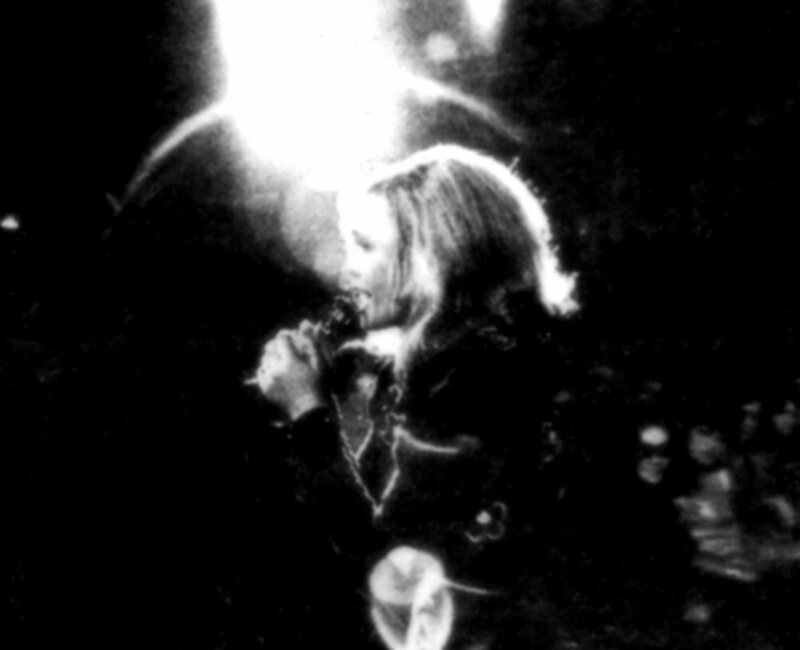 On Helena's concert in Yerevan in 1972 there was an audience of 70 000 people. 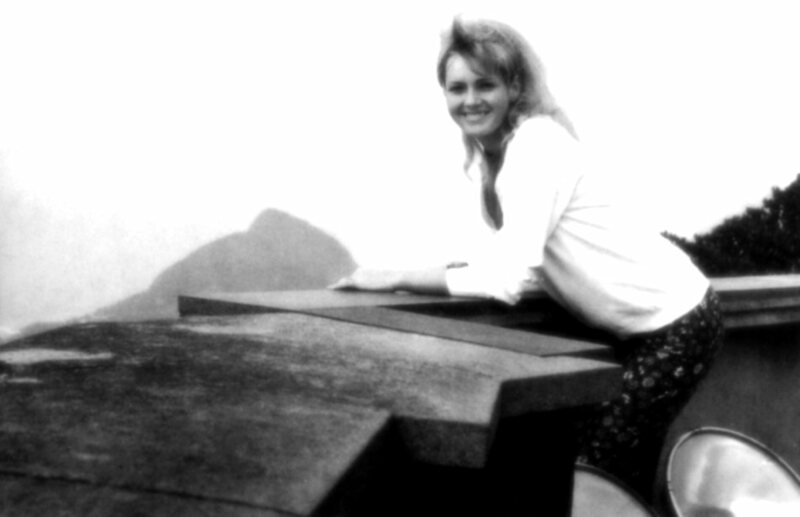 After the Soviet tour Helena went to Japan. 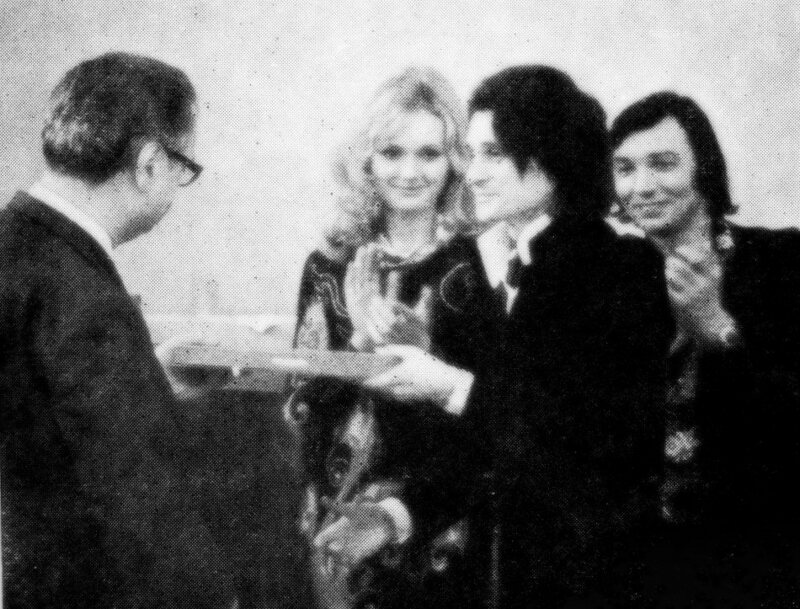 Helena's Czech record company tried to promote the singer in Japan and the Japanese side showed some interest. She made 16 concerts in Japan and signed a contract for one LP. She even appeared on the NHK TV in a 45-minute show. 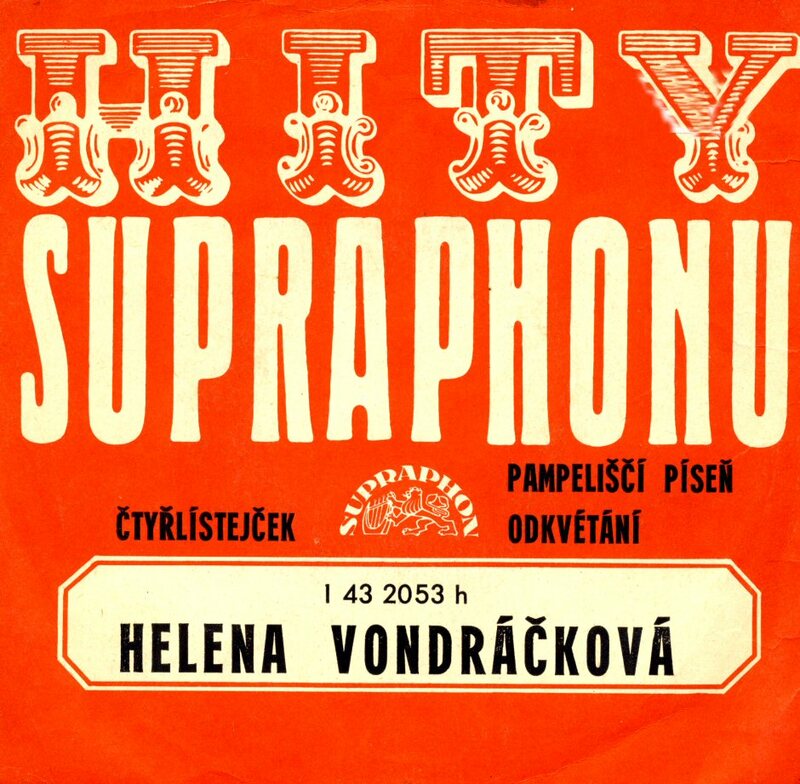 Helena received Golden Record from the record company Supraphon in 1972 for her LP sales in Czechoslovakia. Helena participated in the Song Festival in the capital of Slovakia - Bratislava. 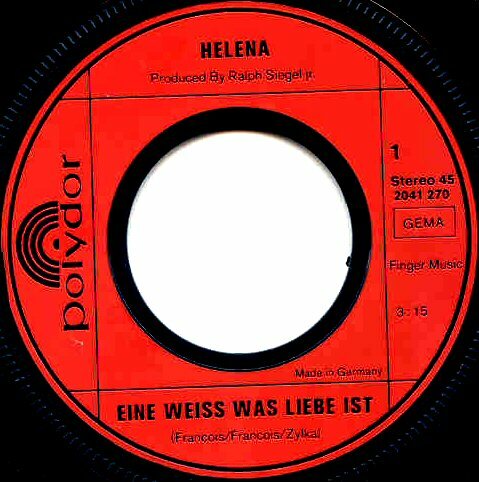 In 1972 Polydor in West Germany released Helena's single "Eine weiss was Liebe ist". 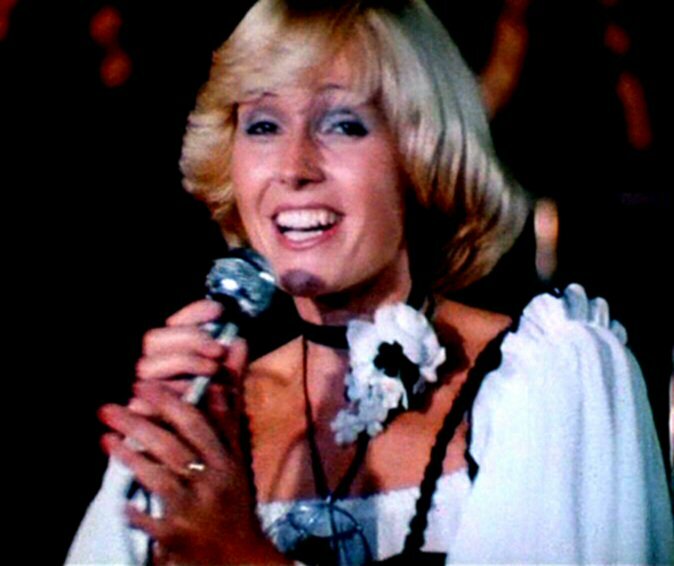 By that time Helena was still remembered as a member of Golden Kids, the group that was quite successful in West Germany in 1969. 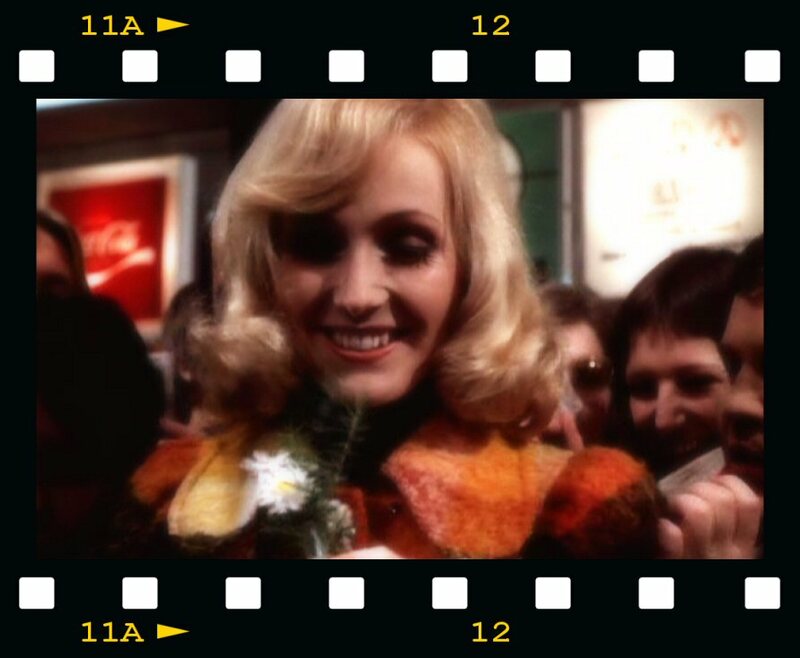 Even Helena became a star in both East and West Germany where she still has a great group of fans. 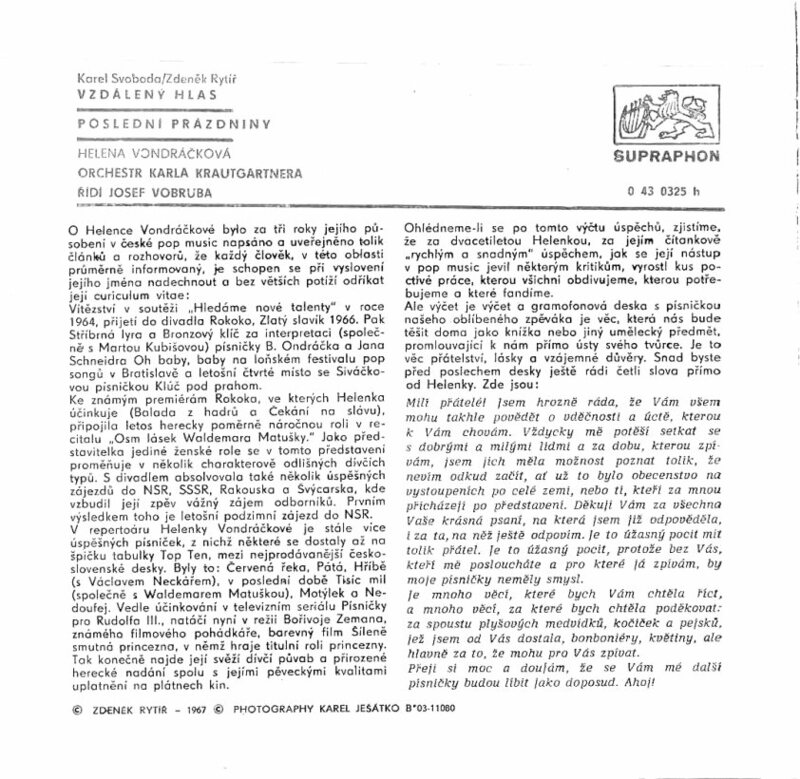 New single released at the end of 1972 featured two non-album songs "Stribrem zdobena skrinka" (Silver box) b/w "Divka Sirael" (The girl called Sirael). 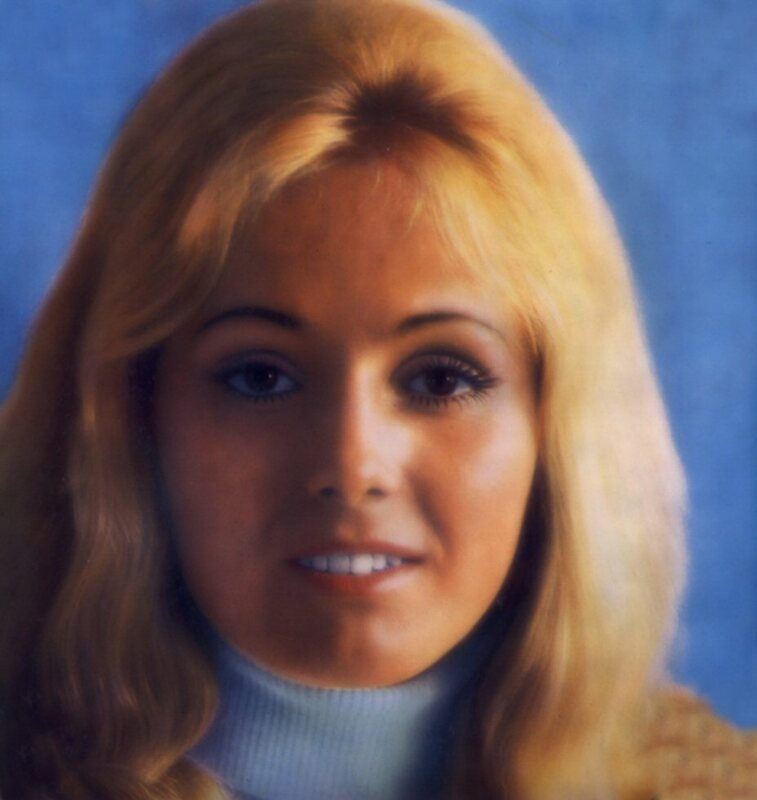 The single did not enter the Czechoslovakian chart in 1972 which under this period was dominated by another Helena single hit "Kvitek Mandragory". 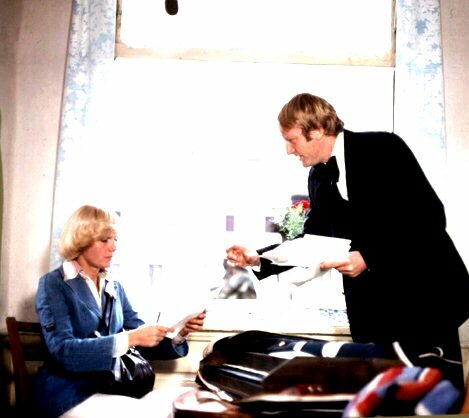 At the same time as Helena continued to establish her solo career in West Germany she was even a frequent guest in East Germany. 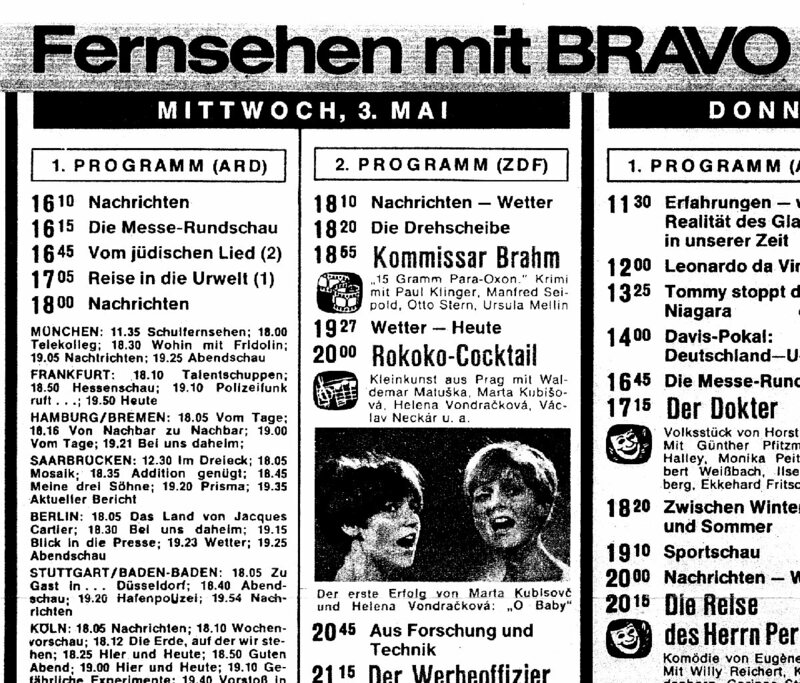 At the beginning of October 1972 Helena was on the cover of the TV/Radio paper "FF Dabei" as well as a special guest in the radio show "Schlager". 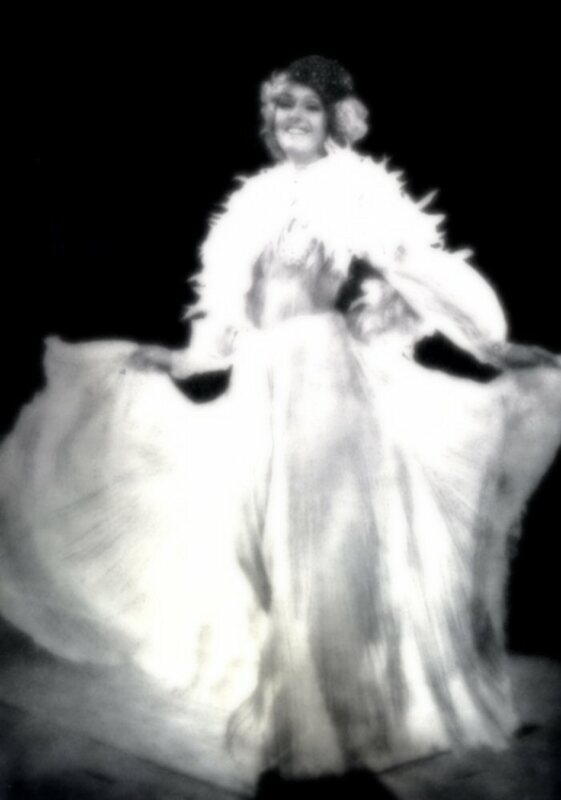 She even performed at Friedrichstadspalast in Berlin. 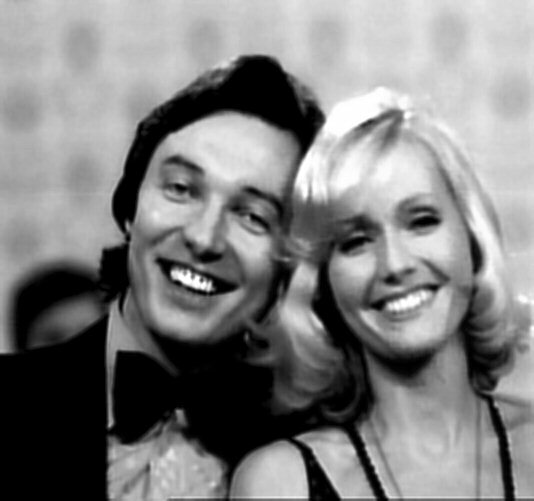 Czechoslovakian TV recorded a special with Helena and Waldemar Matuska where both performed their greatest hits. This promotional card was printed in 1972 and it featured full up-to-date discography. 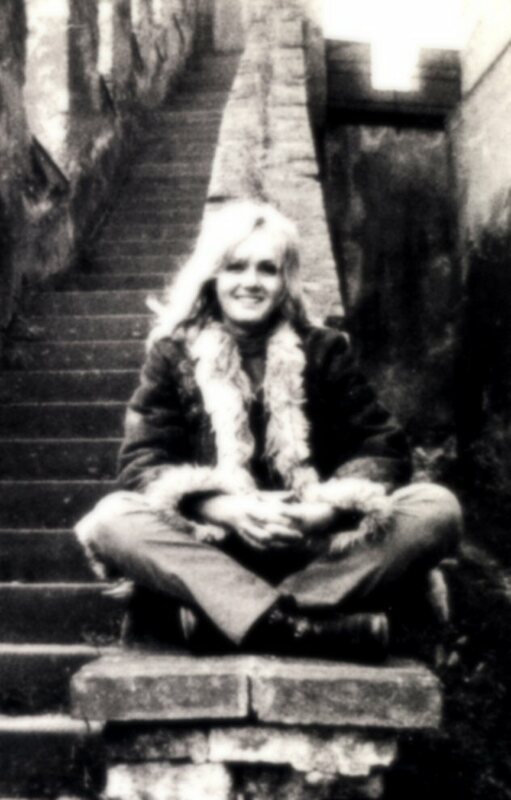 Helena started the year 1973 in Berlin. 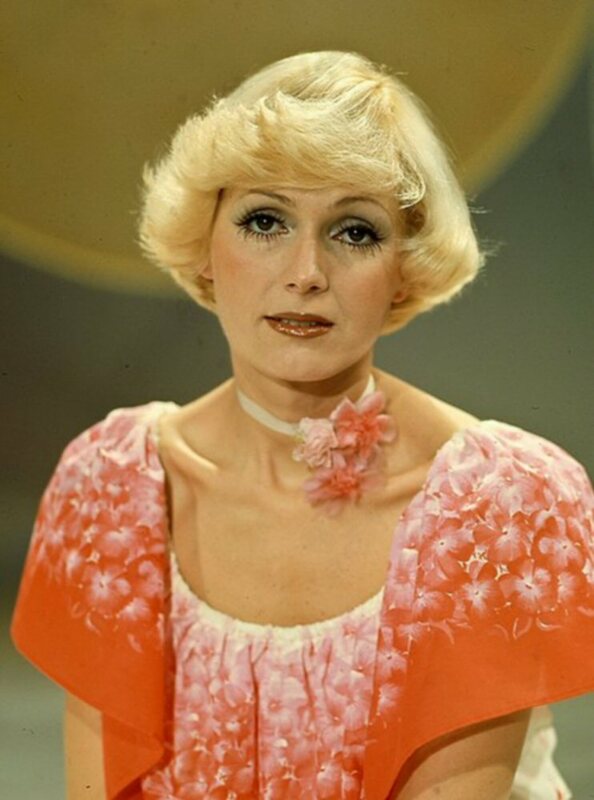 On January 13th, 1973 she in the TV show "Ein Kessel Buntes". Among the guests invited to the show was even the Danish group "Olsen Brothers" who won Eurovision Song Contest in 2000. 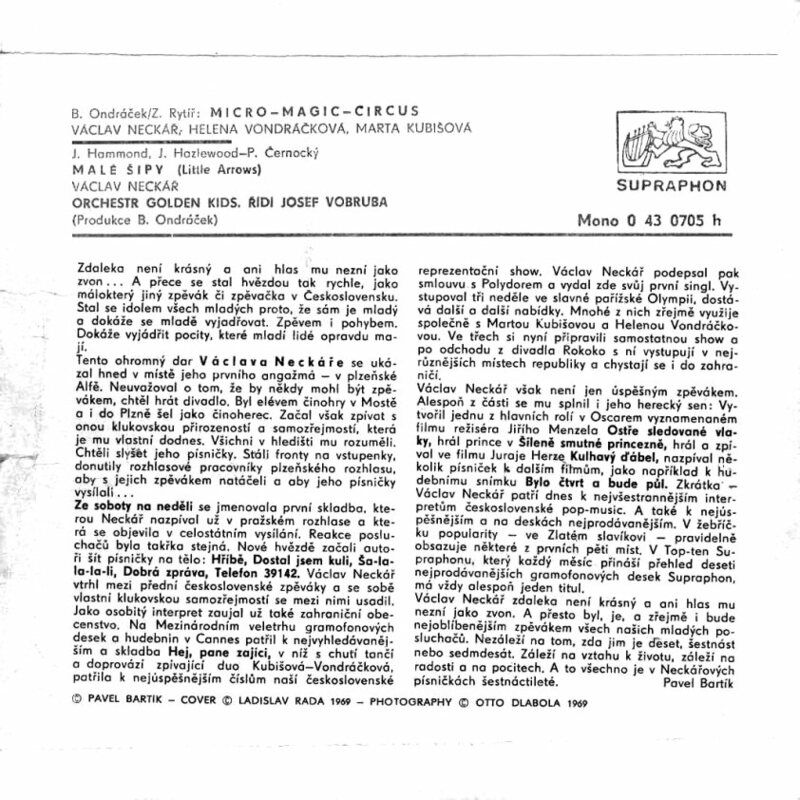 The single with "Ptaci hnizda" (The bird clutches) b/w "Pocitej do dvou" (Count to two) was released at the beginning of 1973 in two different picture sleeves. 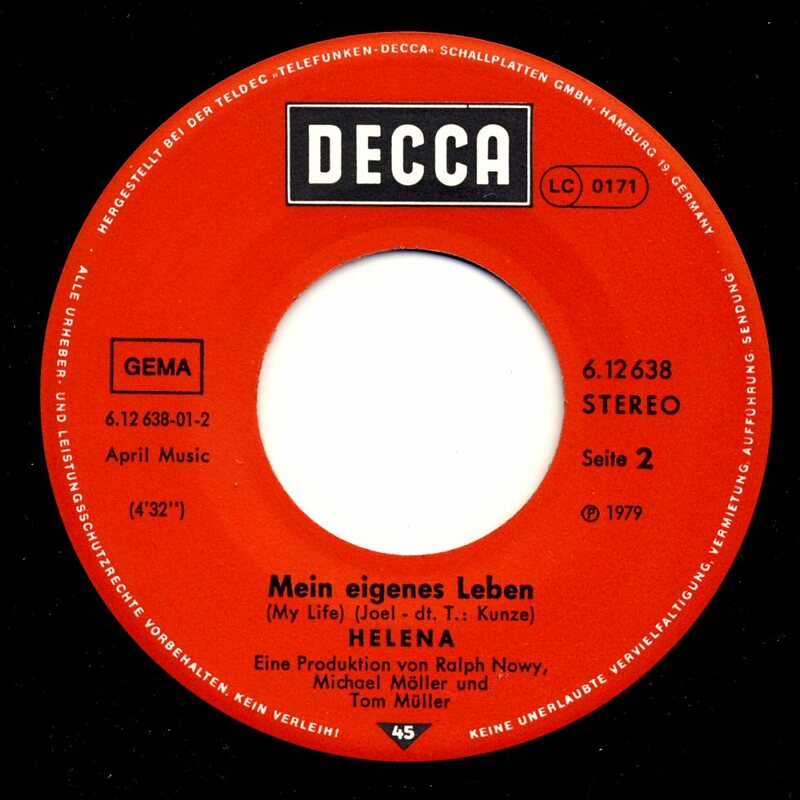 Helena became a big schlager star in East Germany already at the beginning of 1970s. 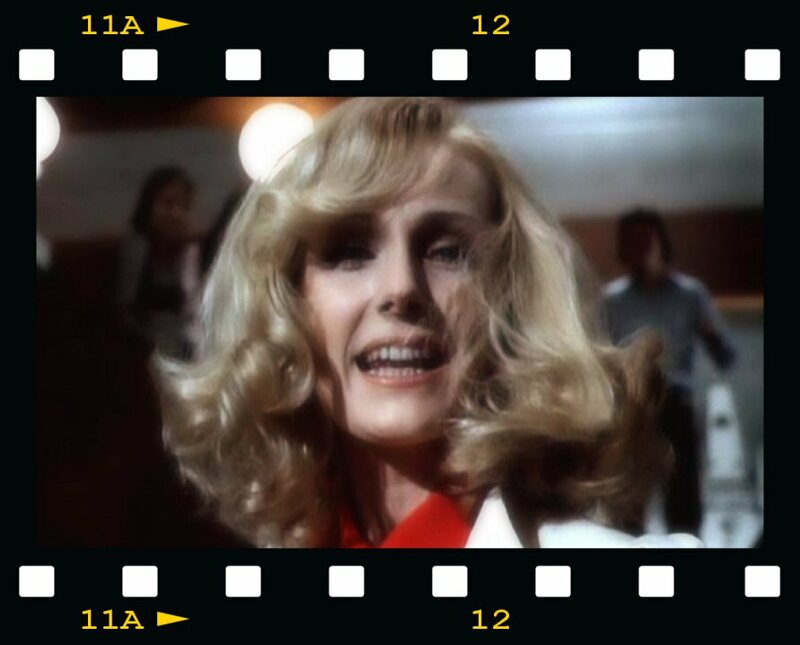 In 1973 she released a single by the record company Amiga with two smash hits in her homecountry: "Fanfan" and "Die kleine Jane" (Little Jane). 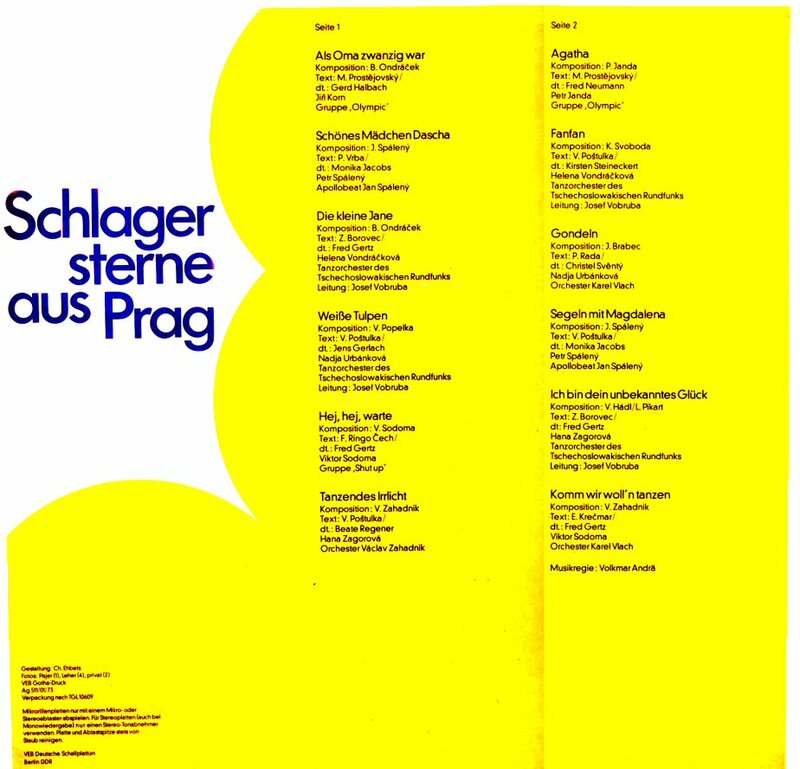 Both songs were even released on a compilation album "Schlagersterne aus Prag" which was released the same year. 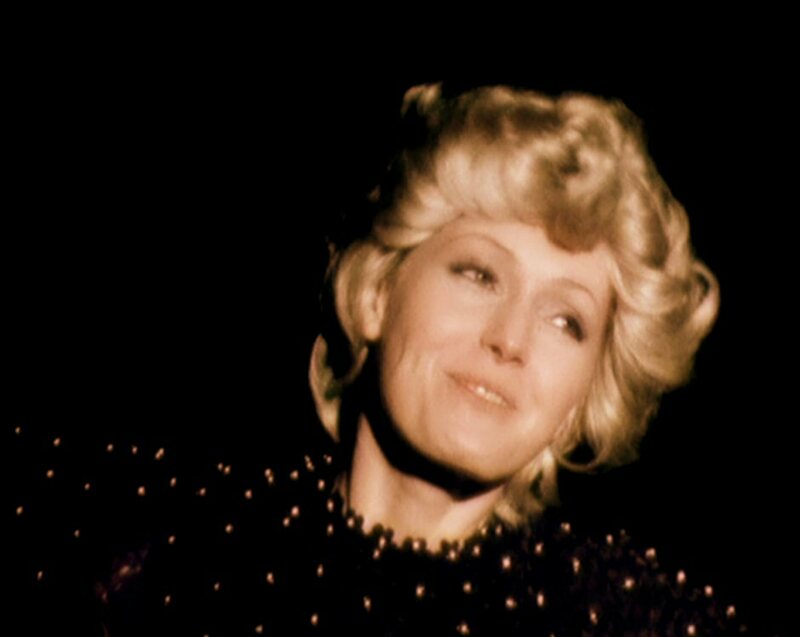 The movie "The night on Karlstejn" (Noc na Karlstejne) with the music of Karel Svoboda had its premiere in 1973 and became one of the most important milestones in Helena's career even if she did not acted in it. 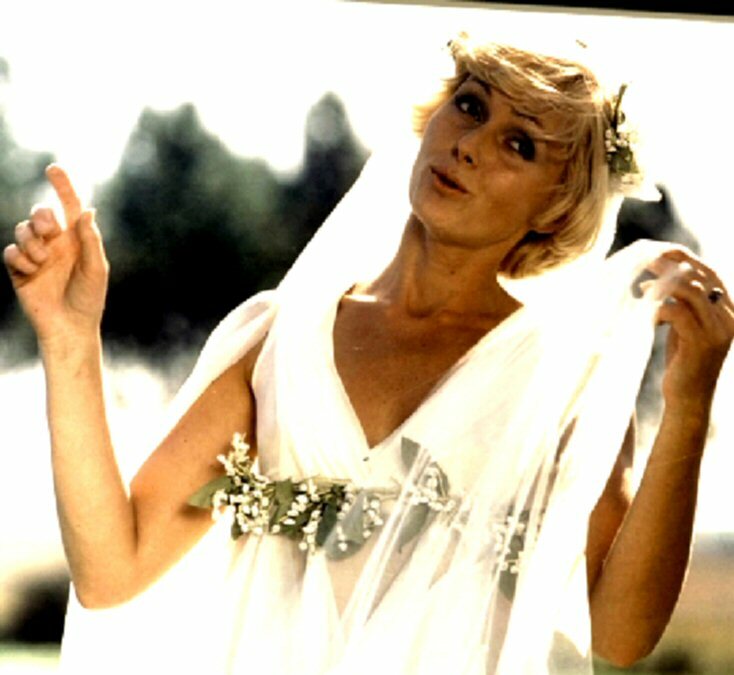 Helena performed one of her biggest hits in the movie "Lasko ma ja stunu". The soundtrack from the movie would be released on LP in 1975. 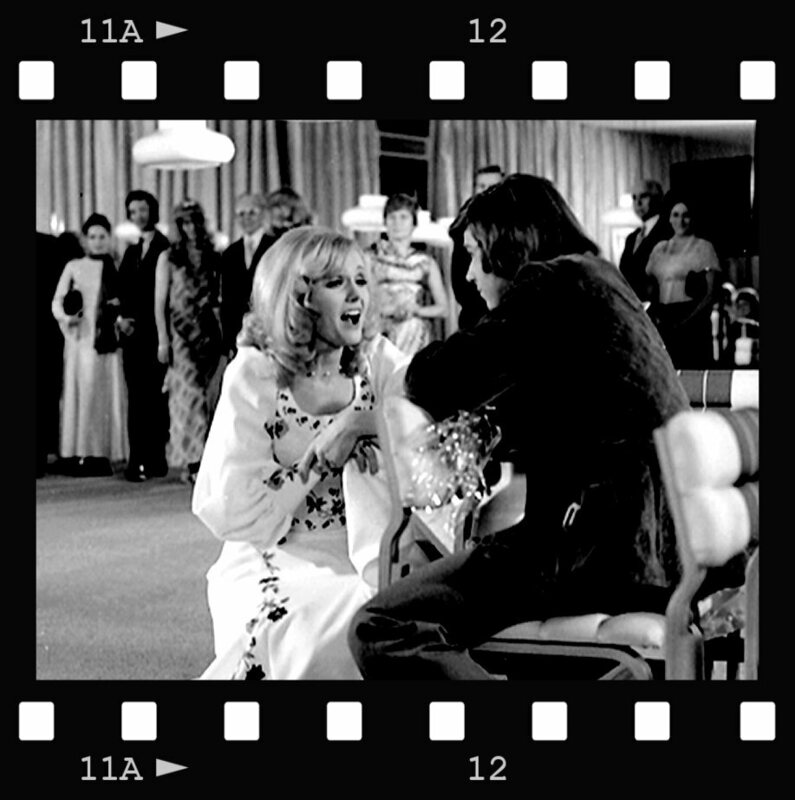 A special video clip for the song was filmed. 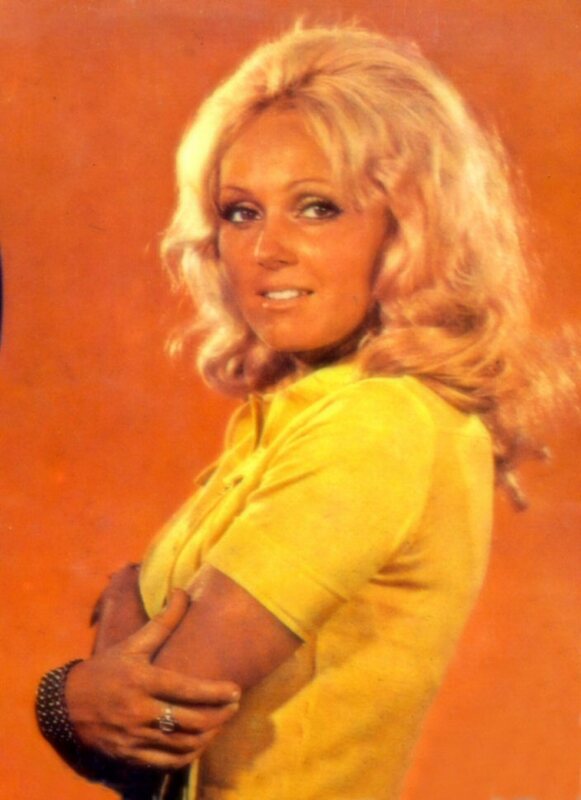 The most successful Helena single in 1973 was her Czech language version of the world hit "Mama Loo" entitled in Czech "Ma te rad" b/w "Sul a med" (Salt and honey). 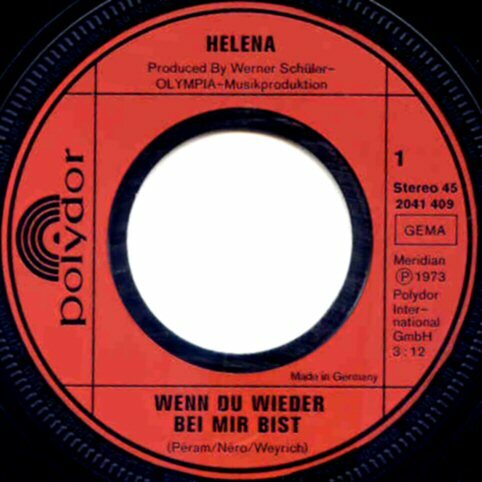 The record company Polydor in West Germany released in 1973 the single "Wenn du wieder bei mir bist" b/w "Wenn du mich liebst". 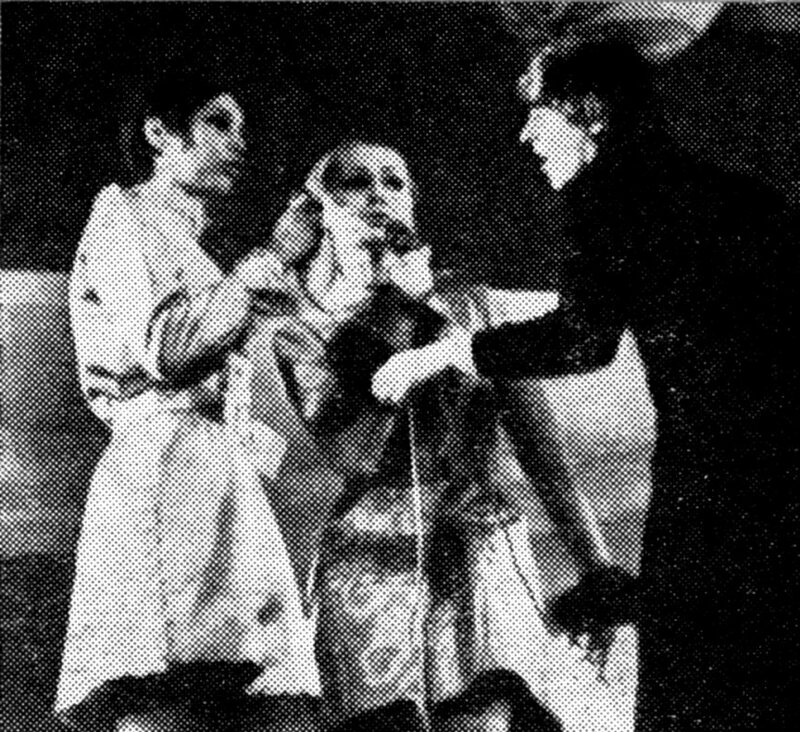 In June 1974 Helena started collaboration with the group "Stryci". 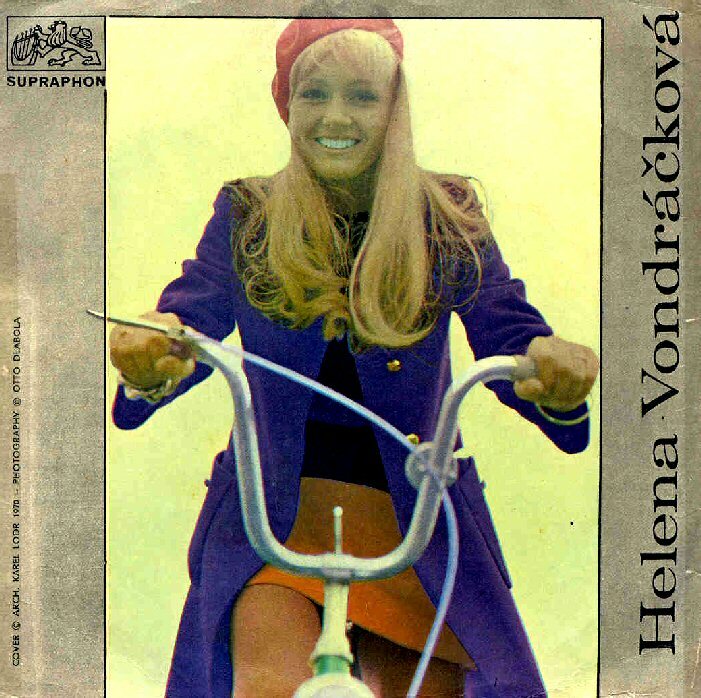 The first album "Helena a Stryci" was recorded in June 74 in Prague. Helena and Stryci would work together for 7 years to come. After the recording of the album Helena and her group left for an international tour which started at Friedrichstadtpalast in Berlin and ended in Japan. 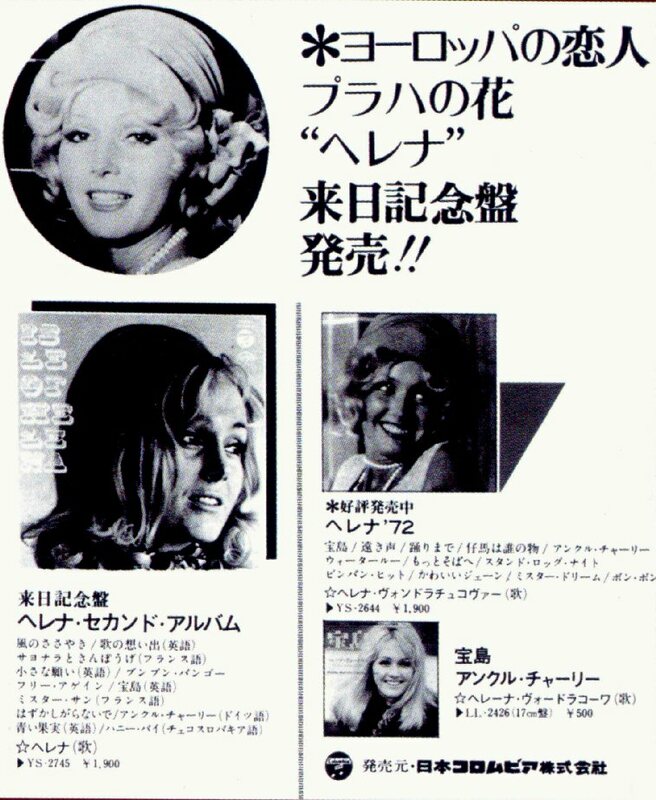 Helena was featured in the third issue of the music magazine "Melodies" in 1974. The picture of Helena was on the cover of the magazine in which Helena gave a big interview. Helena had always loved the songs of Roberta Flack and she recorded one of the absolute favorites "Killing me softly" in Czech language version. The song became hit Helena likes to perform it live on her concerts. 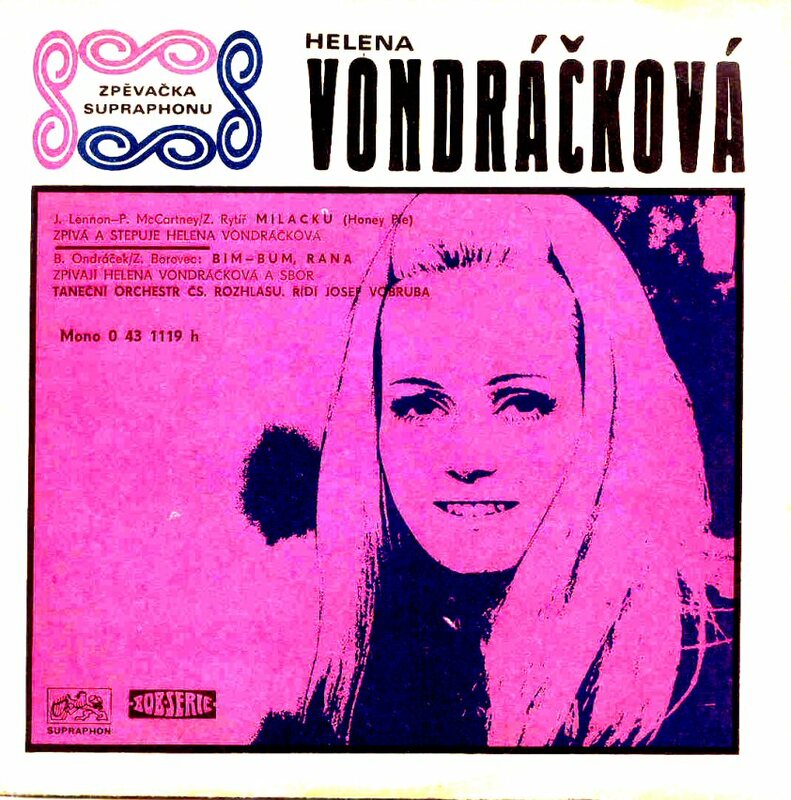 The 1974 album was entitled simply "Helena Vondrackova" on the front cover and "Helena Strýci" on the back cover. 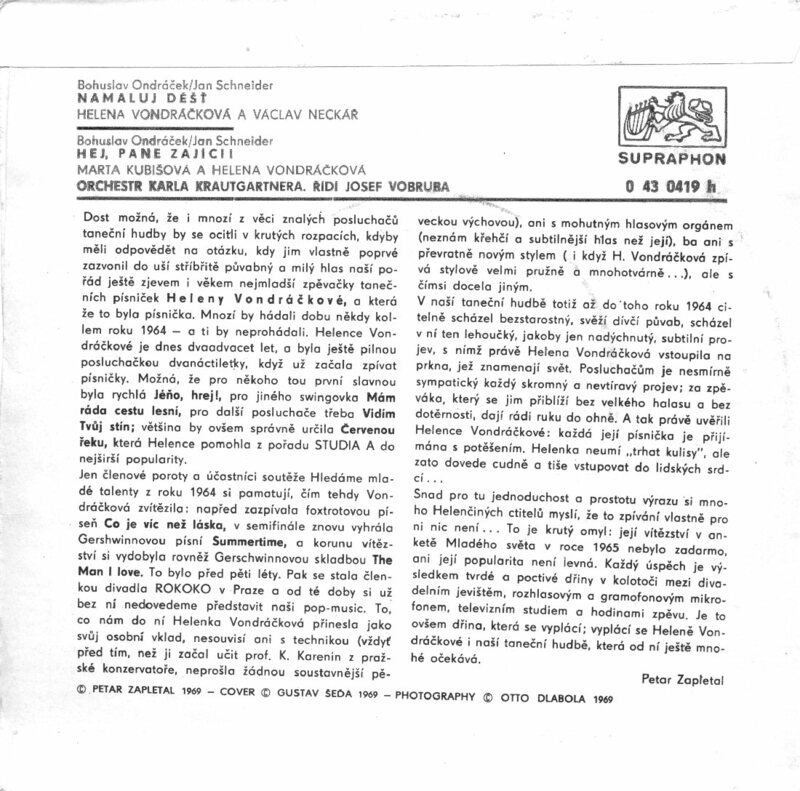 The title of the CD re-release of the album in 1999 would be changed to "Helena & Strýci". 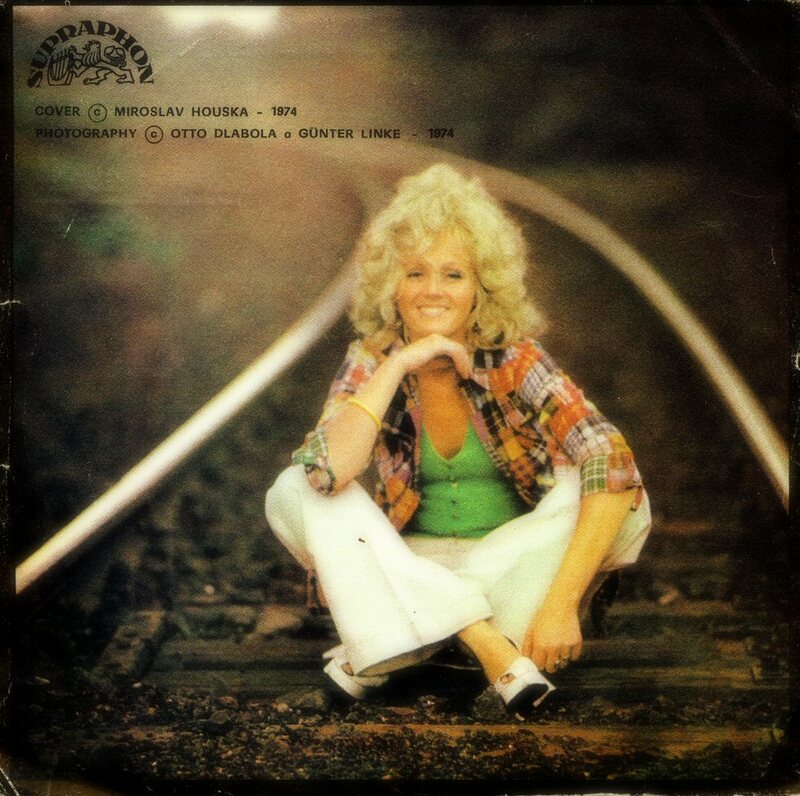 The album featured 12 new songs including covers of Burt Bacharach's hit "Raindrops Keep Falling on my Head", Shirley Bassey's UK hit from 1971 (24 weeks on the UK chart) "For All We Know". 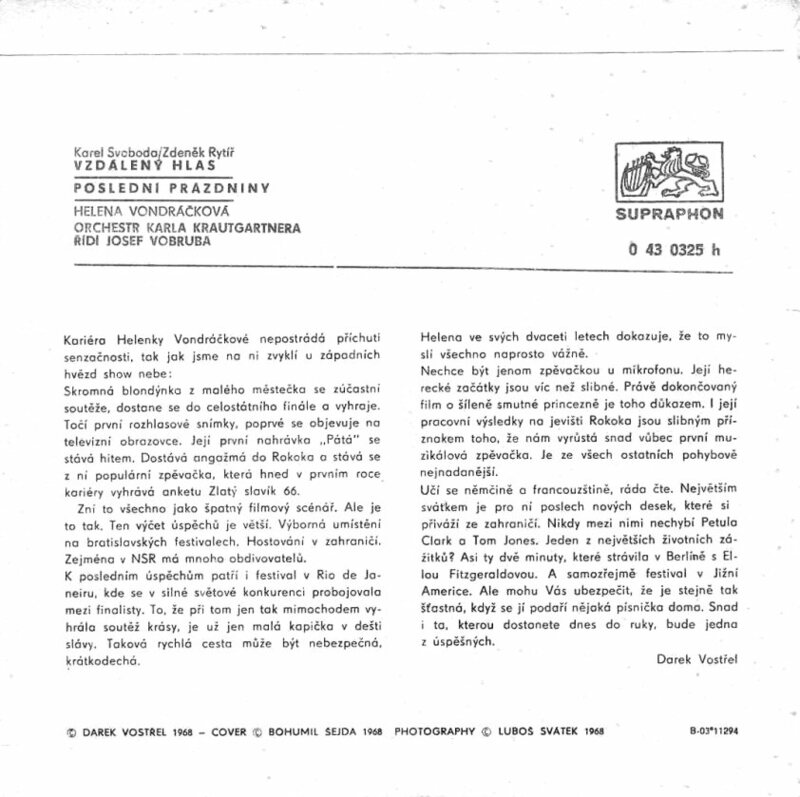 Even The Beatles' hit "With a Little Help From My Friends" was included on the album but it was not released on the 1999 CD version of the album because the record company did not obtain the rights for releasing the song with Czech lyrics. Helena's version of this song is only available on the original album. 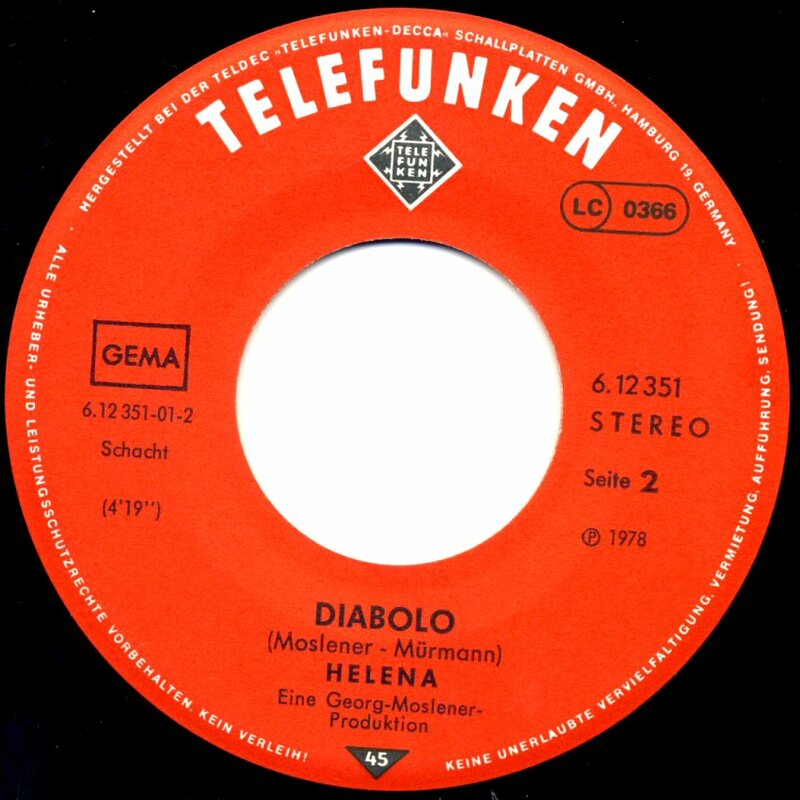 In September 1974 Helena was featured in the East German music magazine "Melodie und Rhytmus". She was even on the cover. Read the article below. 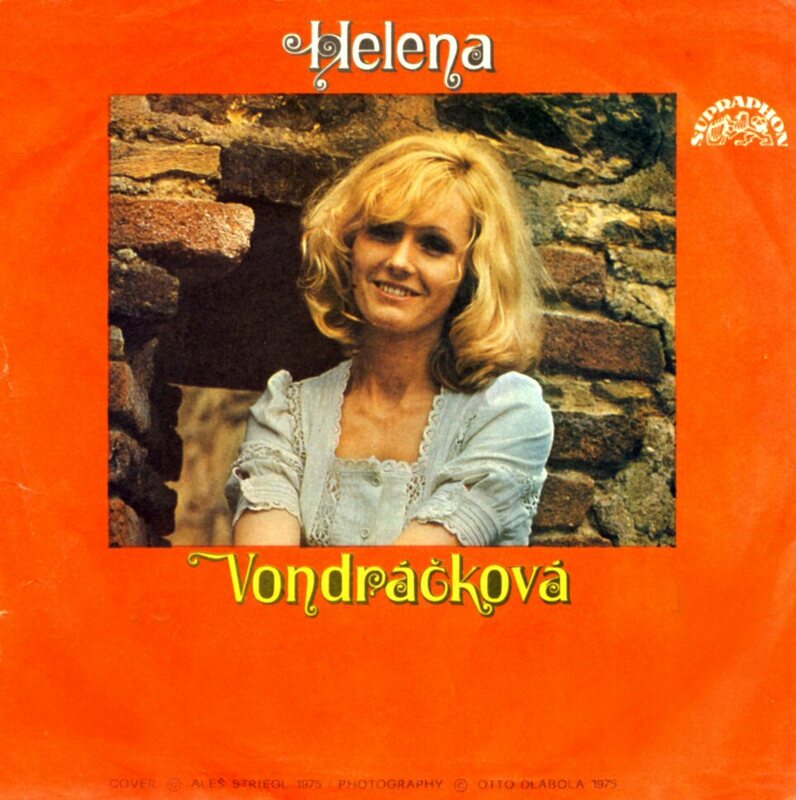 Probably the most fascinating hit story in Helena's career is the song "Malovany dzbanku" - a catchy folk-based pop hit which was recorded by the artist in 1974 and released the same year as a single in Czechoslovakia. The single became quite successful in Helena's homeland but nobody thought by that time that it would become the greatest Helena hit in the neighbour country Poland two years later. 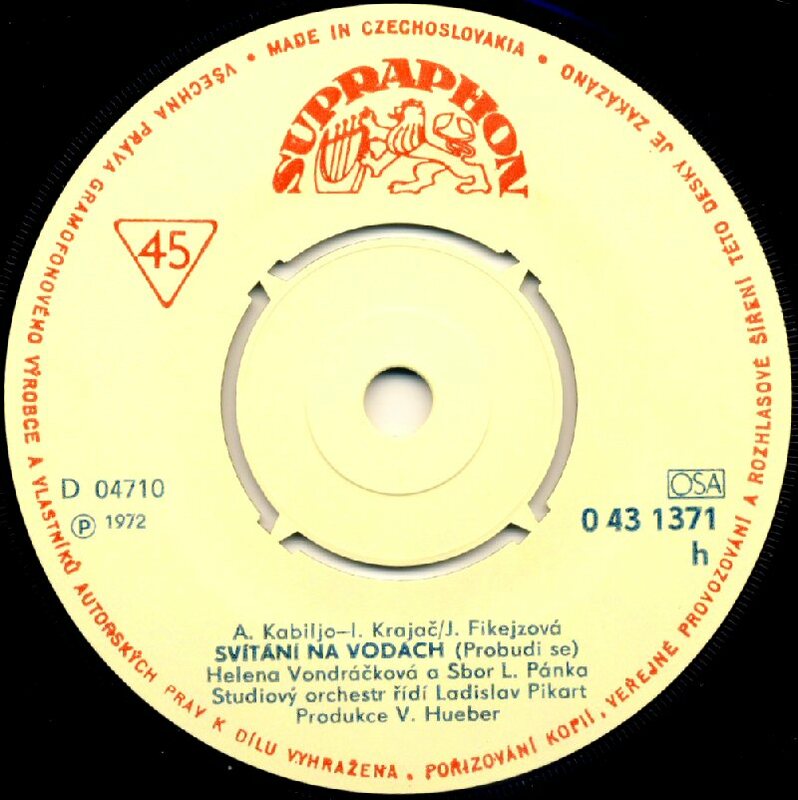 The B-side of the single featured the Czech version of the song "Sugar Me" originally the UK Top 5 hit from 1972 recorded by Lynsey De Paul. 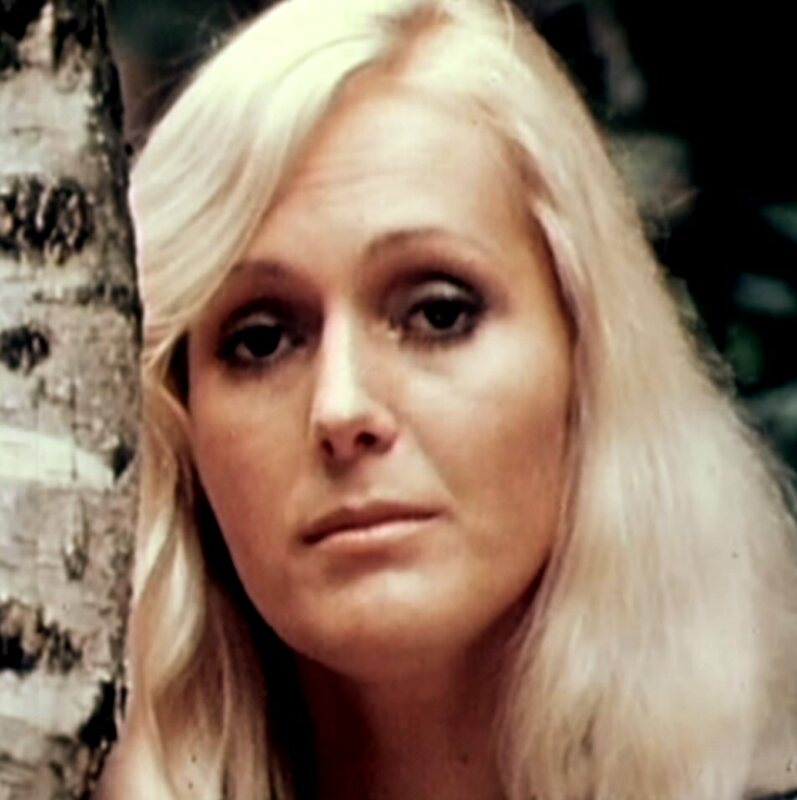 Helena recorded several videos to her songs in 1974. 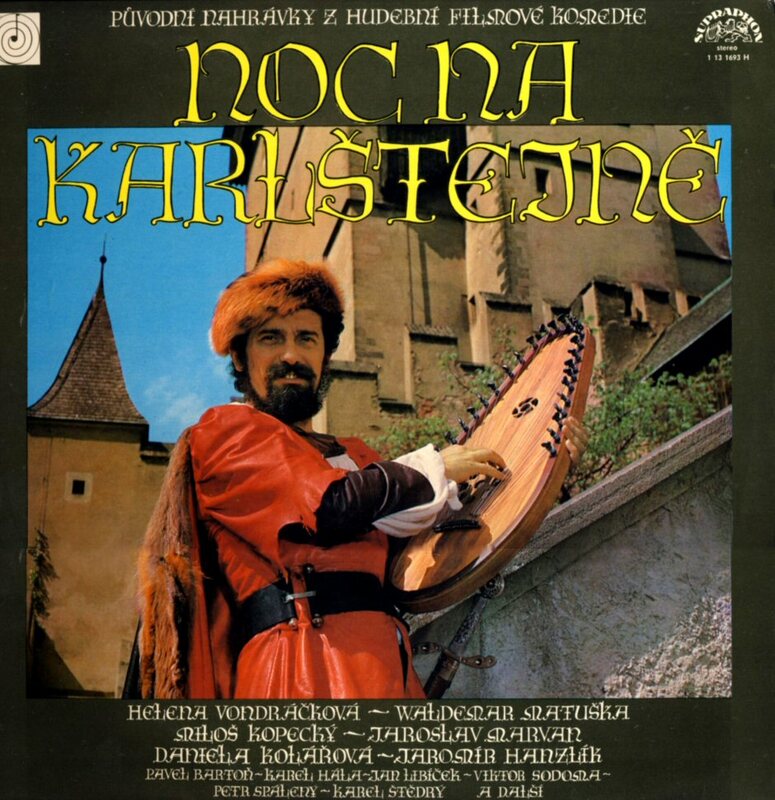 In 1975 several songs performed by Helena were used in two Czechoslovakian films: "Romance za korunu" (Romances for one crown) and "Noc na Karlstejne" (The night at the Karlstejn castle). The single release from the latter one featured one of the biggest Helena hits ever "Lasko ma, ja stunu" b/w "Do vezi". The both songs had been composed by Karel Svoboda. 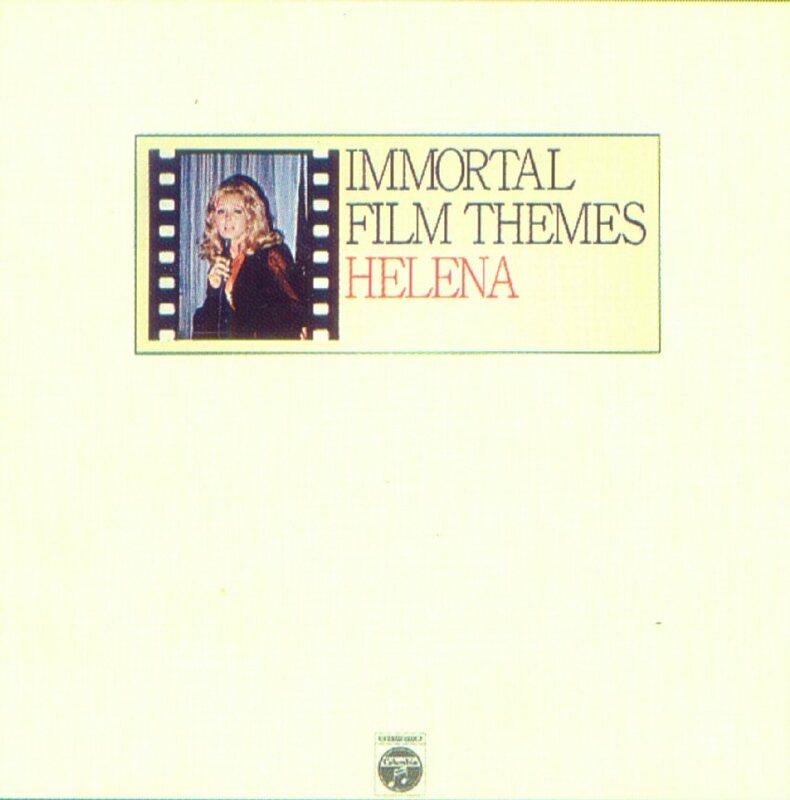 Even a complete film soundtrack featuring Helena on two tracks was released on LP at the same time. An extended photo session at the Karlstejn castle outside Prague was taken by photographer Otto Diabola. 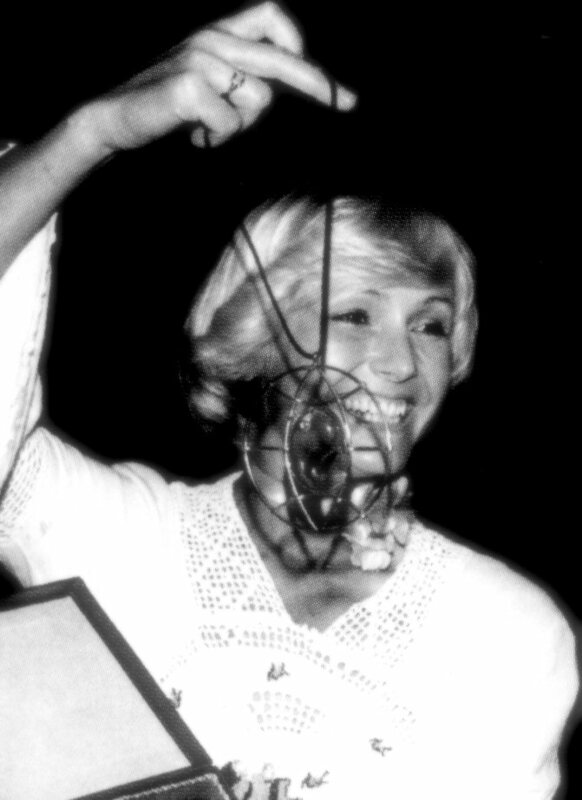 Helena enjoyed success on the annual song festival "Bratislavska lyra" where she received second prize (Silver lyre) for her performance of the song "Láska zůstává dál". 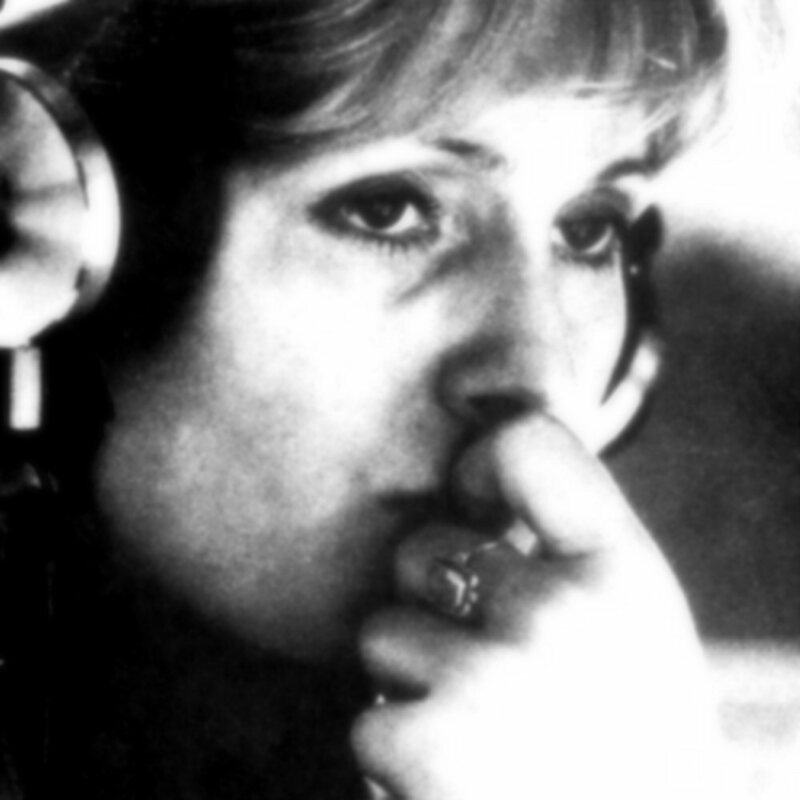 In September 1973 Helena was in the studio and recorded the album "Film Melodies" in English. 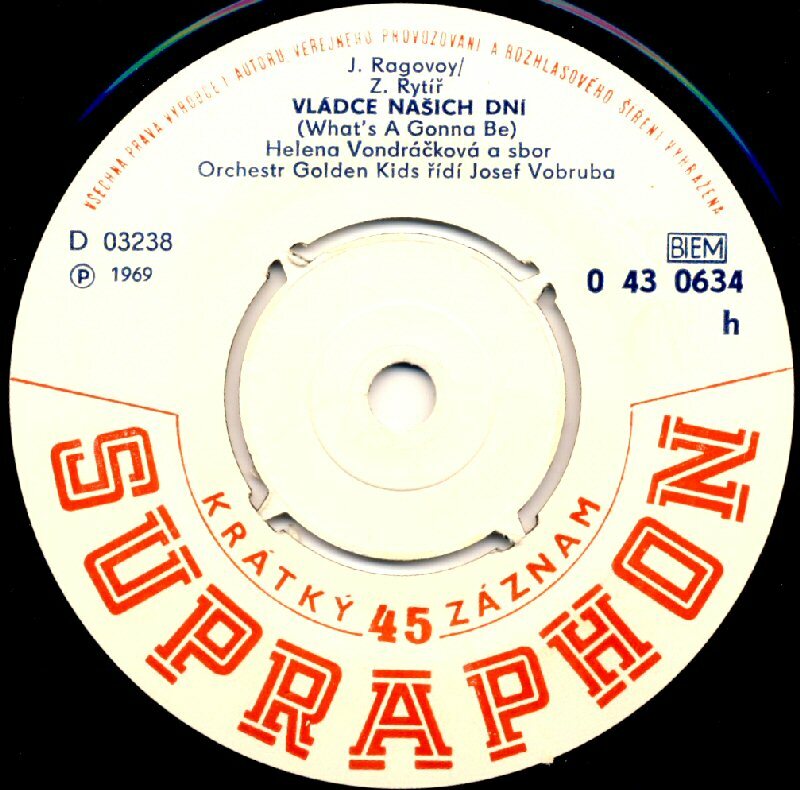 The album was a co-production between Nippon Columbia in Japan and Supraphon in Czechoslovakia. The arrangements and the orchestral playbacks originated from Tokyo, while the vocal parts were mostly synchronized in Prague. Twelve evergreens were chosen for this project and the album was released in 1975 both in Czechoslovakia and Japan. 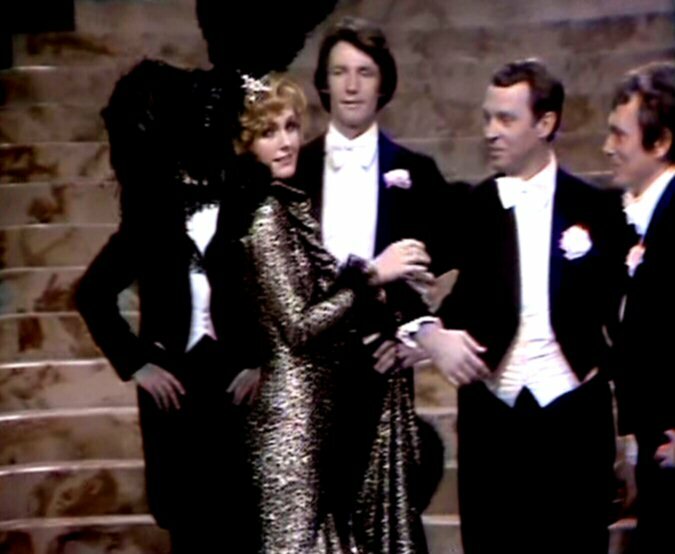 In 1975 Helena acted in the film "Romances for one crown". 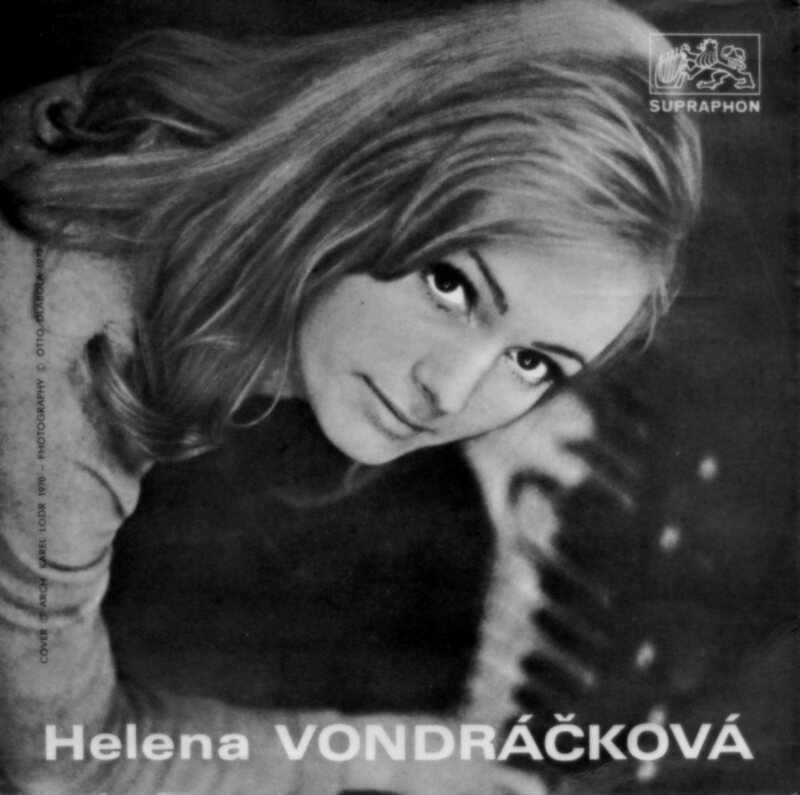 She played herself - the pop star Helena Vondrackova. 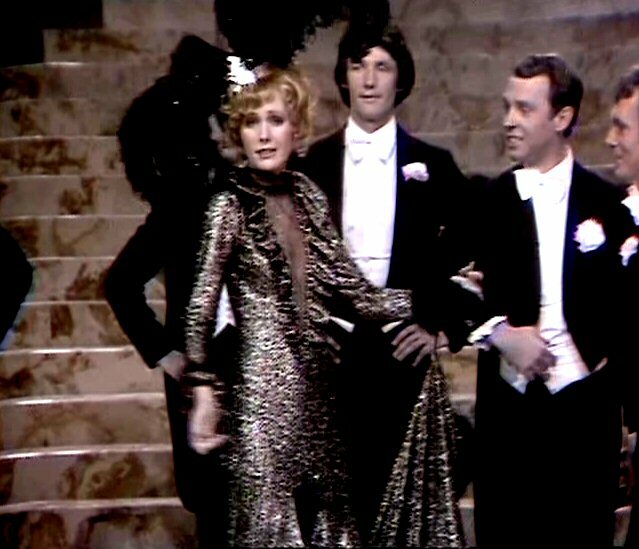 In the movie she performed several songs written by Karel Svoboda. 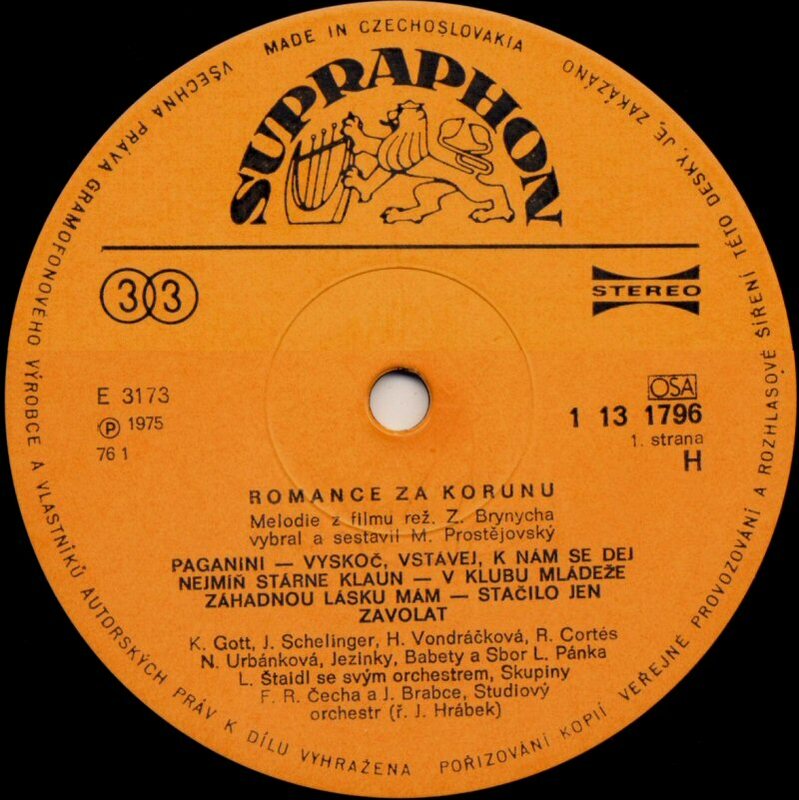 The soundtrack for the movie "Romance za korunu" (Romances for one crown) was recorded in January 1975 and the LP was released after the premiere of the film in Czechoslovakia. Helena performed 5 songs both solo and together with other artists as Karel Gott, Jiri Schelinger. In the TV special "9 apples for Helena" she performed her latest hits solo and duets together with her guests - one of them was Karel Gott. 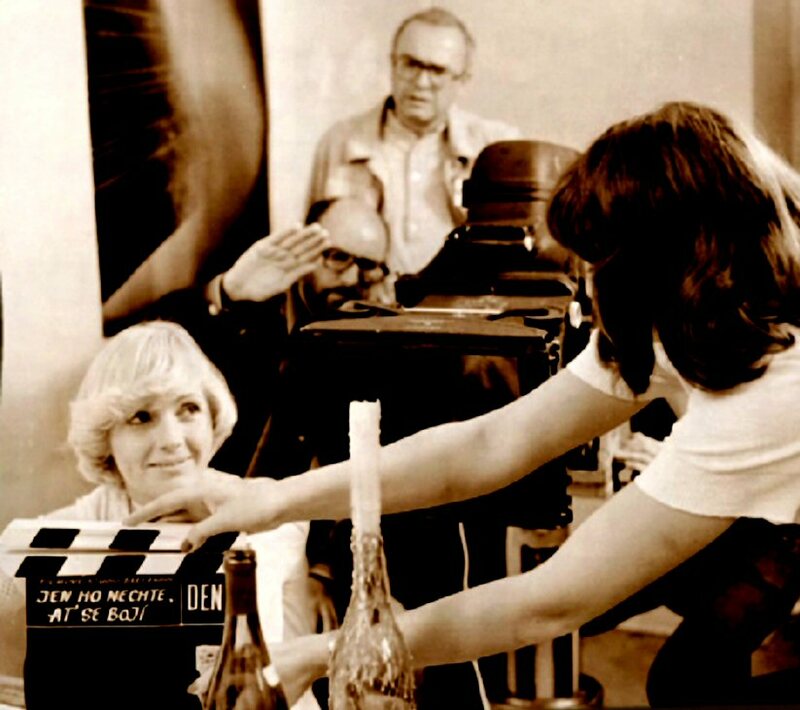 The 1974/75 film comedy "Jak utopit doktora Mracka" (How to drown doctor Mracek) featured soundtrack performed by Helena and Vaclav Neckar. 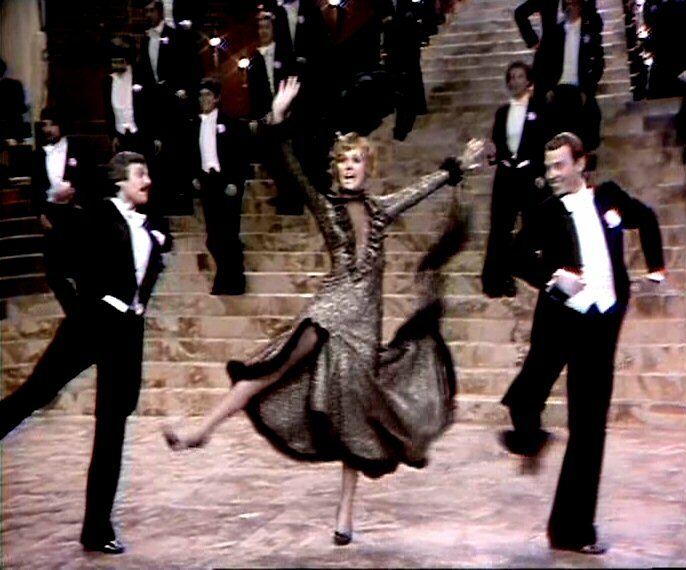 The last 1975 Helena single came just from this movie and was entitled "Znala panna pana" (A girl who knew a guy). At the beginning of the year Helena released a new single containing "Tremou nedychas" (Stage-fright) b/w "Laska tvoje jmeno ma" (Love has your name). 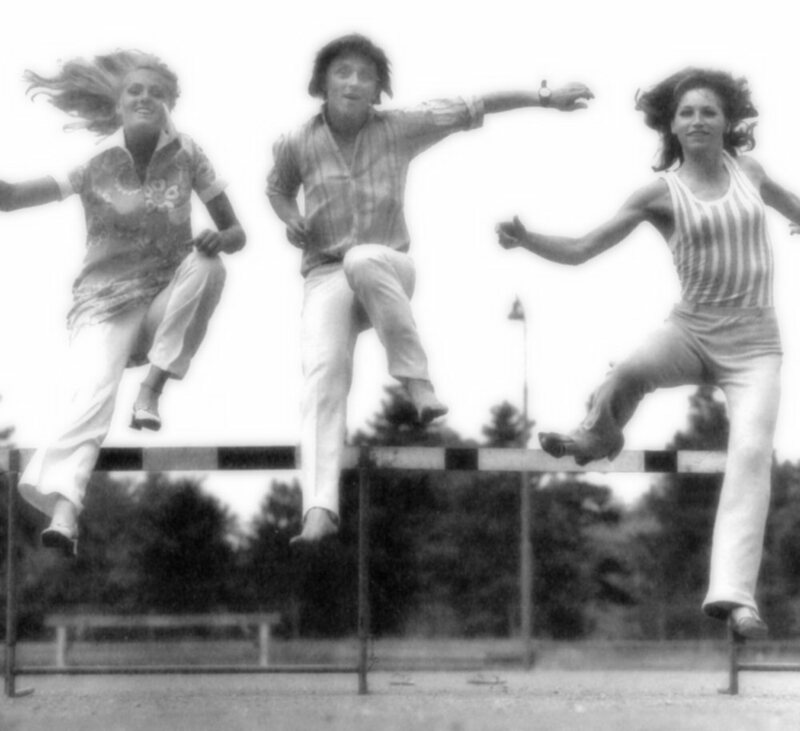 The cover photo had been taken in 1975. 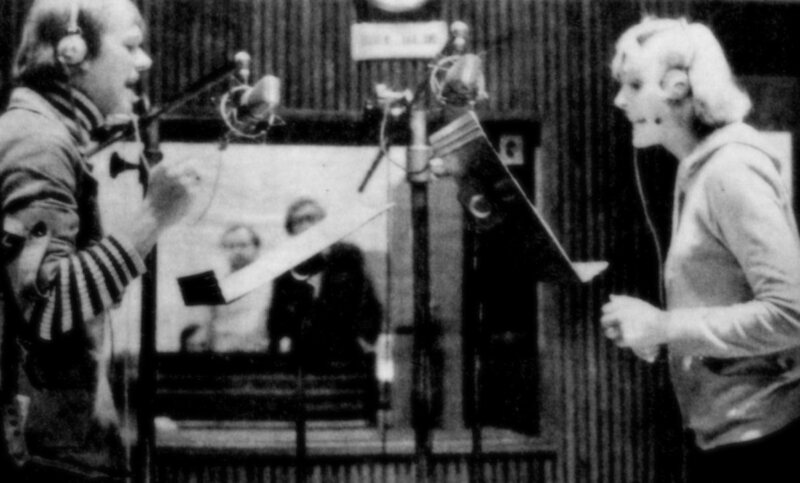 In June 1976 Helena recorded 4 songs for a forthcoming tribute album celebrating a famous Czech composer, song writer and actor E.F. Burian (1904-1959). 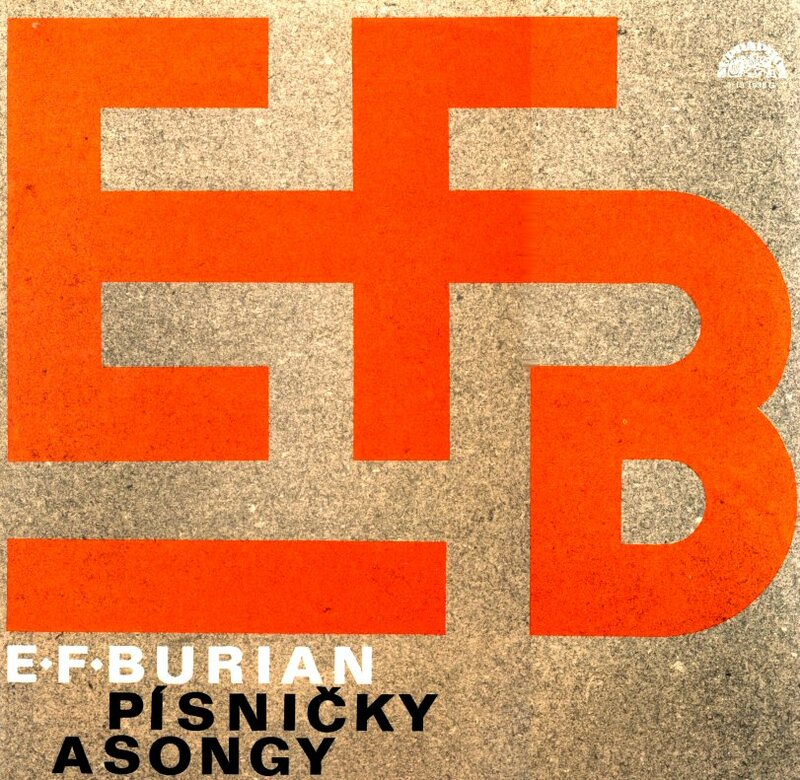 The album entitled simply "The songs of E F Burian" was released later the same year and today it's very hard to find rarity for all Helena fans. 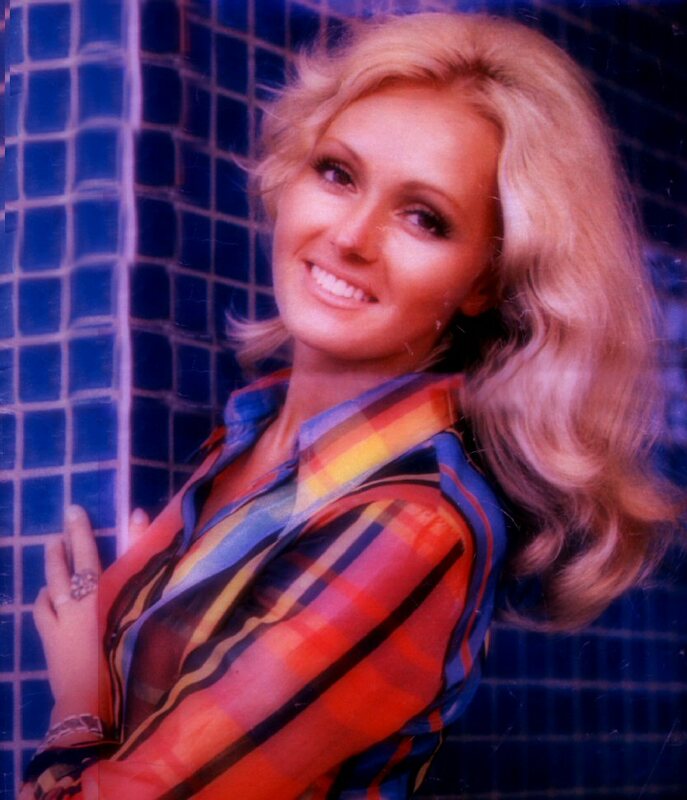 In the summer 1976 the photographer Pavel Jasansky arranged an extended photo session with Helena. The photos from this session would be used on the cover of the forthcoming 1977 studio album as well as on several single covers. 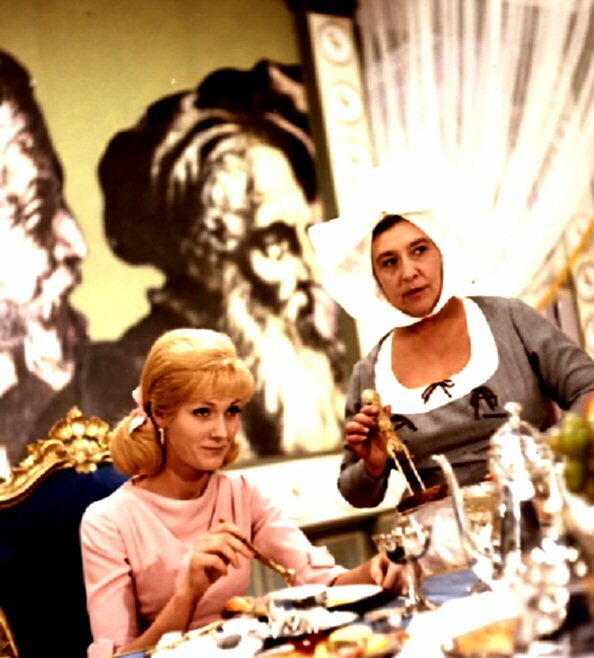 Helena worked a lot in both East- and West Germany. 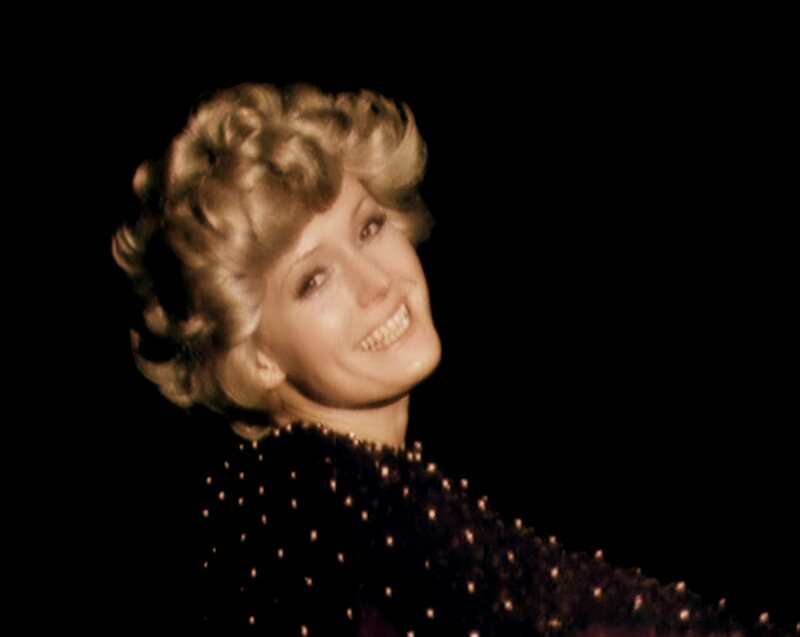 She performed at the Friedrichstadtpalast in East Berlin which is well-known for its great shows with song and dance. 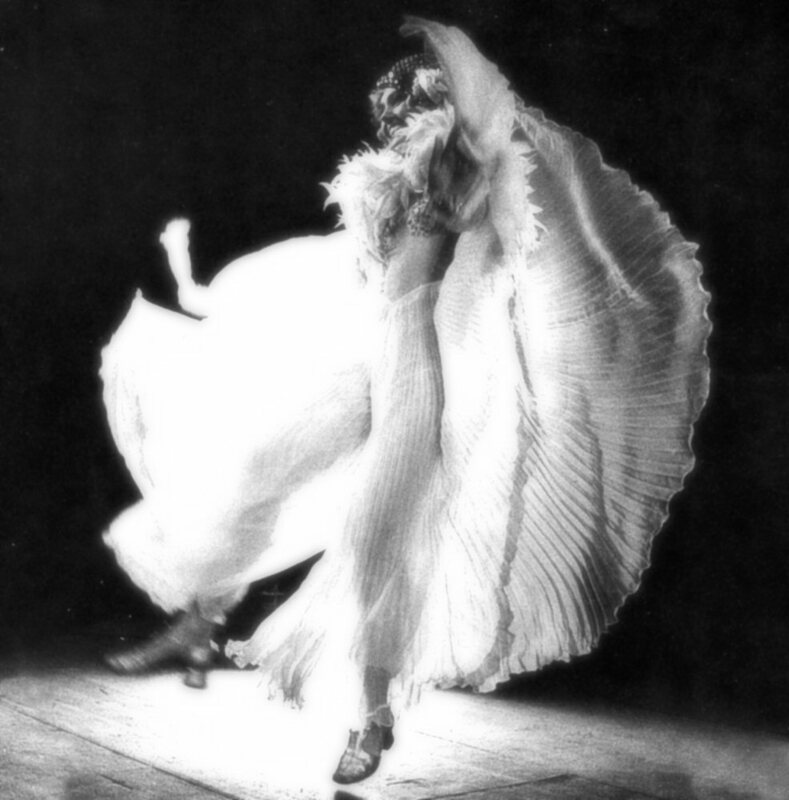 The dance was always an important part of Helena's shows. 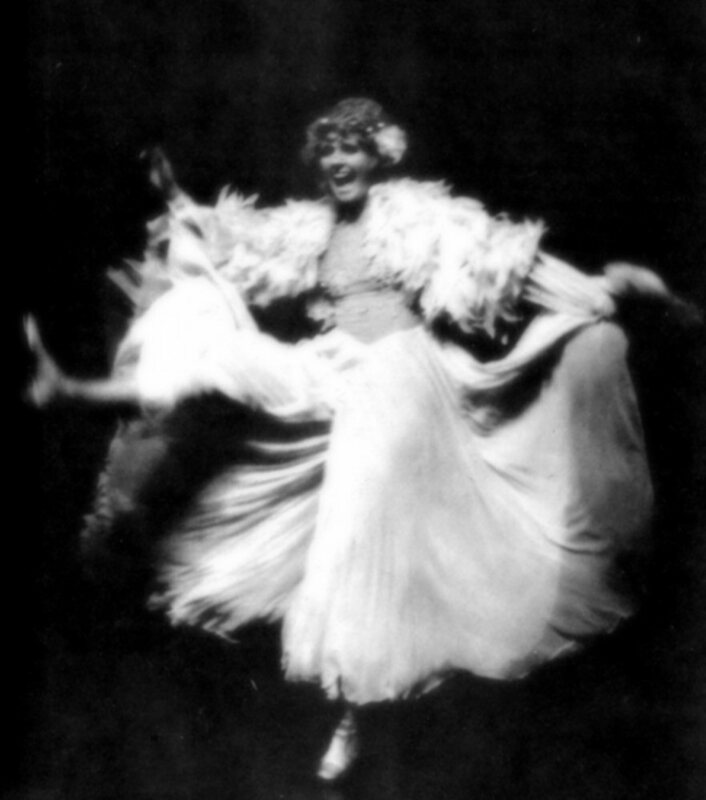 Working with German choreographers was according to the singer herself a great fun. 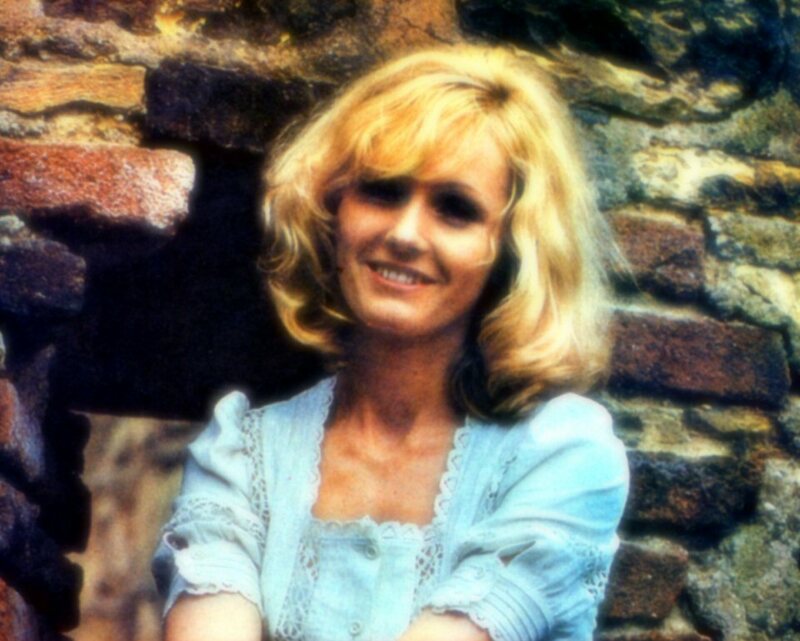 The first hit in East Germany was "Archimede" and in 1976 she had a new hit "Malovany dzbanku" which would be even a smash hit in Poland one year later. Helena performed even in the show "Ein kessel buntes" on German TV. 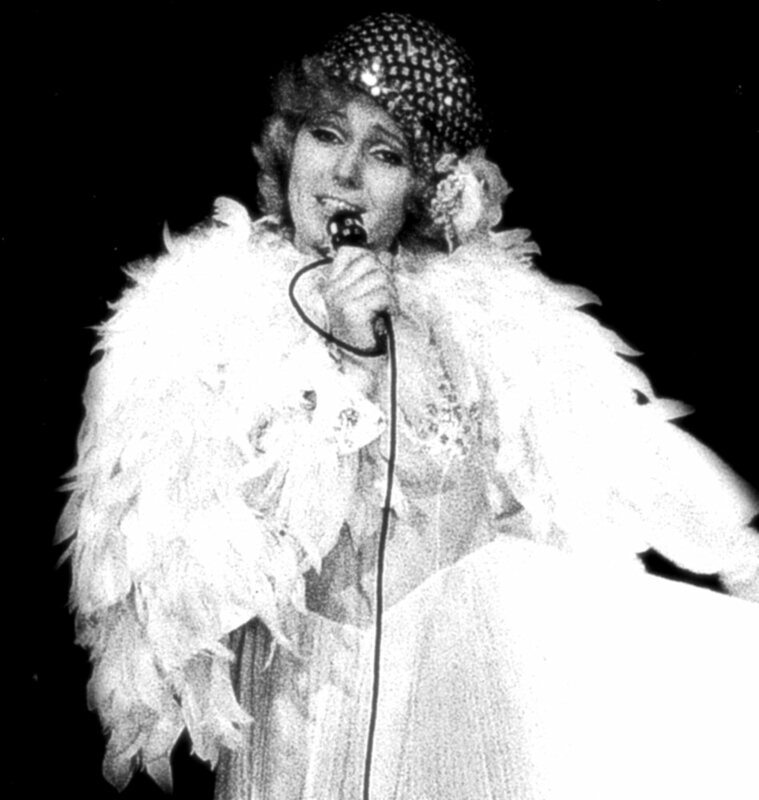 In November 1976 Helena recorded most of the songs written for a new album. The recording sessions were held between 8 and 10 November 1976 at the Dejvice recording studio and one can say that it was a very quick recording session which brought 11 songs. The release of the album would though wait until next year. According to Helena after having recorded the new album she got a personal crisis and the beginning of 1977 it was the period of a quite low artistic activity. 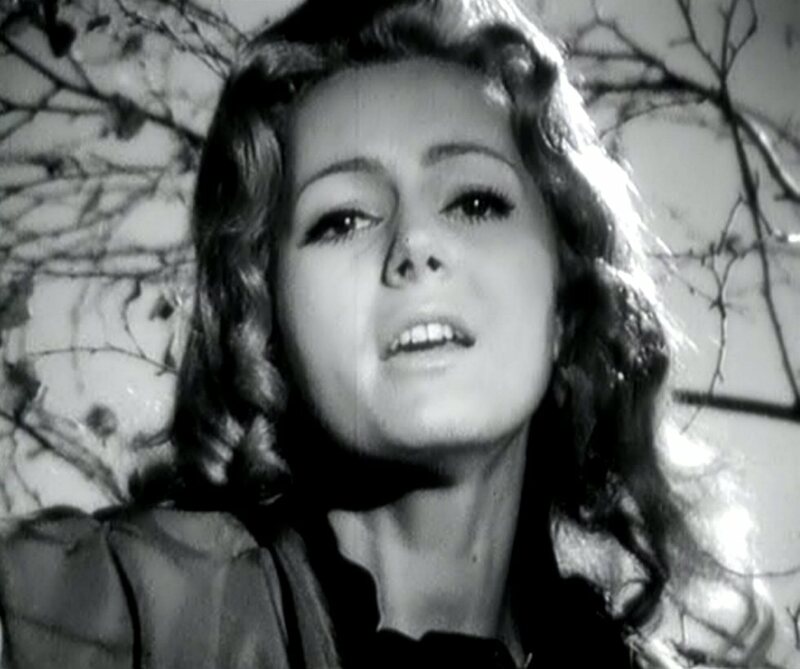 Helena appeared in the TV show entitled "Helena in the mountains" where she among others performed her newest song "Ja a pulmesic" (originally entitled "How high is the moon"). The song would be released on Helena's new single at the beginning of 1977. 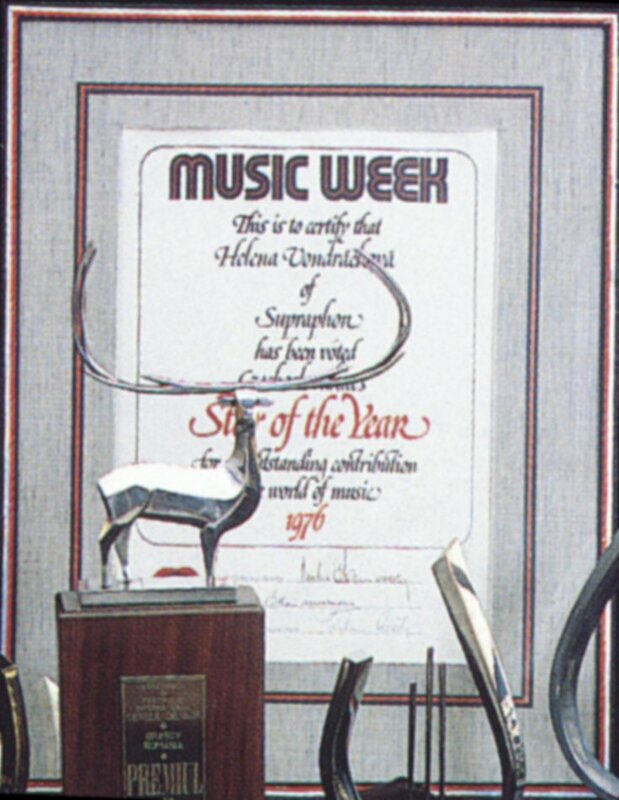 At the end of the year Helena received the award "The Star of the Year" from the British paper "Music Week". 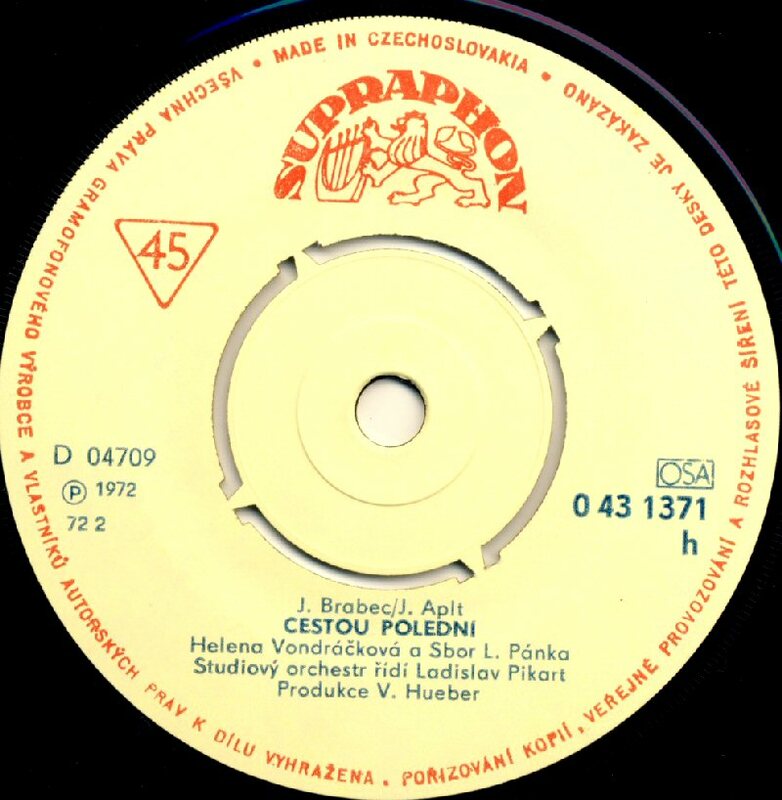 The first single released in 1977 featured the cover version of the classical composition "How High Is The Moon" which received the Czech title "Ja a pulmesic" (Me and the moon) on the A-side and the song "As pujde dest do travy spat" (When the rain gets asleep in the gras) on the B-side. 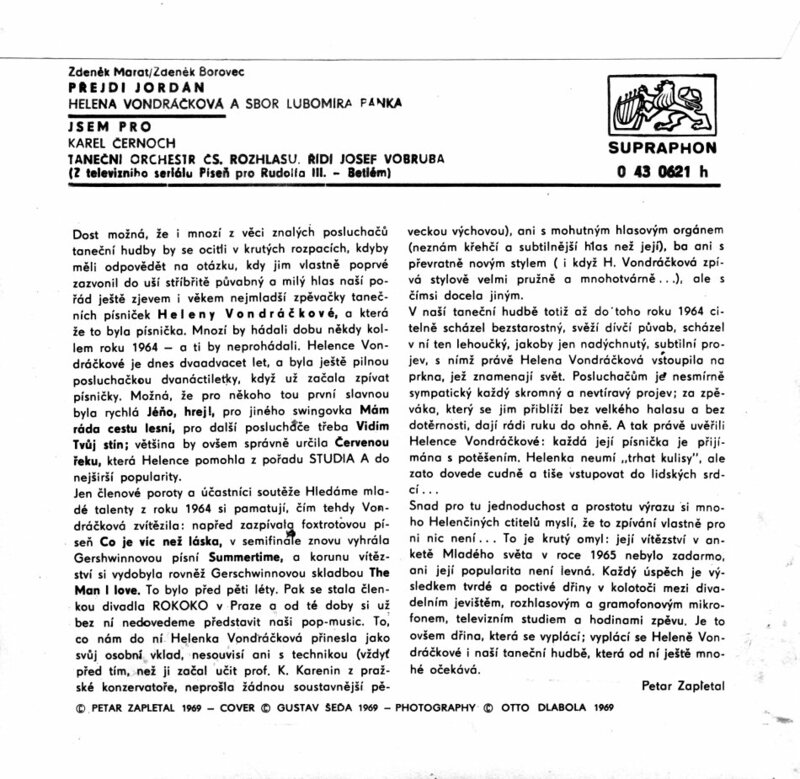 The both songs had been recorded in the summer 1976 and the first one would remain only single track never released on any Helena LP until 2001 when it appeared as a bonus track on the CD remaster "S pisni vstric ti bezim". The song from the B-side was put on as the opening track on the new album. The first single promoting the new album featured two new songs recorded during the studio sessions in November 1976. On side A "Ctyrlistejcek" (Four-leaf clover) and on side B "Pampelisci pisen odkvetani" (The dandelions song about flourishing). 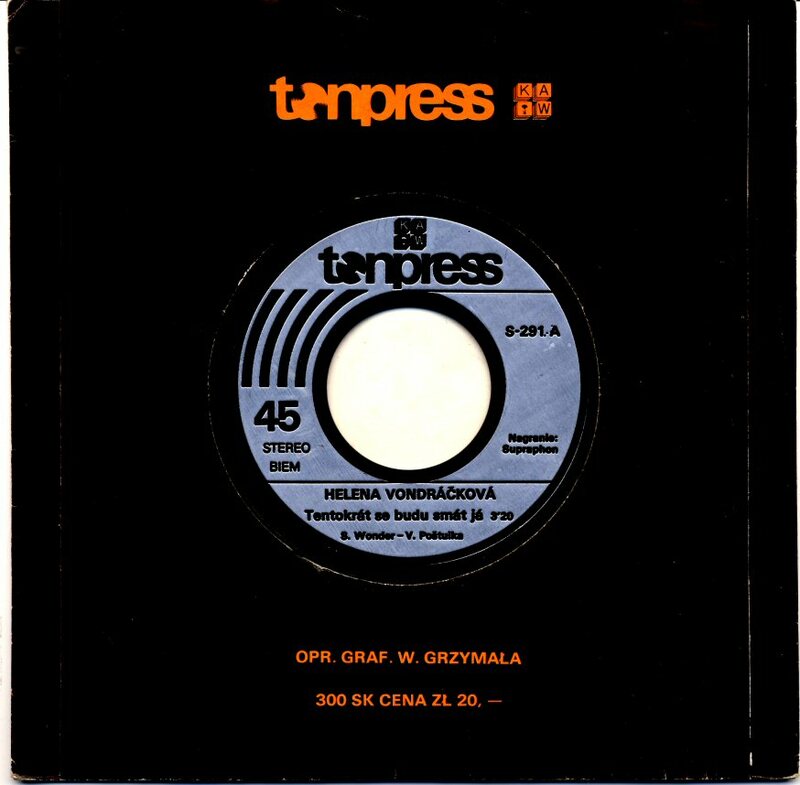 Even the Polish record company "Tonpress" released "Ctyrlistejcek" in Poland with another selection on the side B ("Trapim se jen vlastni hlouposti"). The Czechoslovakian music magazine "Melodies" published an extended interview with several new pictures in its issue 3/1977. Helena was talking about her work, success and career abroad. The new studio album released in 1977 was entitled "S pisni vstric ti bezim" (I'm running With a Song To You). It featured 12 new songs and the recording sessions had taken only 3 days at the beginning of November 1976 in the recording studio "Dejvice" in Prague. Surprisingly the album did not bring any big single hits even if it contained a lot of nice compositions delivered by a.o. Jiri Vondracek, Bohuslav Ondracek, Jan Neckar and Jiri Malasek, four experienced and talented composers in Czechoslovakia. 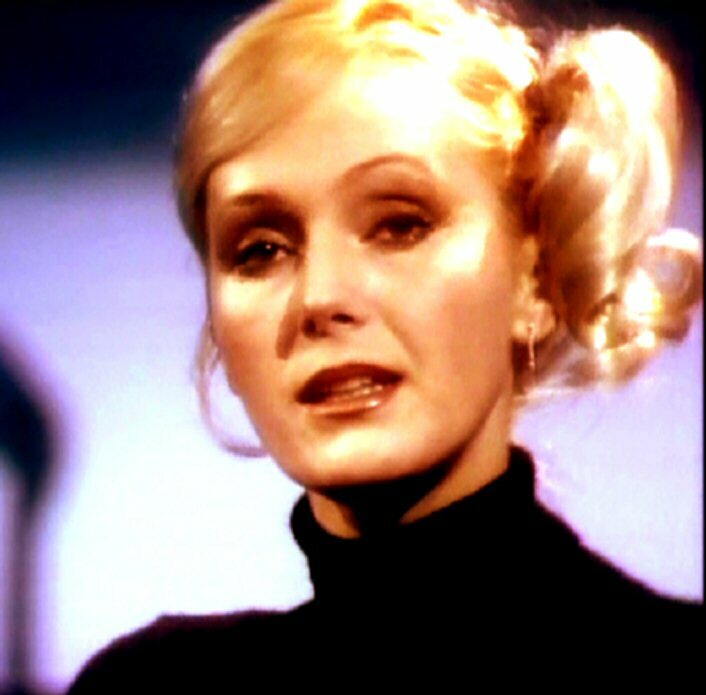 Helena released several singles during the year 1977. 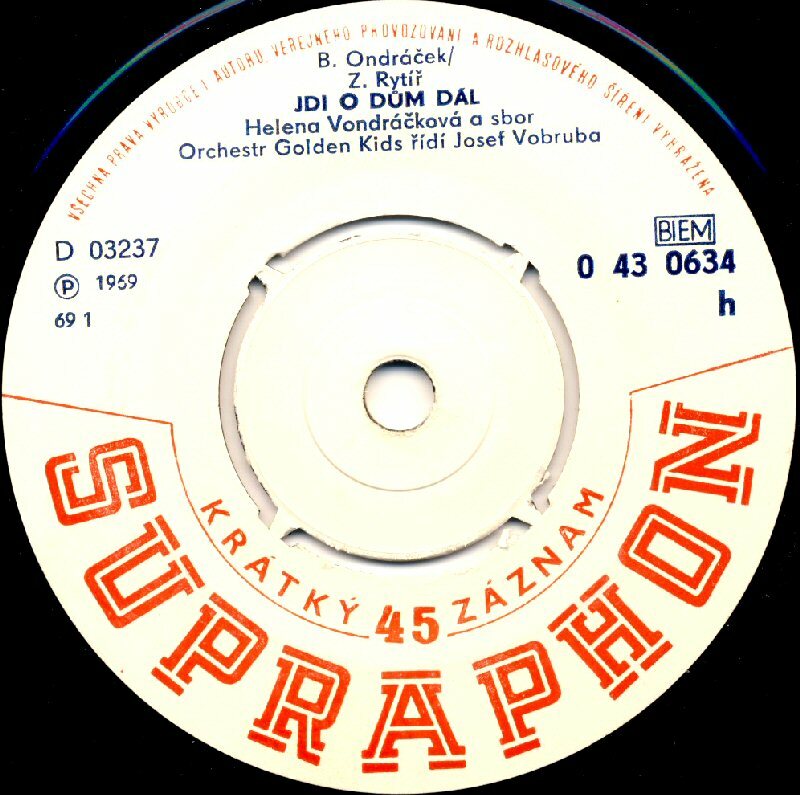 Most of the songs released on the singles were great hits in Czechoslovakia. One of them was "Muj maly zazrak" and "Chytila jsem motylka" a cover of well-known international hit "I Only Want To Be With You". 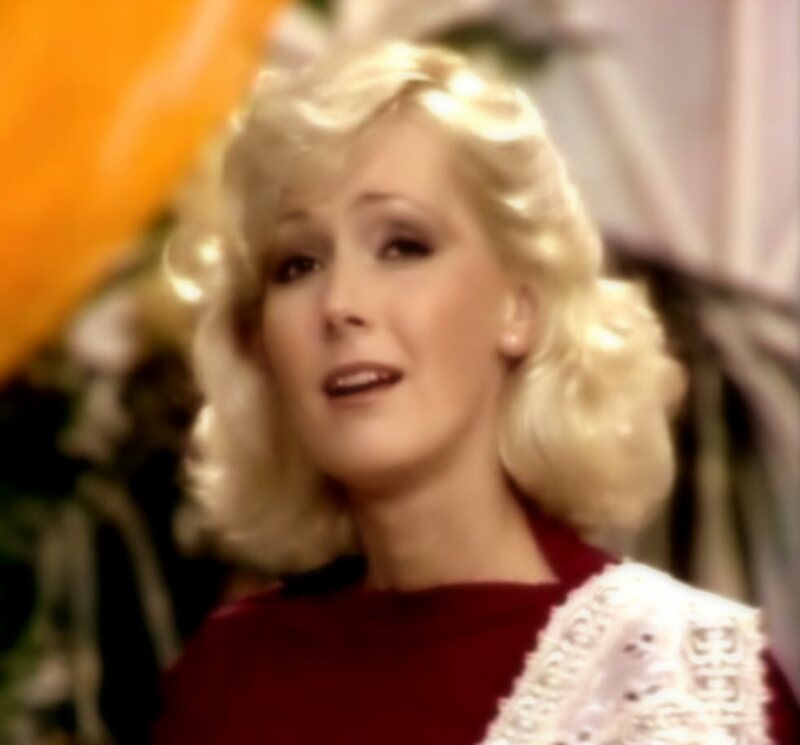 But the hit of the year was the cover version of the Brotherhood of Man's Eurovison 1976 hit "Save Your Kisses For Me" which Helena recorded together with Jiri Korn in December 1976. 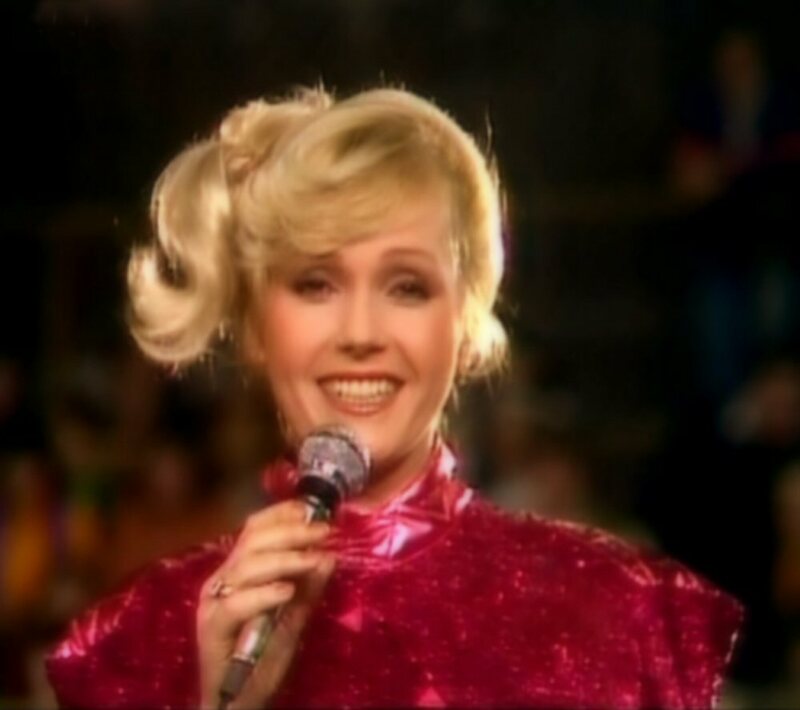 The song got its Czech title "Ja pujdu tam a ty tam" (I will go there and you there) and the single which came out in 1977 became a huge hit in Czechoslovakia. 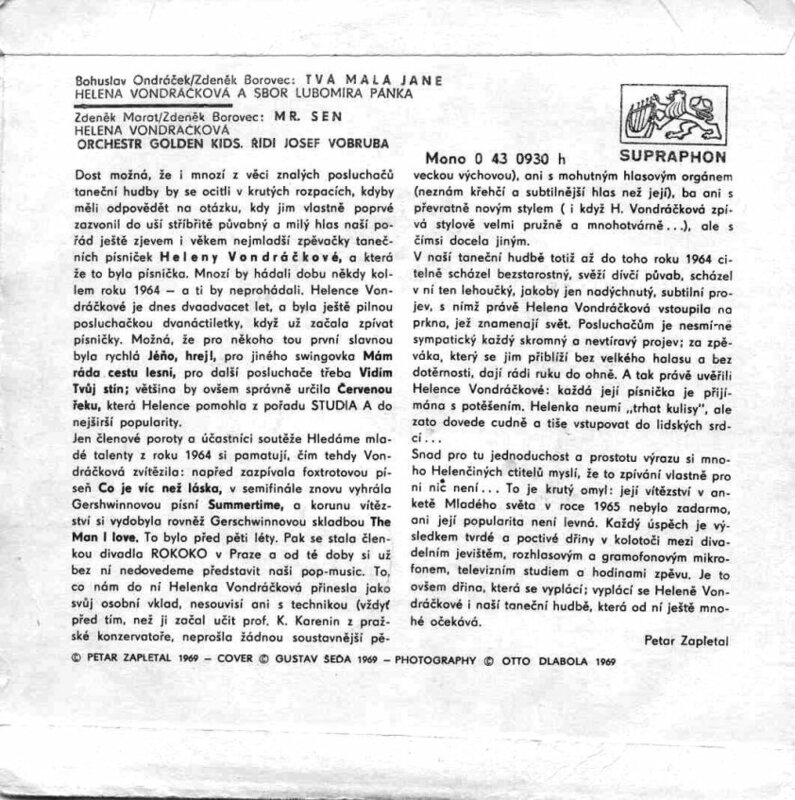 Even the B-side of the single contained the song which became a great hit "Malo mam lasky tve" (I've Got Not Enough of your Love) written by Hungarian composers Peter Mate and Istvan Nagy. In the spring Helena played the main part in the movie picture "Jen ho nechte, at se boji". She acted a young singer and she even sang several songs in the film. 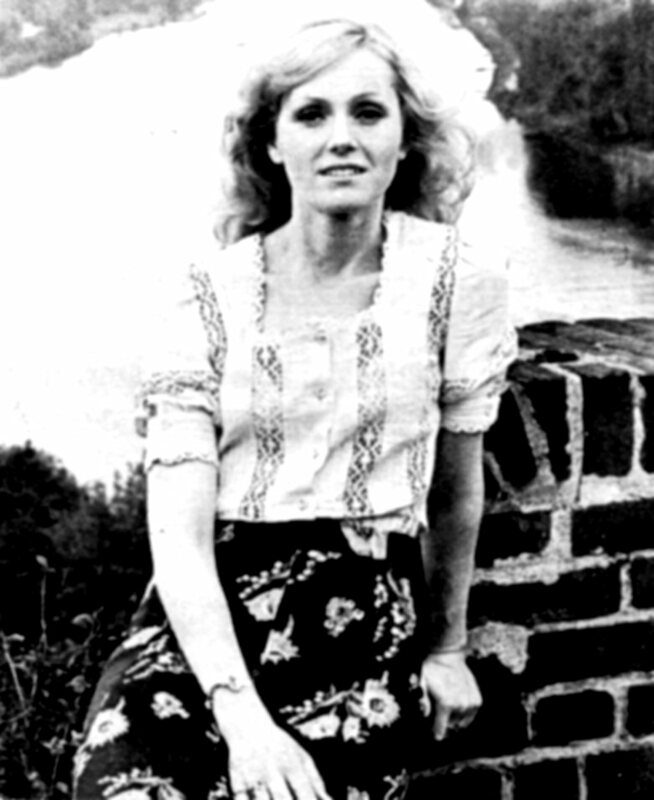 Even in 1977 Helena participated in the "Bratislavska lyra" festival. The International Song Festival in Sopot (Poland) was held at the end of August 1977. Helena performed the song "Malovany dzbanku" which became directly a big hit in Poland. She won the Grand Prix of the Festival. Nobody thought that the song would be so important for Helena. 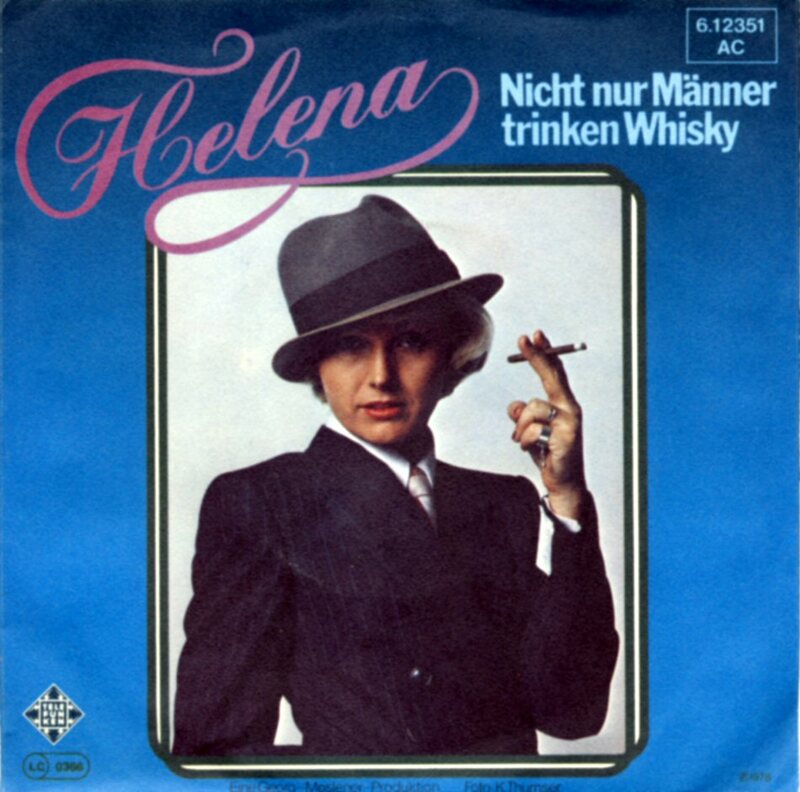 After more than 30 years it still remains the biggest Helena hit in Poland. 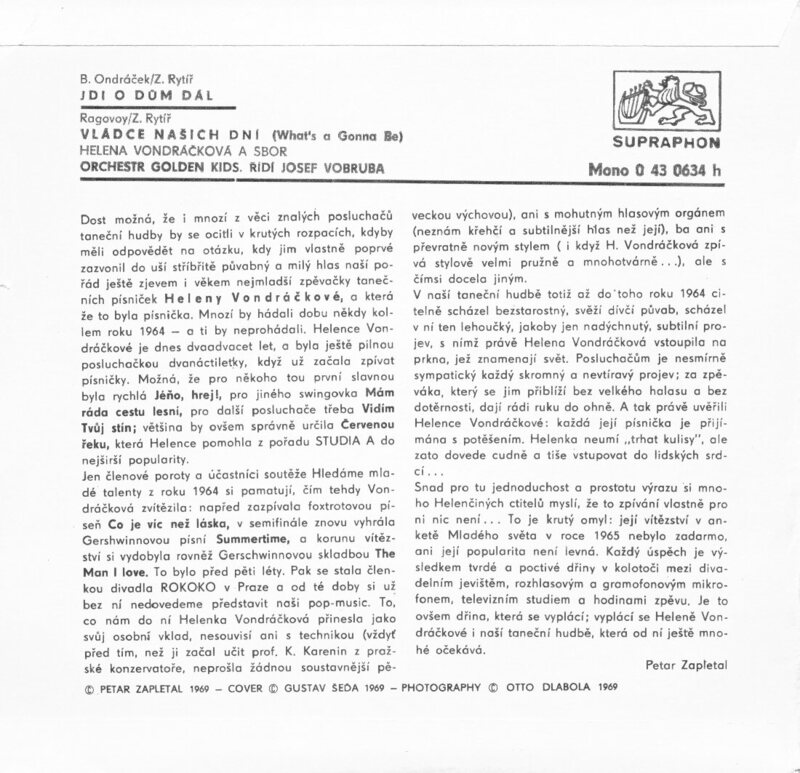 Due to the huge success of "Malovaný dzbanku" on the International Song Festival in Sopot in 1977 the song was re-released in Czechoslovakia as a single on side B. 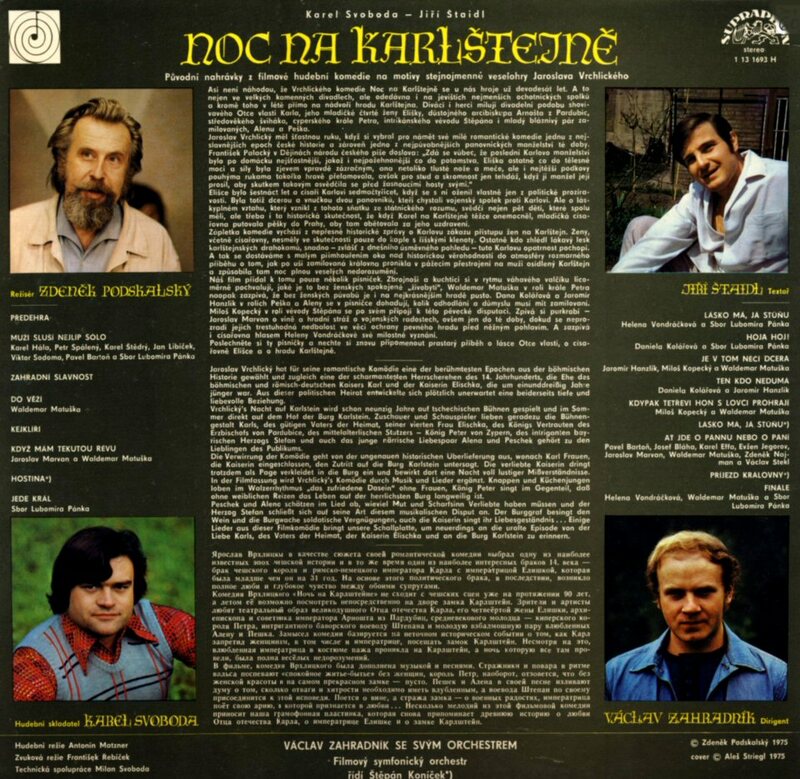 Side A featured the big hit from the movie "Night on Karlstejn" from 1975. 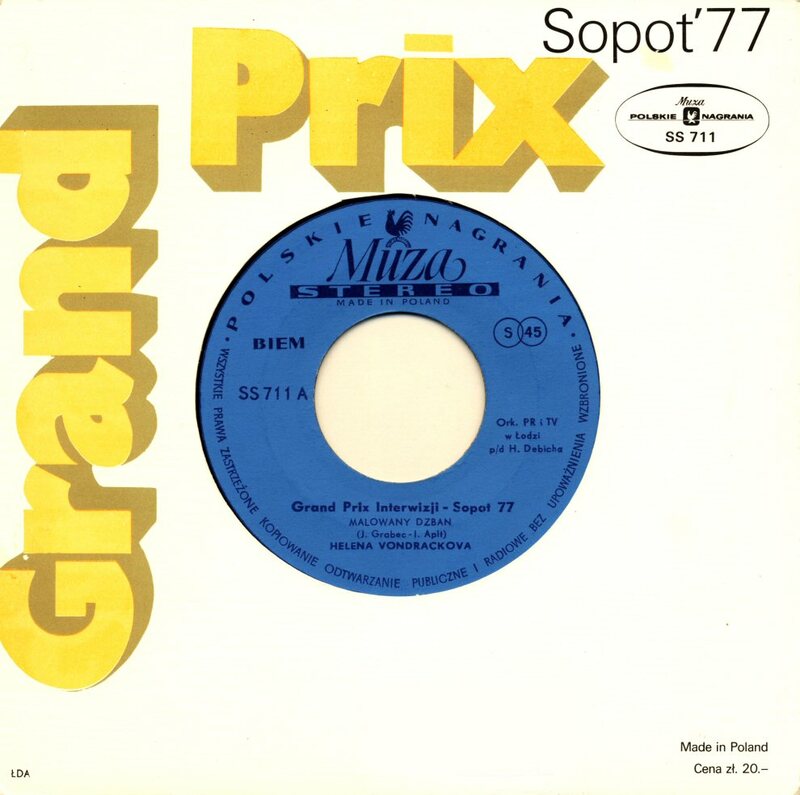 The single cover featured printed information about Helena's Grand Prix prize in Sopot. 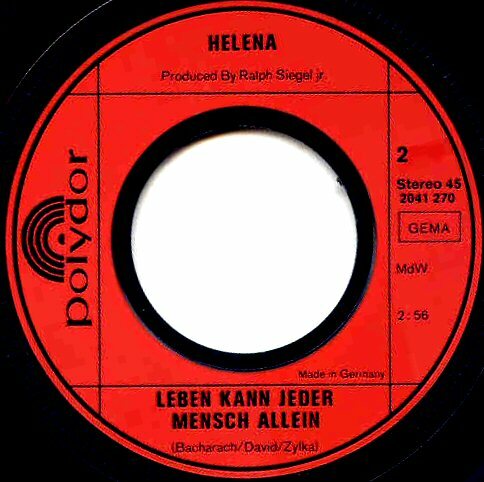 At the end of 1977 Helena released her first single from the forthcoming album "Unter der Asche meiner Liebe ist noch Glut" in West Germany. The single featured the title song from the album. The name of the artist was shortened to Helena and the complicated for Germans Czech surname was omitted. 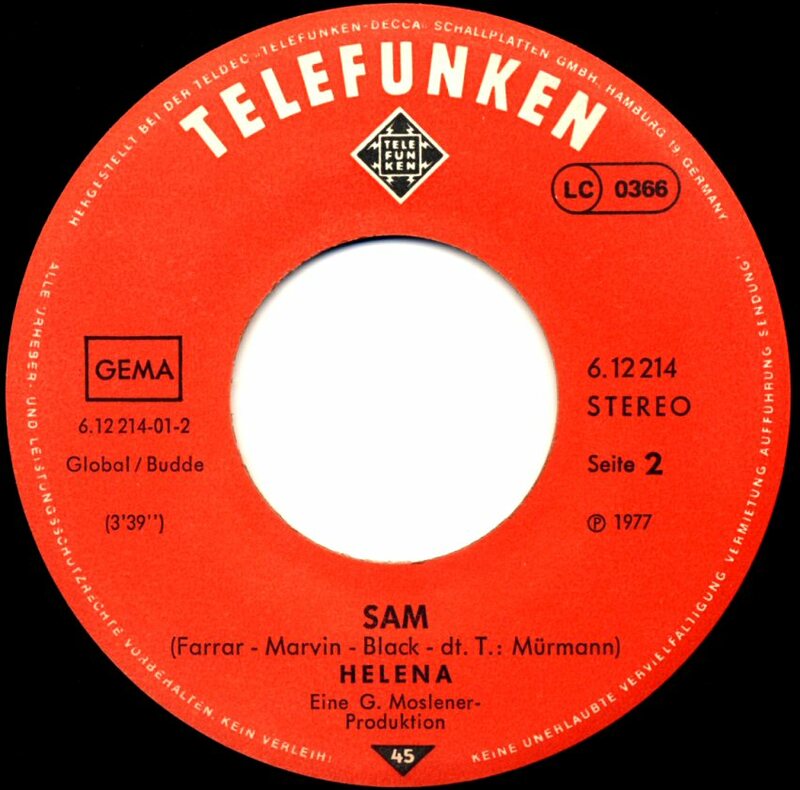 The B-side of the single featured Helena's cover of Olivia Newton-John's hit "Sam". The last single in 1977 featured a Czech language version of Natalie Cole's jazz-influenced song from 1976 "Mister Melody". 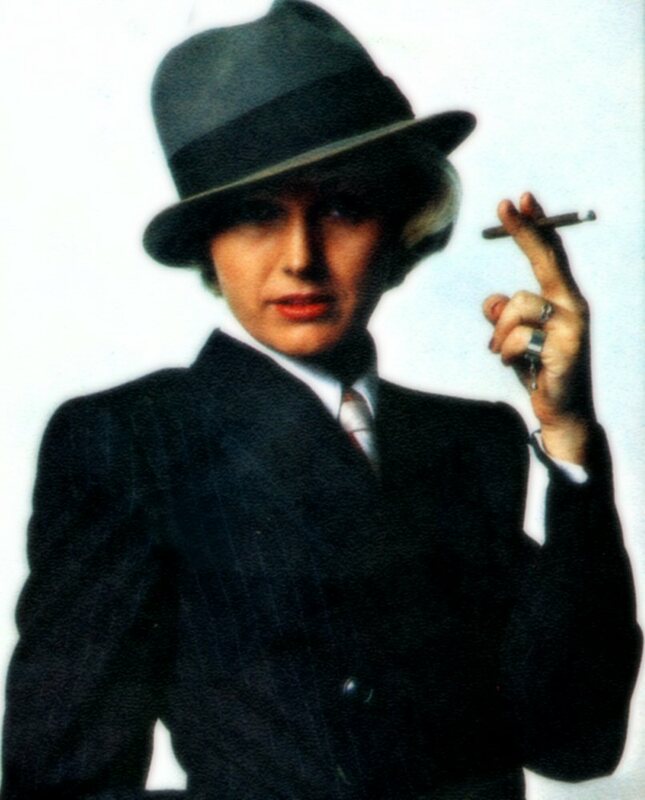 It was beginning of Helena's jazz period in her musical life which would eventually culminate with release of the jazz album "Paprsky" in 1978. 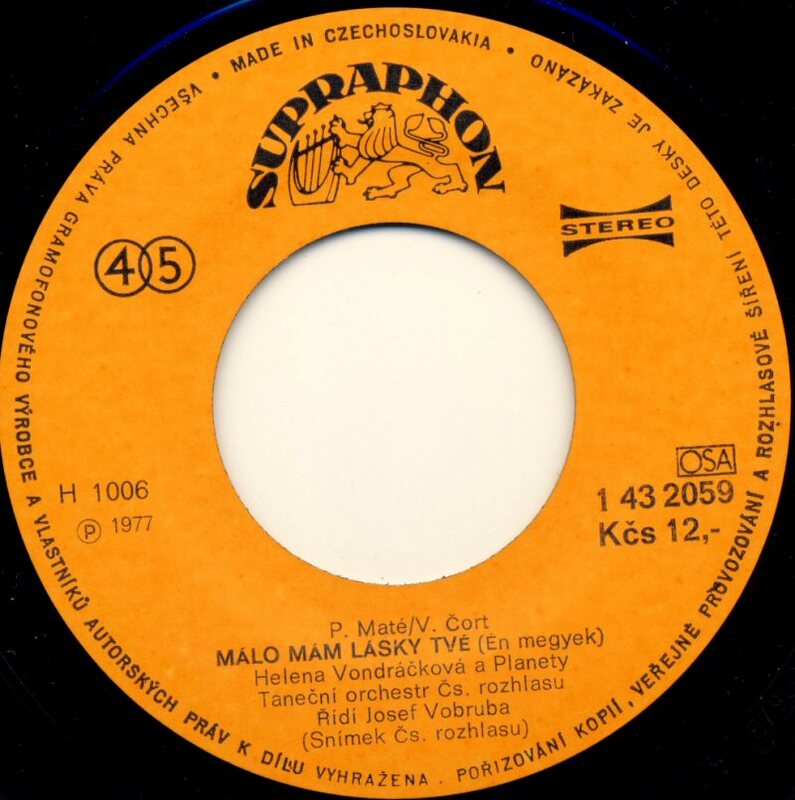 The song's Czech title was "Malo dni" (Not so many days). On the B-side of the single there was a cover version of Leo Sayer's Top 3 hit on the UK chart in October 1976 entitled "You Make Me Feel Like Dancing". 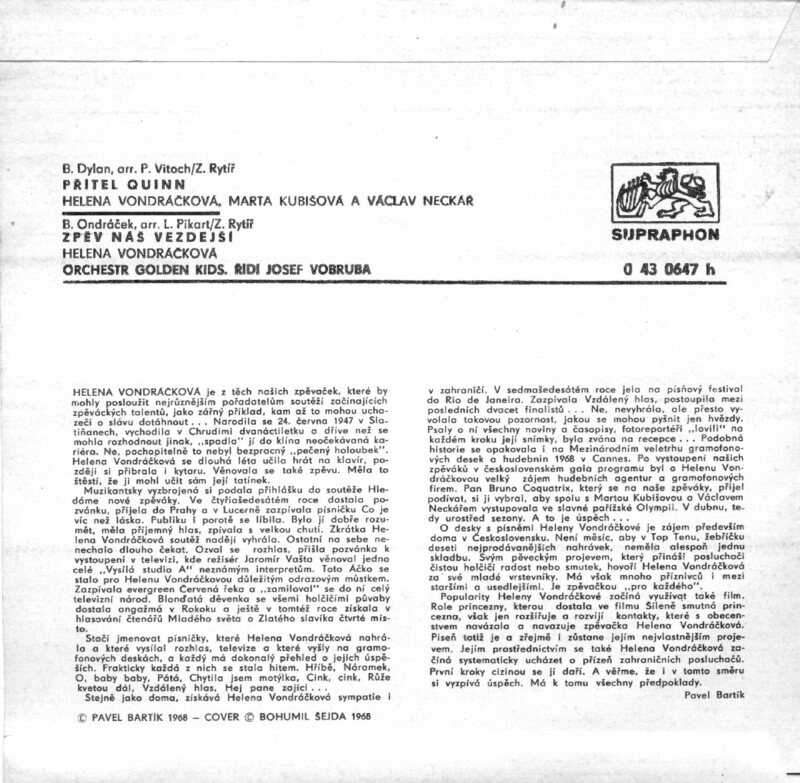 The Czech title was "Ty jdes a ja se vznasim" (You go and I fly). 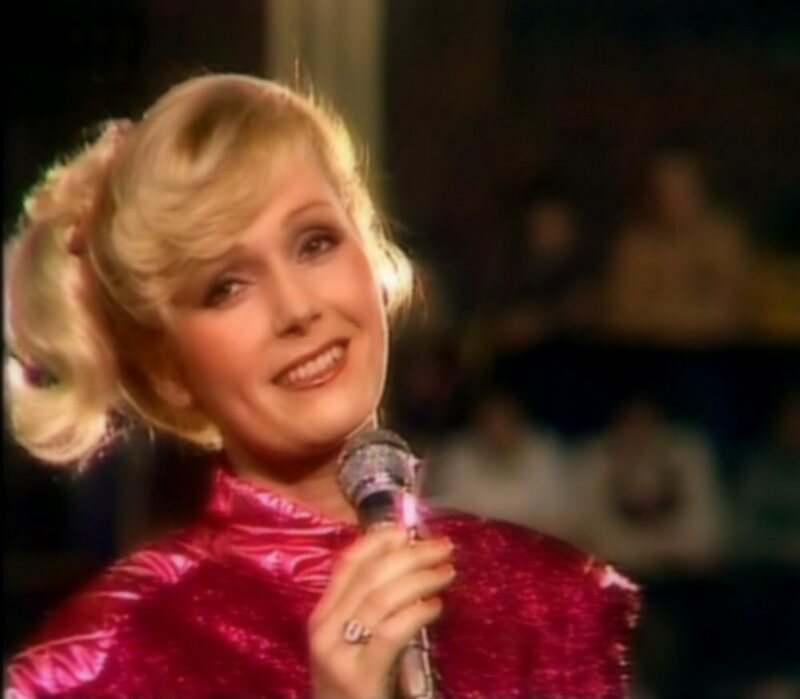 In 1977 Helena recorded a duet with another big pop star in Czechoslovakia Hana Zagorova. Both ladies had been equally big pop divas since the 1960s but strangely they met each other only once in the recording studio. They recorded the song "Two yellow chickens" which was more a joke than a pop song. 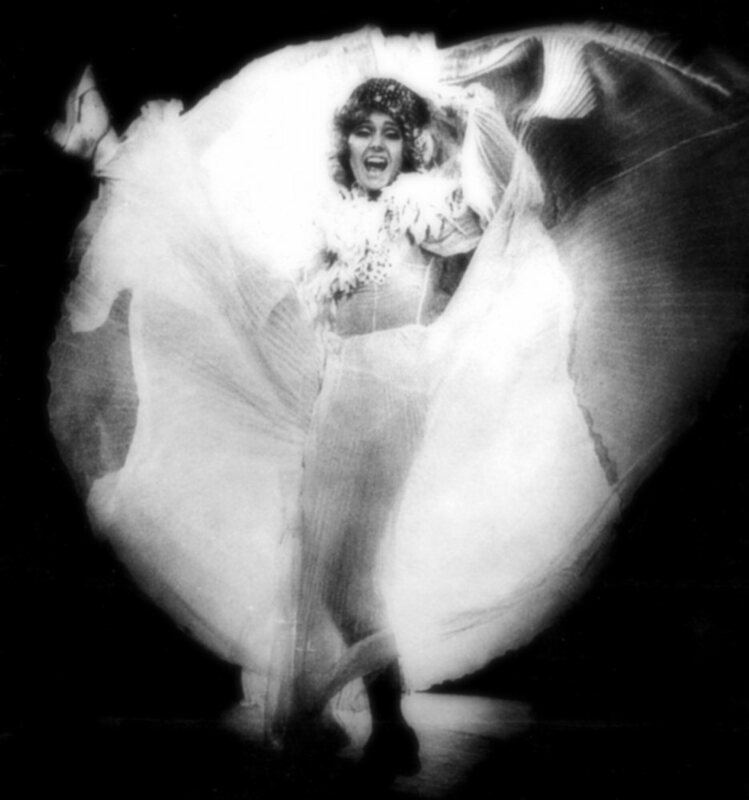 It was performed by Helena and Hana during the big annual New Year's Eve Show on Czechoslovakian TV recorded at the end of November 1977 and aired of course on 31 December 1977. 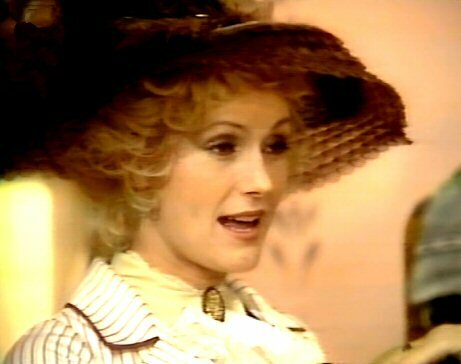 Helena made even her version of the musical world hit "Hello Dolly" for the show. 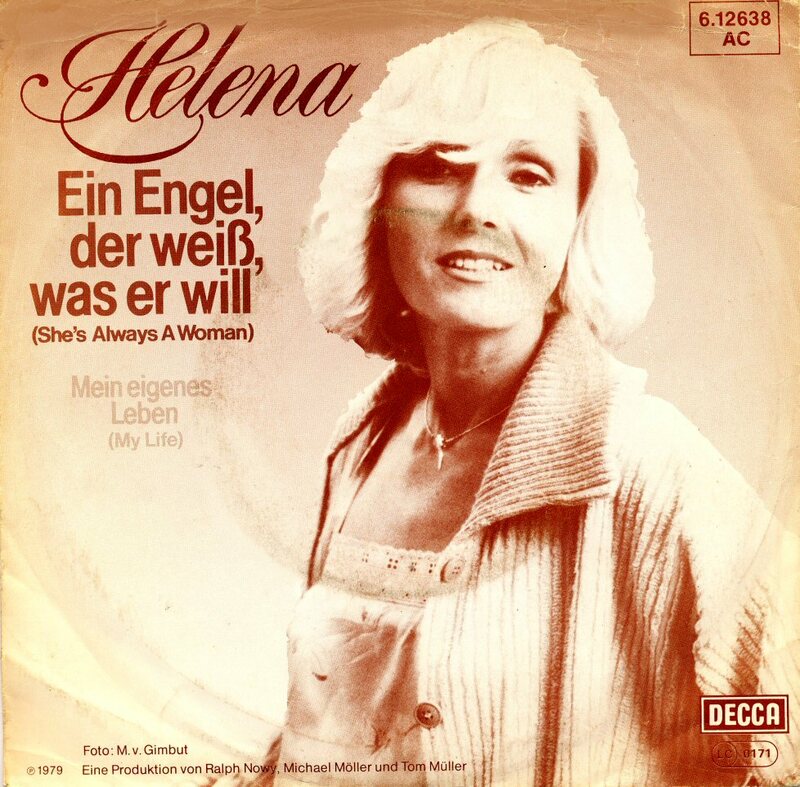 In 1977 Helena recorded an LP in German for release in 1978 on the West & East German markets. 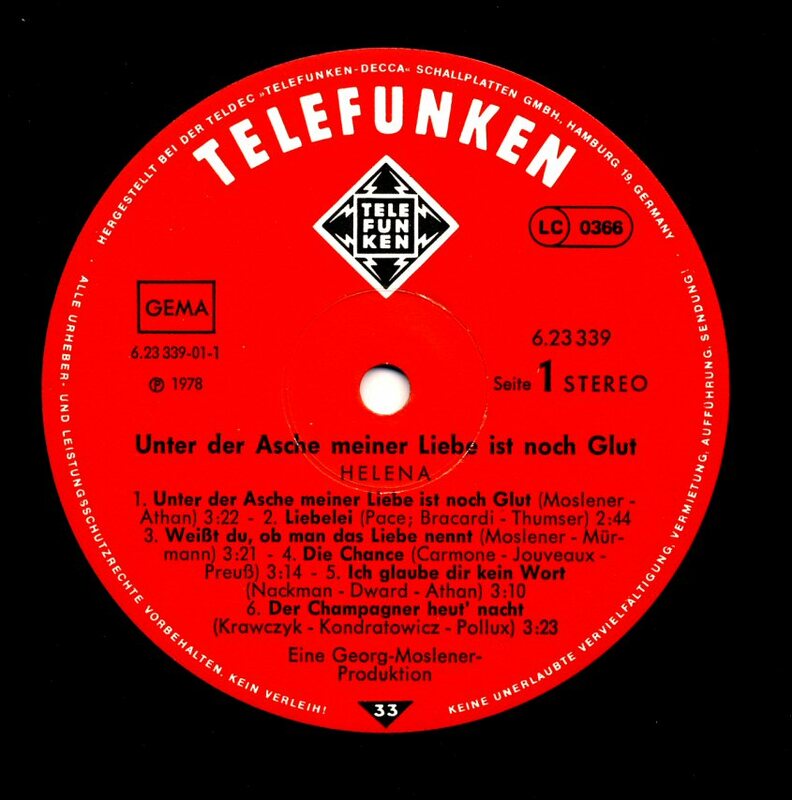 In West Germany the album "Unter der Asche meiner Liebe ist noch Glut" was released in January 1978 by the record company Telefunken which belonged to the Teldec-Decca group in Hamburg. 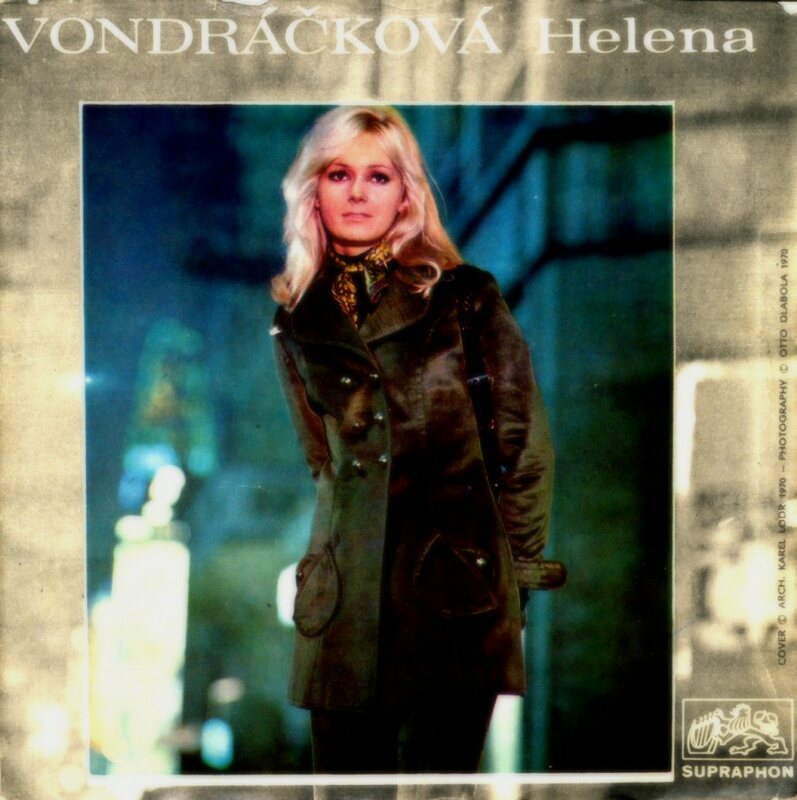 The artist's name was not Helena Vondrackova but only simply Helena. 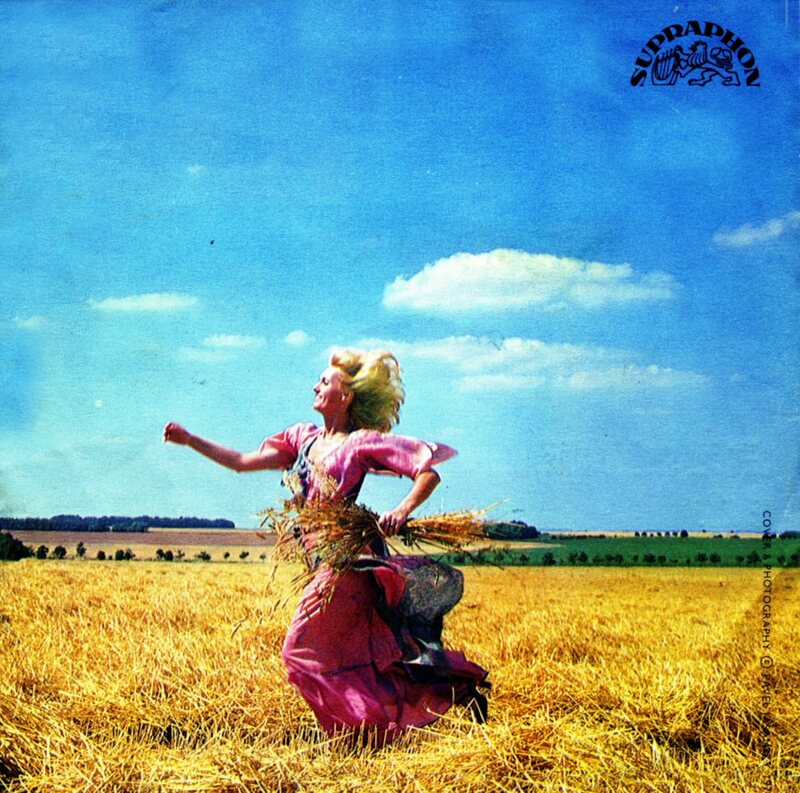 Otherwise the cover was the same as in East Germany as well as the track listing. 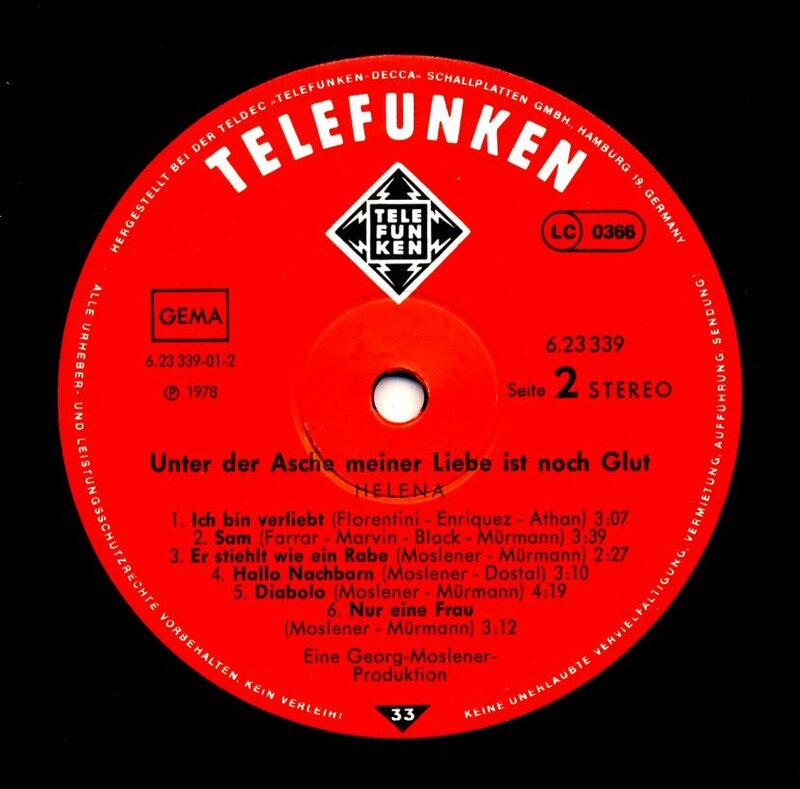 The LP entitled "Unter der Asche meiner Liebe ist noch Glut" contained 12 songs arranged in the typical German schlager style. 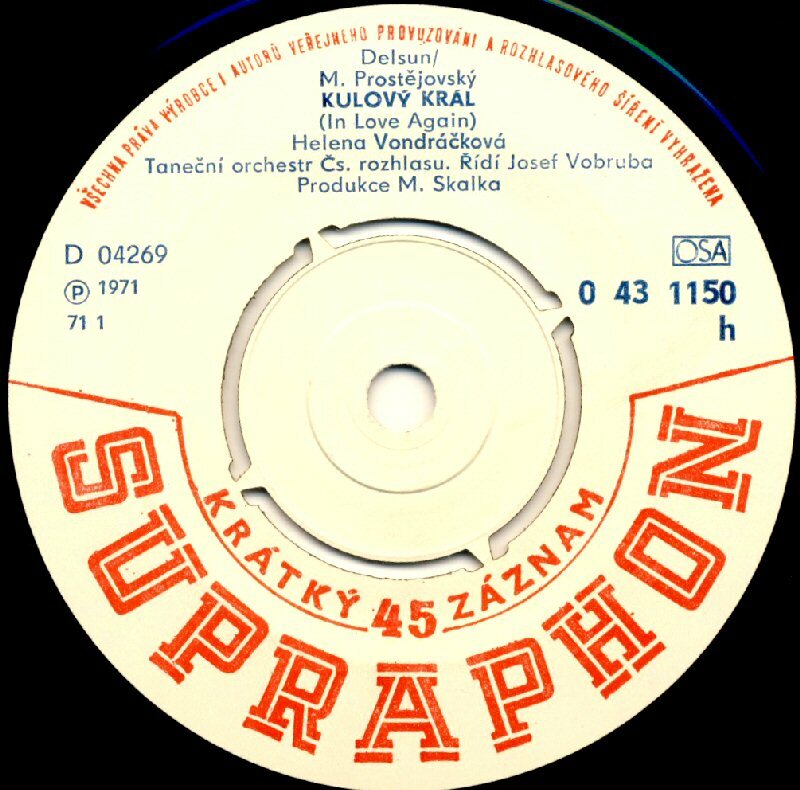 The recording sessions had taken place in Prague in the Supraphon studios. 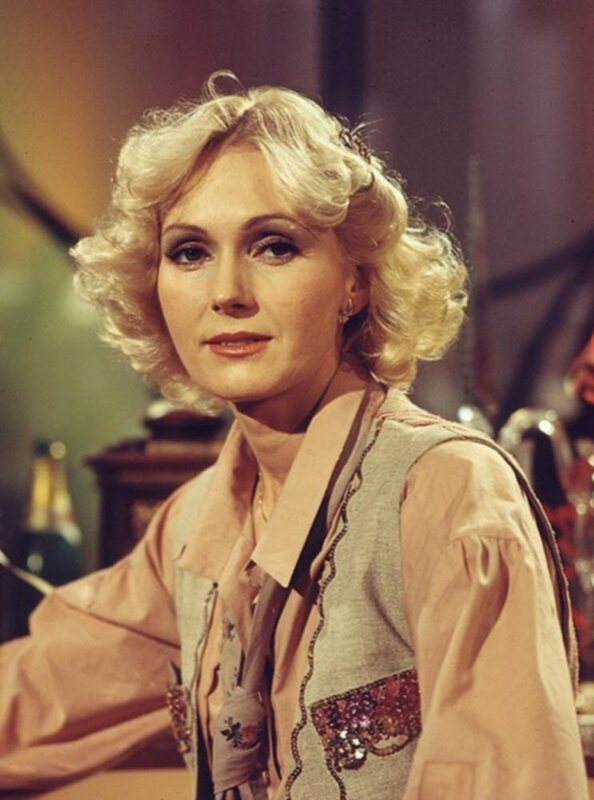 Helena appeared in several TV shows in both East and West Germany. 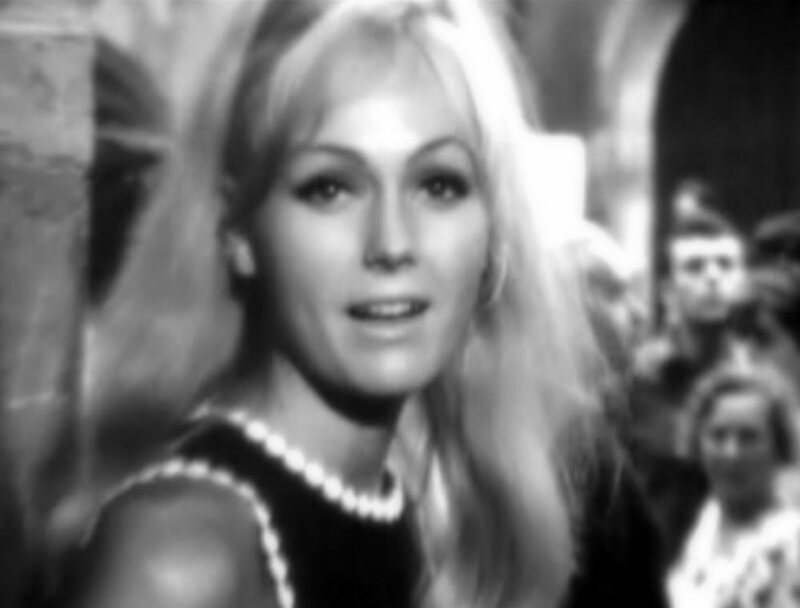 A video for the song "Unter der Asche meiner Liebe ist noch Glut" was filmed by the same time. 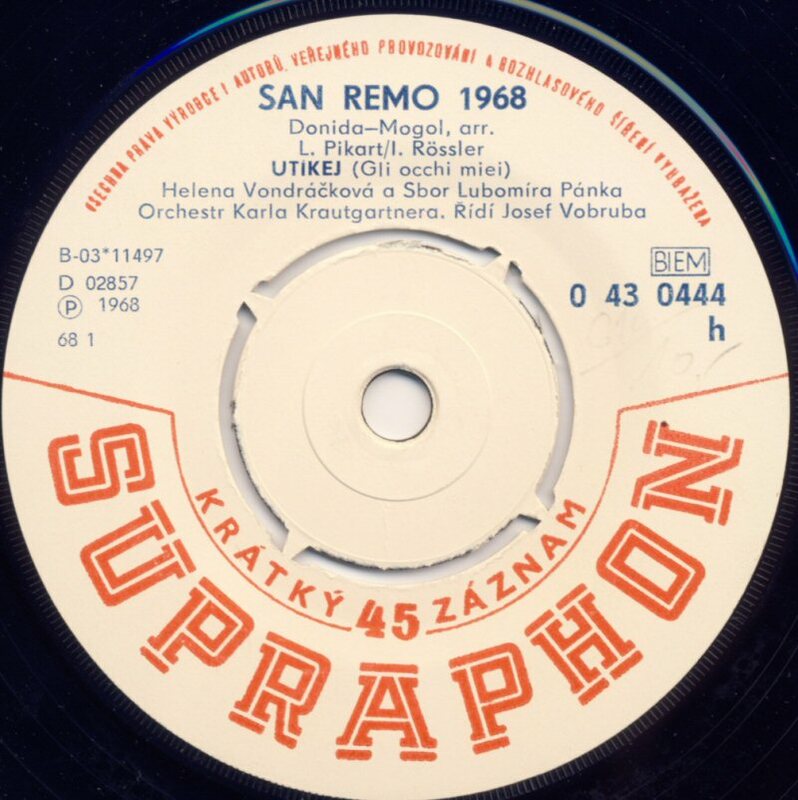 After Helena's stunning success in Poland on the International Sopot Festival in 1977 the recording company Supraphon released two singles connected to the festival. The first of them featured the re-release of the song "Malovany dzbanku" (originally released as a single in 1974). the B-side containted the big 1975 hit from the movie picture "The Night on Karlstejn" - "Lasko ma, ja stunu" (I stay, my love). 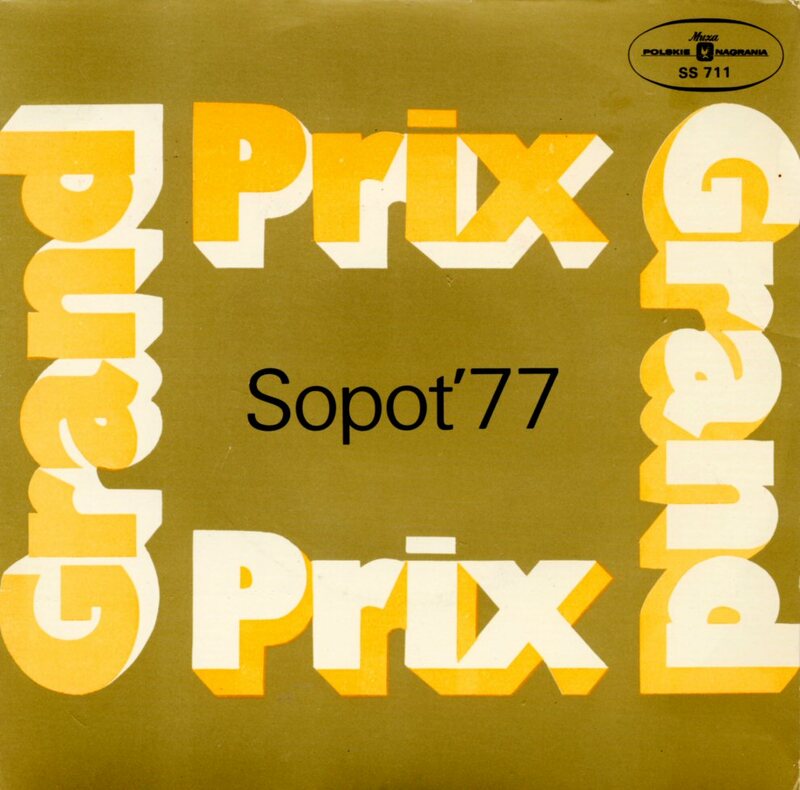 On the single cover there was a notice about the "Grand Prix" prize in Sopot 77. 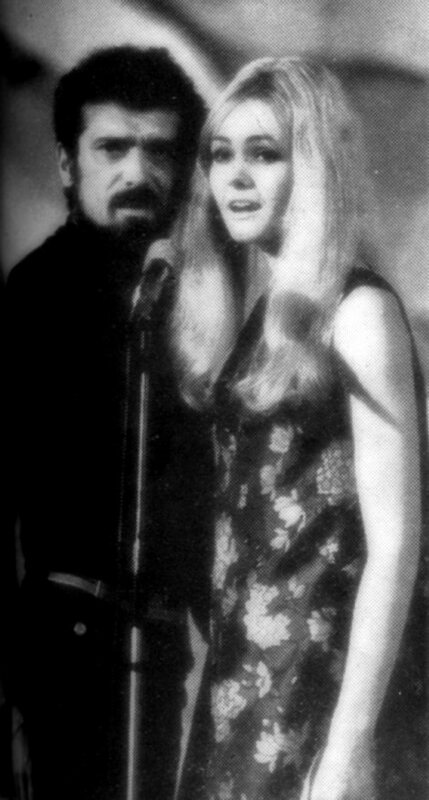 The first collaboration between Helena and Czech pop star Jiri Korn took place at the end of 1976 when they recorded their first duet "Ja pujdu tam a ty tam" which was cover version of the Eurovision Song Contest winner "Save Your Kisses for Me" performed originally by the UK group Brotherhood of Man. 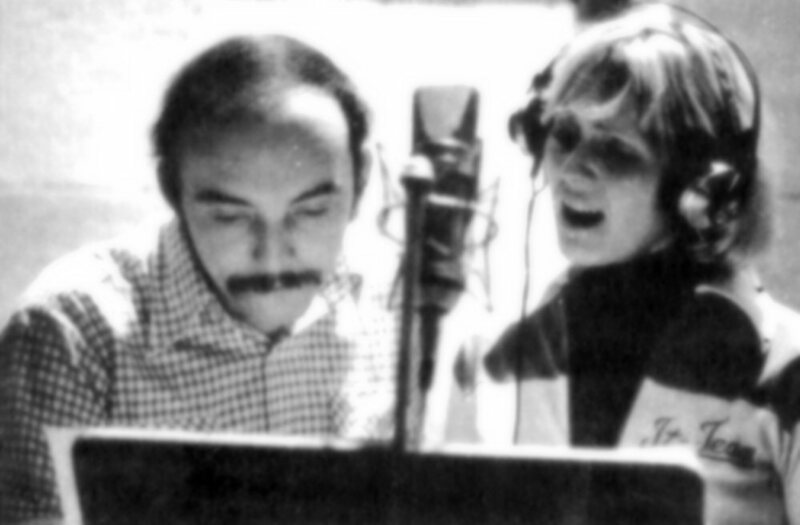 One year later Helena and Jiri got together again and at the end of 1977 they recorded Czech version of the Russian ballad "Dark night" (Temnaja noc) which received Czech lyrics and title "Noc kolem nas" (Night around us). 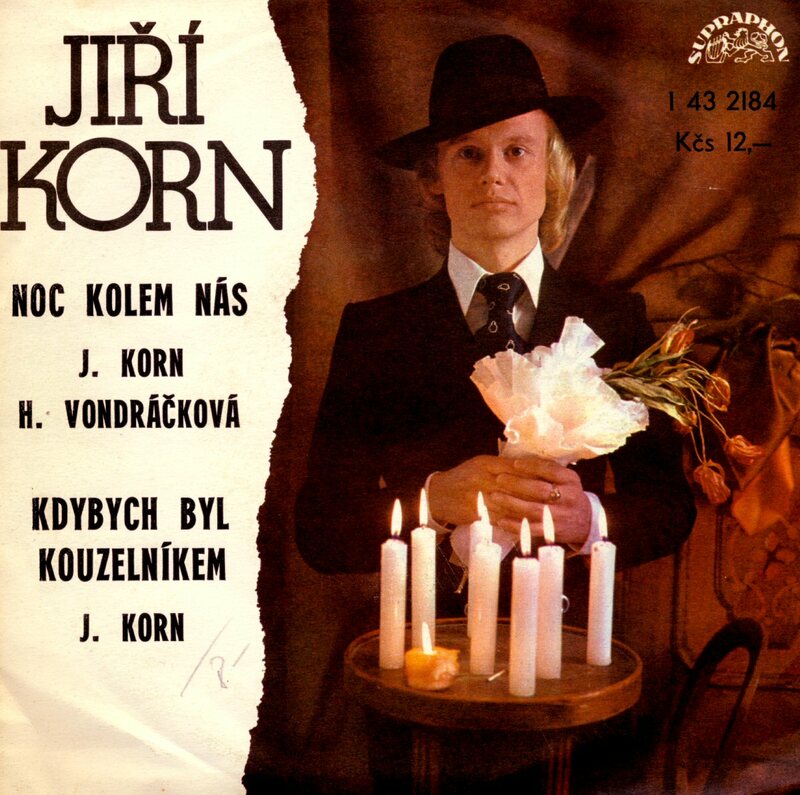 The single was released in two versions with two different covers - one of them featured Helena and one of them Jiri Korn. 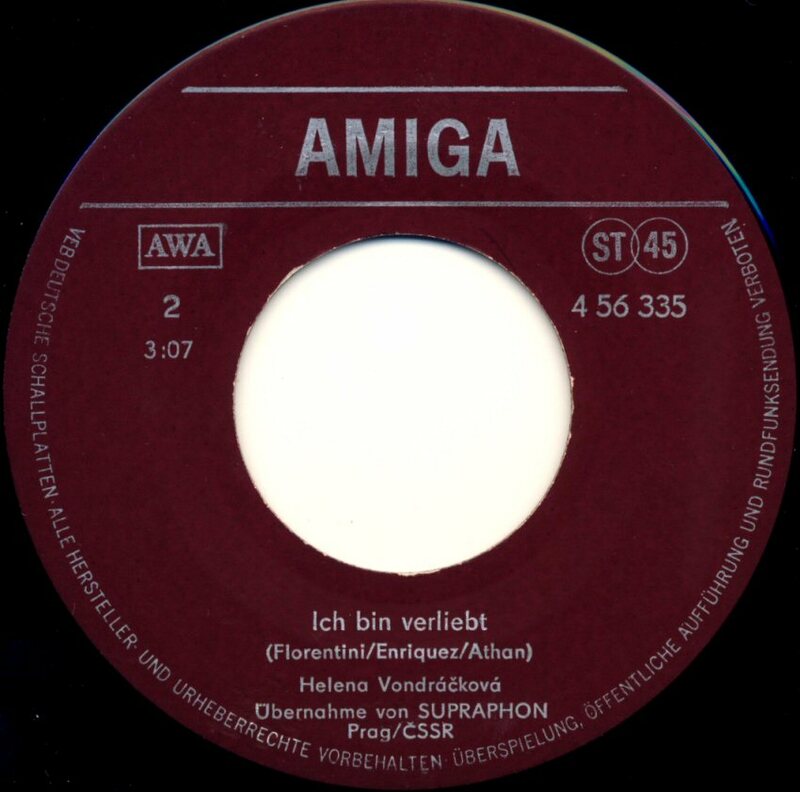 Both singles were released by Supraphon under the same catalogue number. 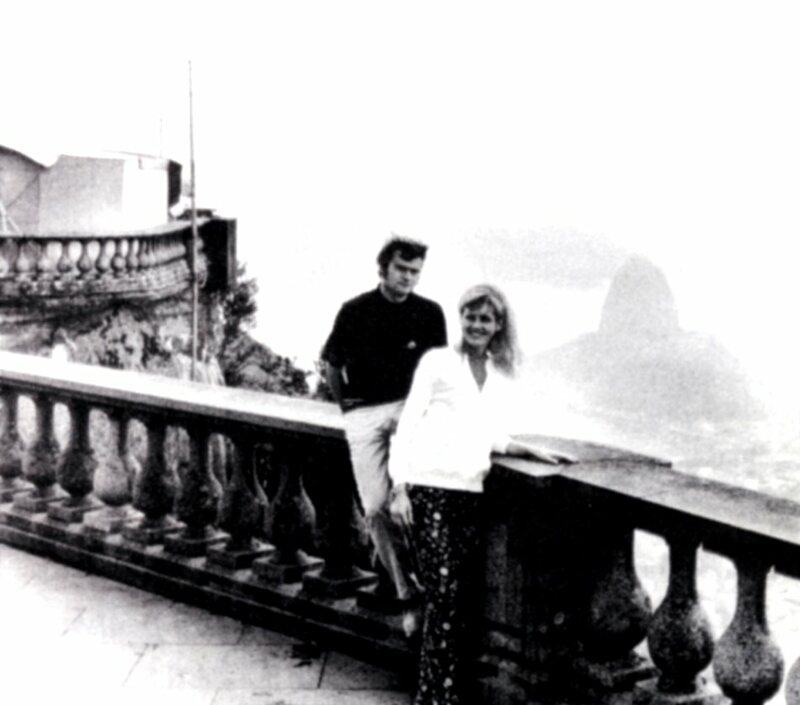 The song was performed for the very first time at the end of 1977 in the TV show "Svadebni cesta" (Honeymoon trip). The second single featured Helena's cover version of the Polish hit "Nie spoczniemy" (We don't give up) written by Polish pop idol Seweryn Krajewski. 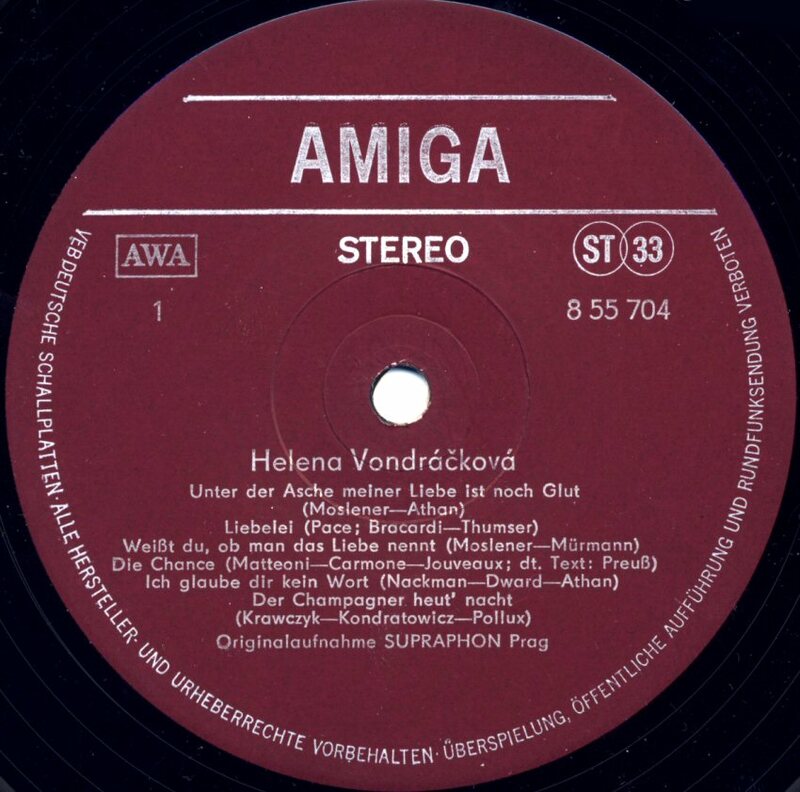 Helena heard the song which was performed by Krajewski's group "The Red Guitars" (Czerwone gitary) on the festival in Sopot in 1977 and she liked it so much that decided to record her own version of the song in Czech language. 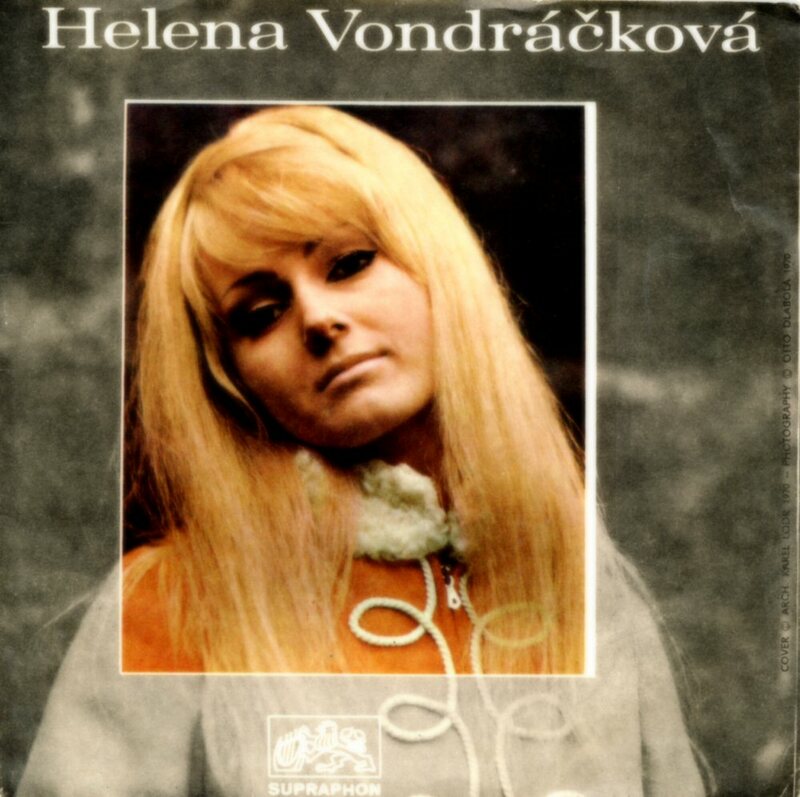 The Czech title was "To se zvladne" and the song still belongs to Helena's favorites. Stevie Wonder's smash hit "Sir Duke" became very successful even in Helena's version which was released as a single both in Czechoslovakia and Poland during the year 1978. The Czech language version of the song was entitled "Tentokrat se budu smat ja" (I Will Laugh this Time). 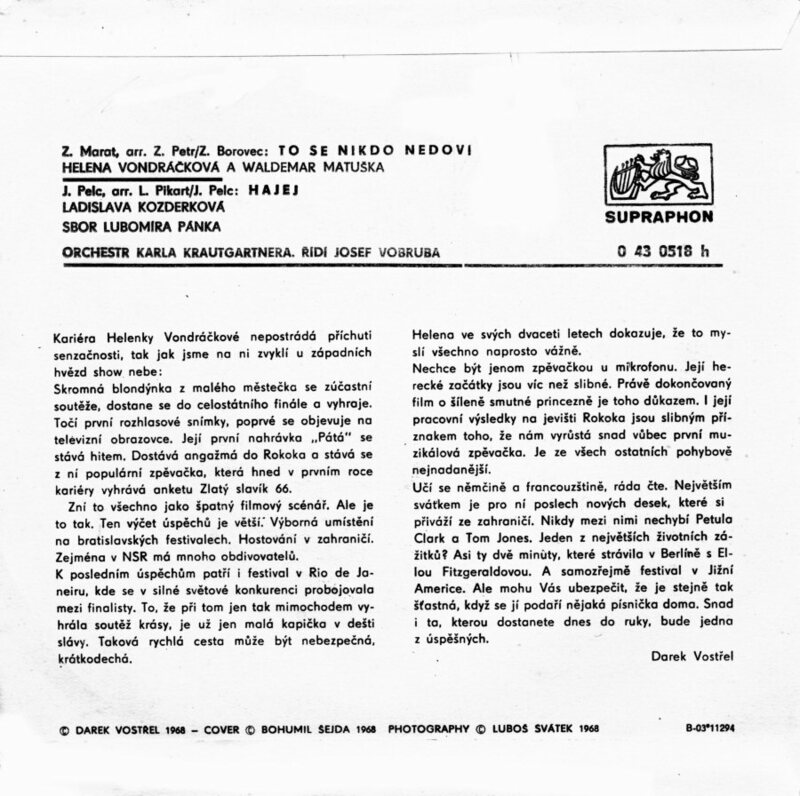 Side B of the single featured a non-LP track "Devce, smulu mas je muj" (Girl, you've got bad luck) which was even released on SP in Czechoslovakia at the beginning of the year. Helena tried different music styles during her career even if she is most known as a pop singer. 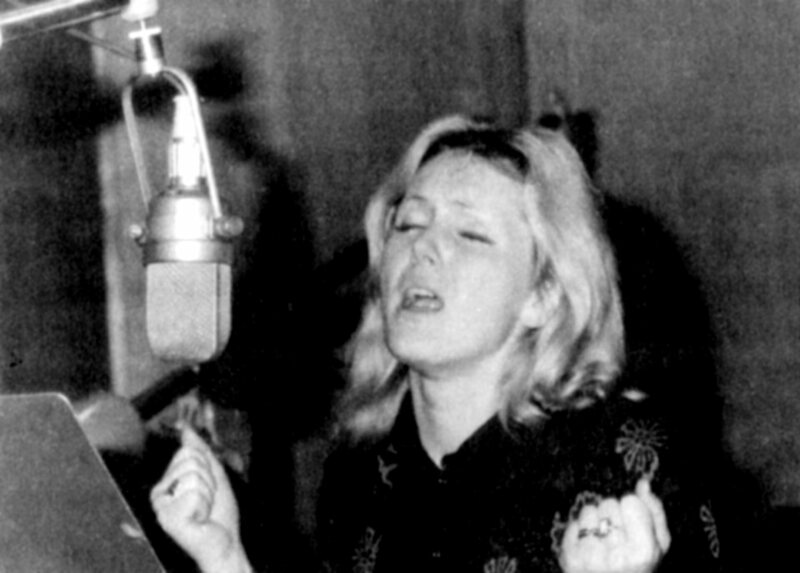 At the beginning of February 1978 she started recording sessions for her new album which would be called "Paprsky". It took almost 3 months to complete it. This project would be called "a jazz-rock experiment". The 13 songs composed for the album were vocally arranged by the singer in the studio. 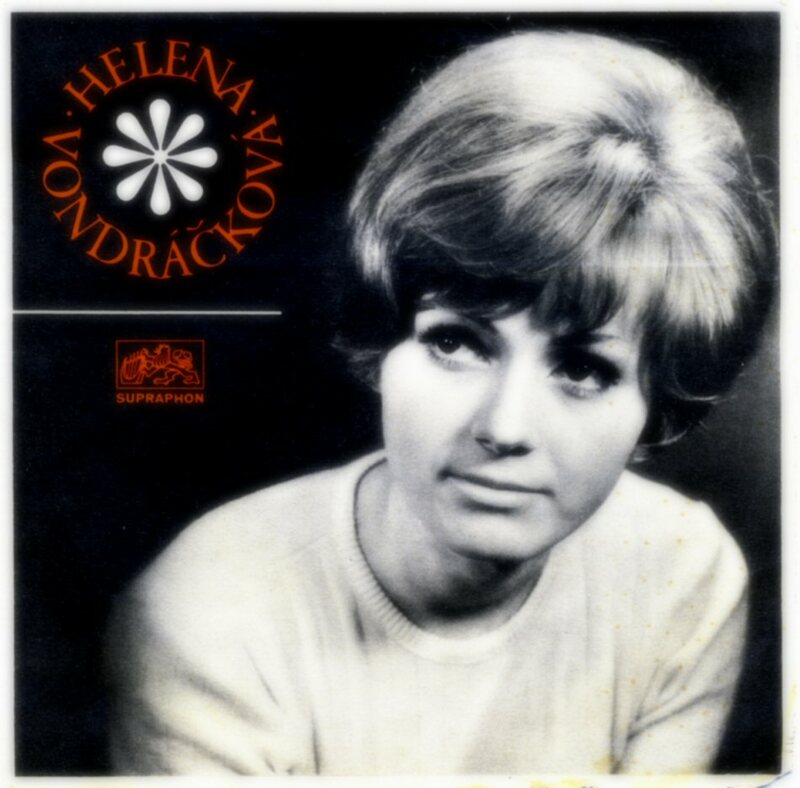 This LP was definitely a new experience for Helena as a singer but it did not contain any bigger hits and it did not become a big commercial success. The album was released later in 1978. Helena participated in a big TV show entitled "Wonderful women on flying machines". Several popular Czech artists appeared in this show and among them Hana Zagorova and Jiri Korn. Helena performed two ABBA songs: "Dance" and "Money Money Money" and Hana Zagorova "Fernando". The story was about Czech engineer Kaspar who flew on self-constructed airplane in 1911 from Pardubice to Prague. 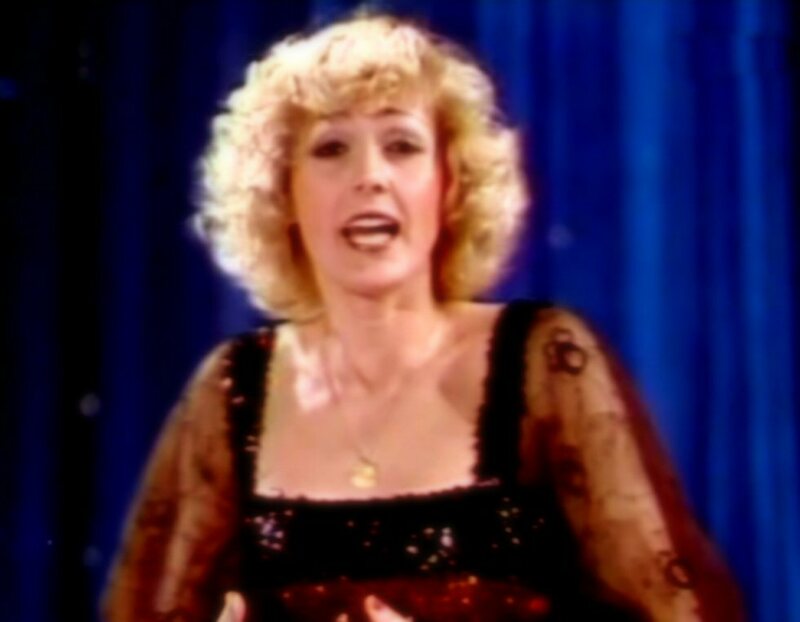 In the traditional New Year's Eve show recorded by Czechoslovakian TV Helena performed her version of well-known "Hello Dolly" and together with Hana Zagorova "Piano Jack And Dixieland" (in Czech). 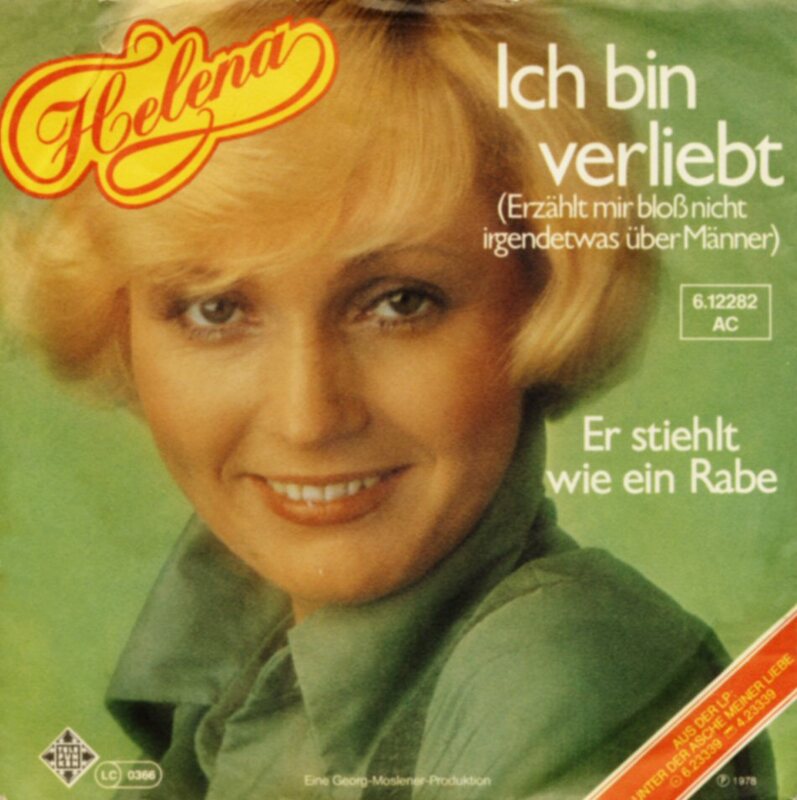 In 1978 Helena was promoted in both East and West Germany by a new album and several single releases. 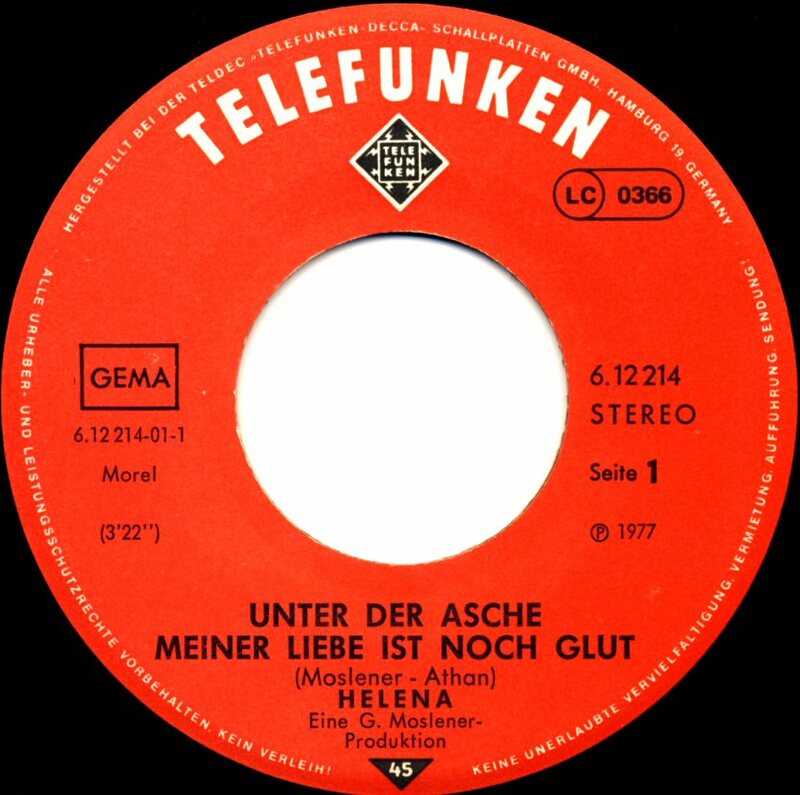 The first single out in East Germany featured the song "Unter der Asche meiner Liebe ist noch Glut" and was even the title song on the forthcoming album. The flipside contained "Ich bin verliebt". 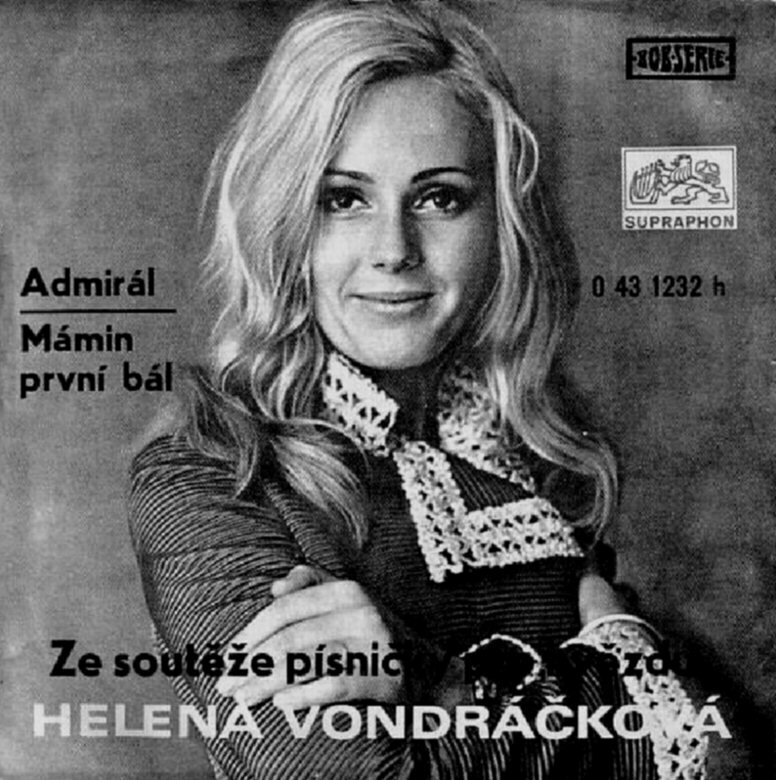 The cover of the single featured a photo taken during the Sopot Festival in 1977 where Helena won with "Malovany dzbanku" - one of her biggest hits ever. 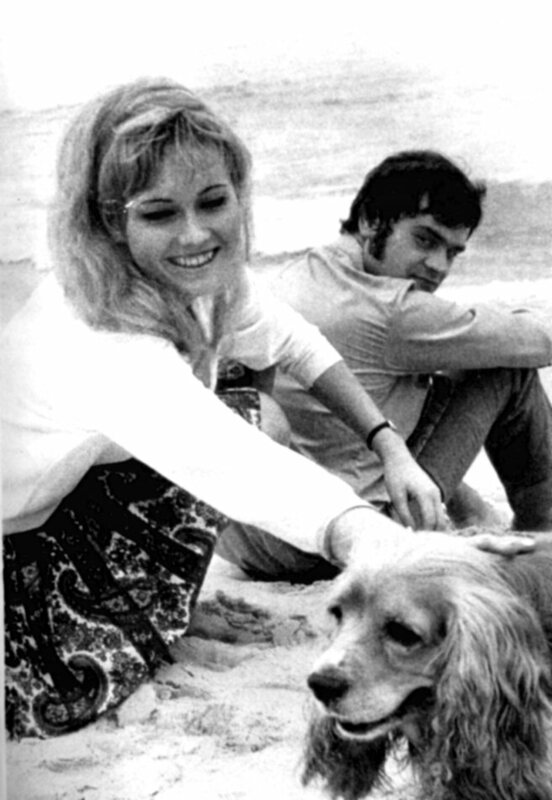 The second single selection from the album in West Germany was "Ich bin verliebt" b/w "Er sthielt wie ein Rabe". Both songs were taken from the LP. Even this single was promoted on TV in several big shows. 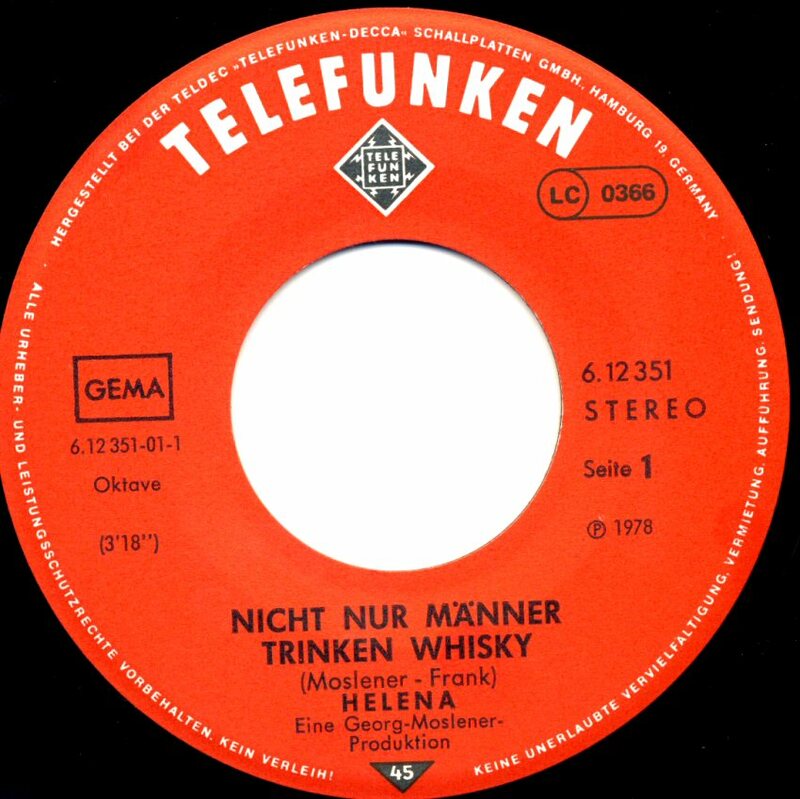 The third single in West Germany in 1978 featured a non-album track "Nicht nur Männer trinken Whisky" with "Diabolo" on the flipside. 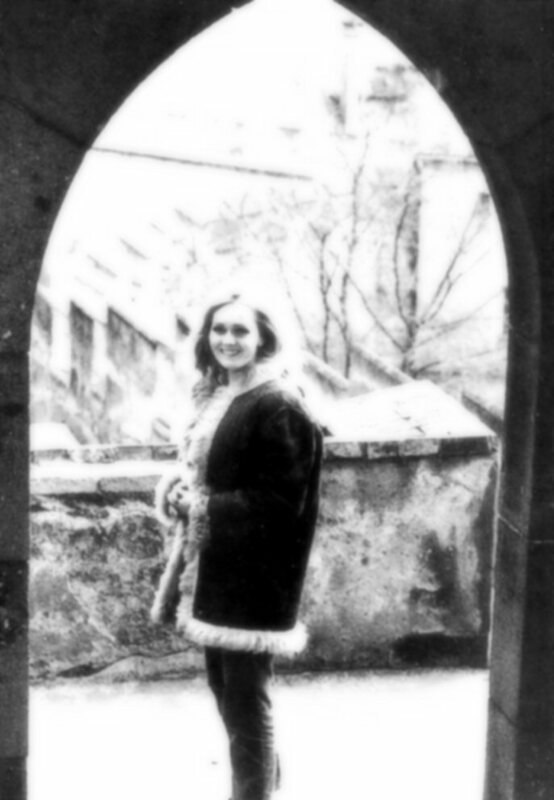 In March 1979 Helena started a new recording session for a new album at the Mozarteum studios in Prague. The sessions would last until July 1979. The result was a new album which would be released at the beginning of 1980. The first song promoting the upcoming album was the only cover included on this LP called "Tanecnice Kitty" (Dancing in the city). A video was made by Czech TV in the Autumn 1979. 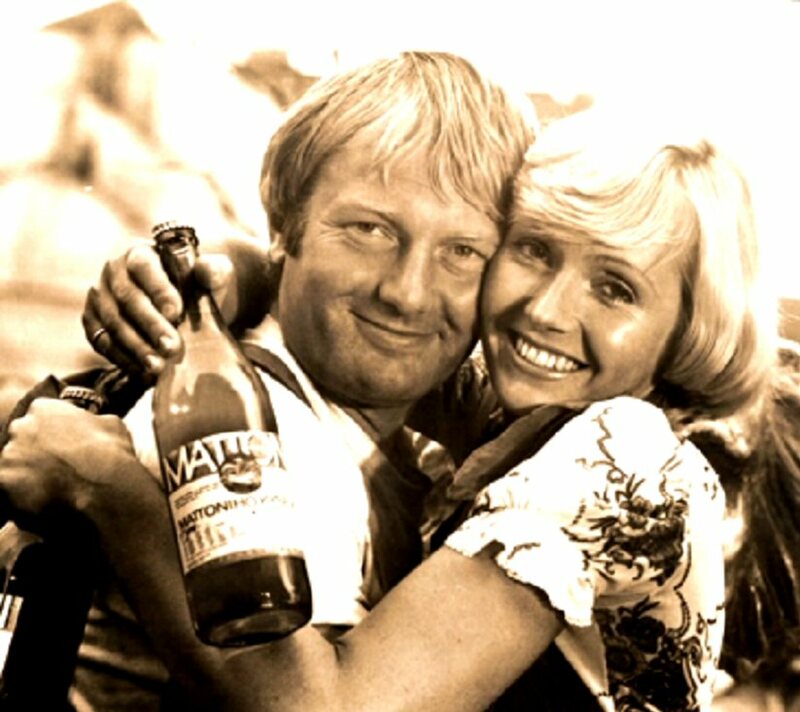 The most successful single release in 1979 was "Oh Harold"/"Vzhuru k vyskam". Both songs became big hits. 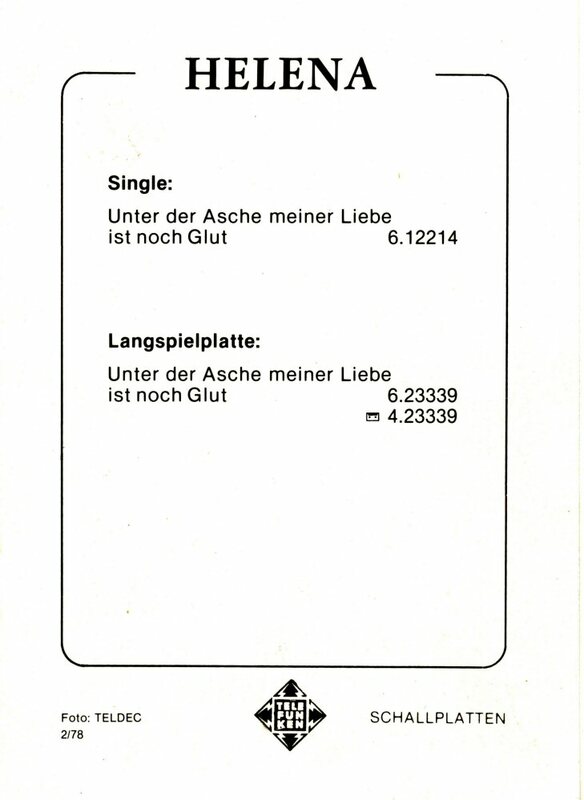 The East German release of the album had wait until 1979. The album was released on LP and MC. 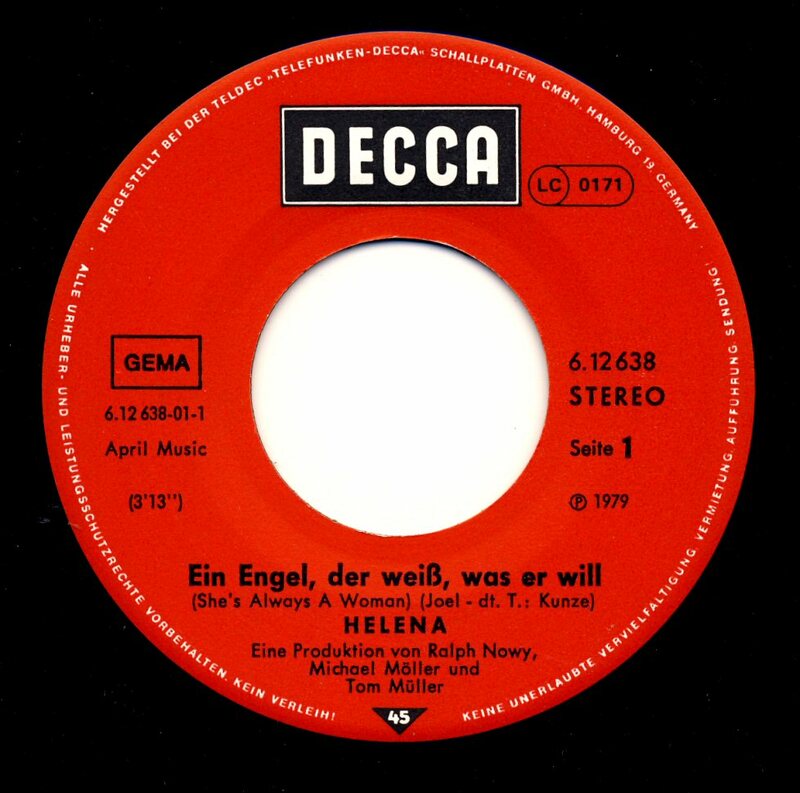 The forthcoming second Helena album in West Germany was promoted by the single "Ein Engel, der weiss was er will" b/w "My eigenes Leben". The single was released by the record company Decca. 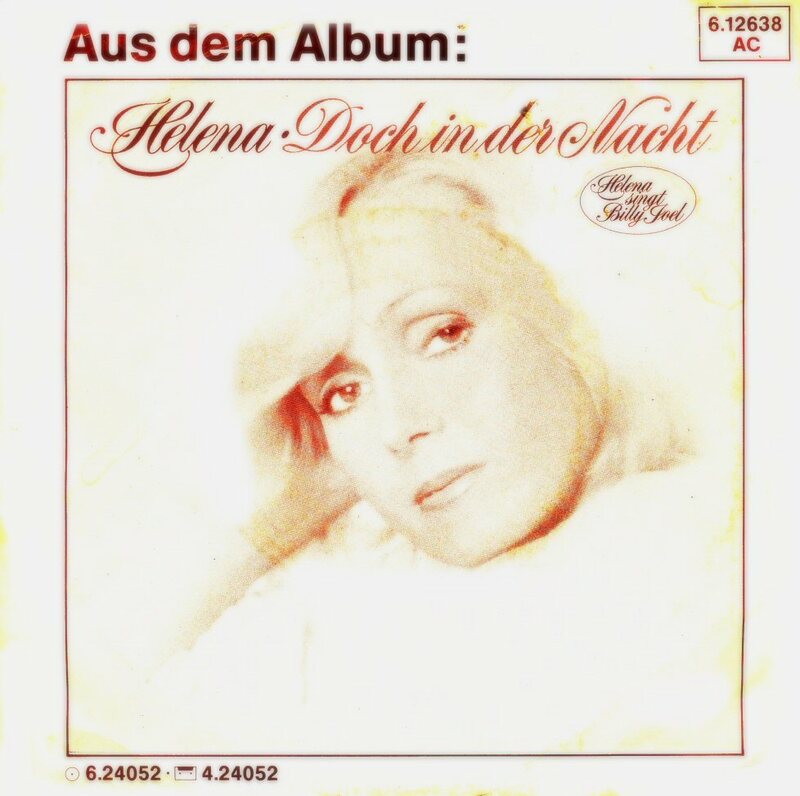 A new album with Helena's interpretations of Billy Joel's songs was released in West Germany by Decca in 1979. The album was entitled "Doch in der Nacht" and contained 10 songs composed and originally recorded by the Billy Joel. The German lyrics had been written by Michael Kunze. 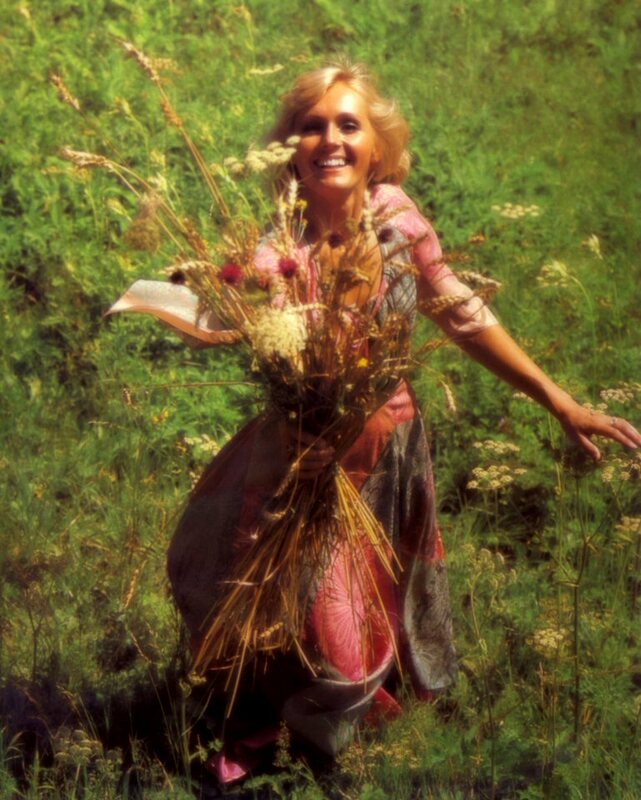 The West German edition of the album contained even an inner sleeve with lyrics and a beautiful photo of Helena. (The Czechoslovakian release of this album would wait until 1981). 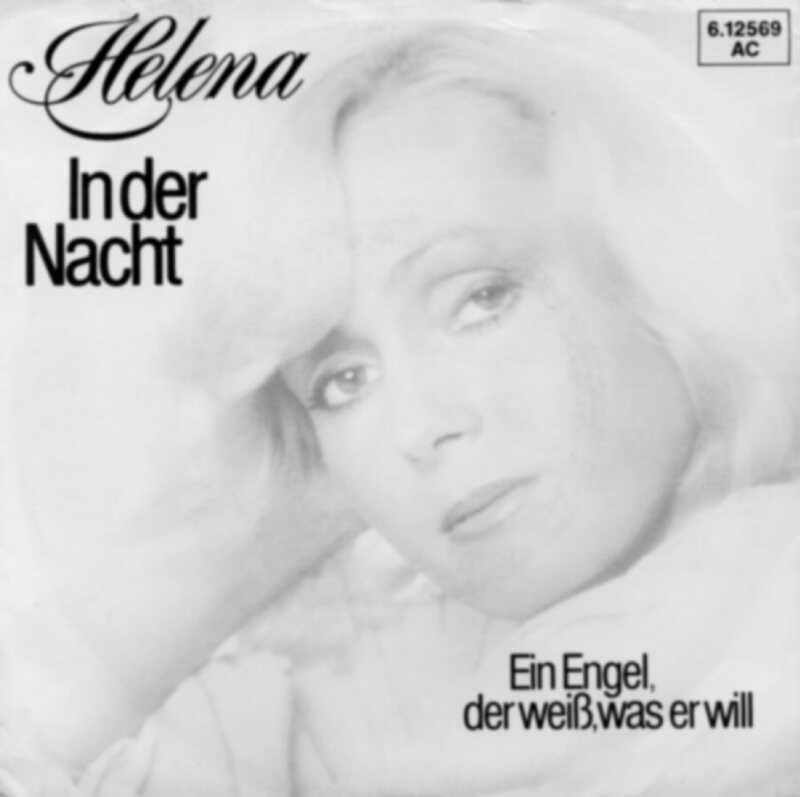 The second single release from the album "Doch in der Nacht" featured "In der Nacht" b/w "Ein Engel, der weiss, was er will". 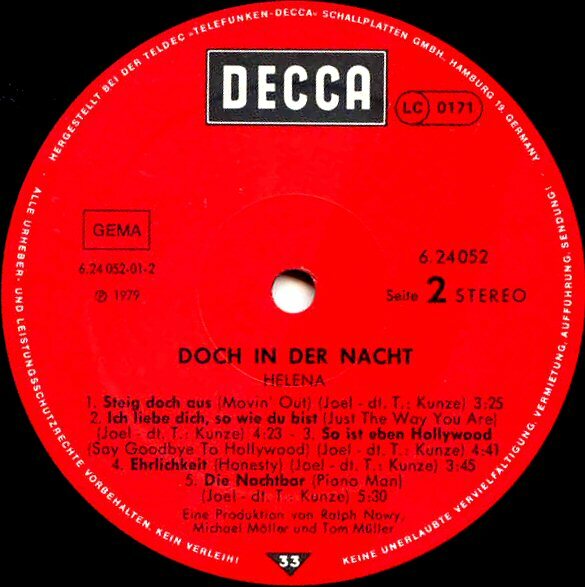 It is quite unclear why Decca released "Ein Engel..." twice both as A and B sides. 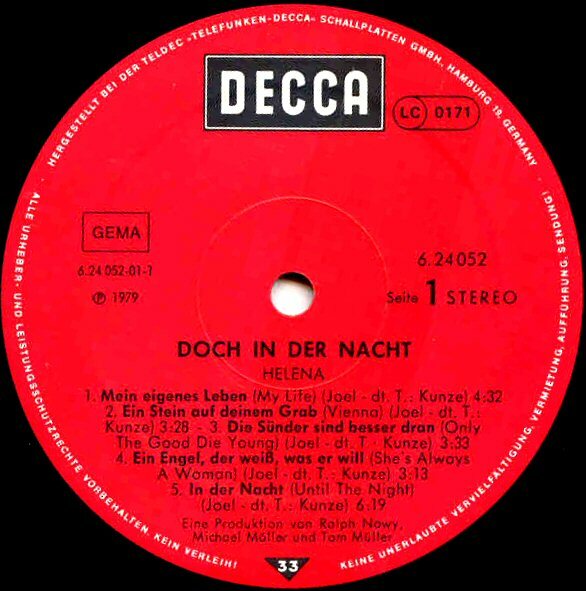 The wonderful "In der Nacht" (orginally entitled "Until the Night") appeared on the single in its full-length version of 6 minutes 17 seconds long. 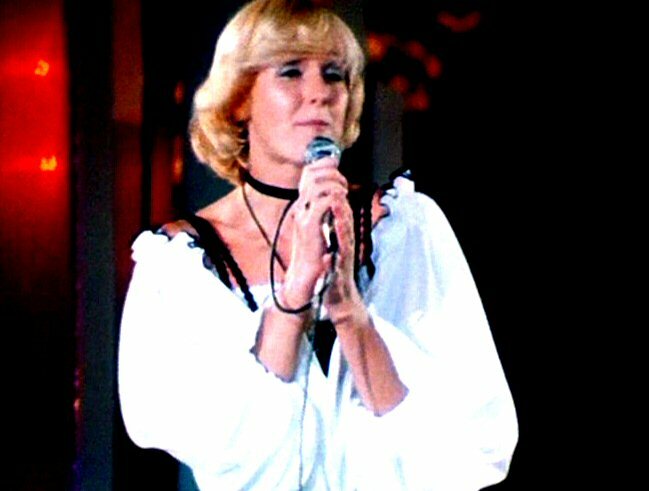 In November 1979 Helena went to Tokyo (Japan) where she participated in the "World Popular Song Festival" with the song "Kdyz zabloudis, tak zavolej" (Call me if you if you get lost). The winner of the festival was Bonnie Tyler. 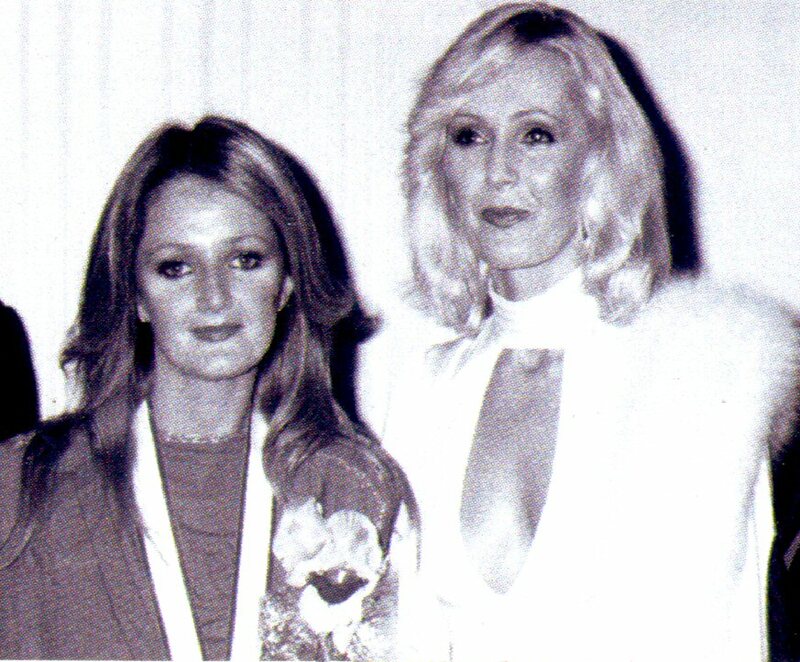 The annual pop "Nightingale" awards' gala was held at the beginning of December 1979. 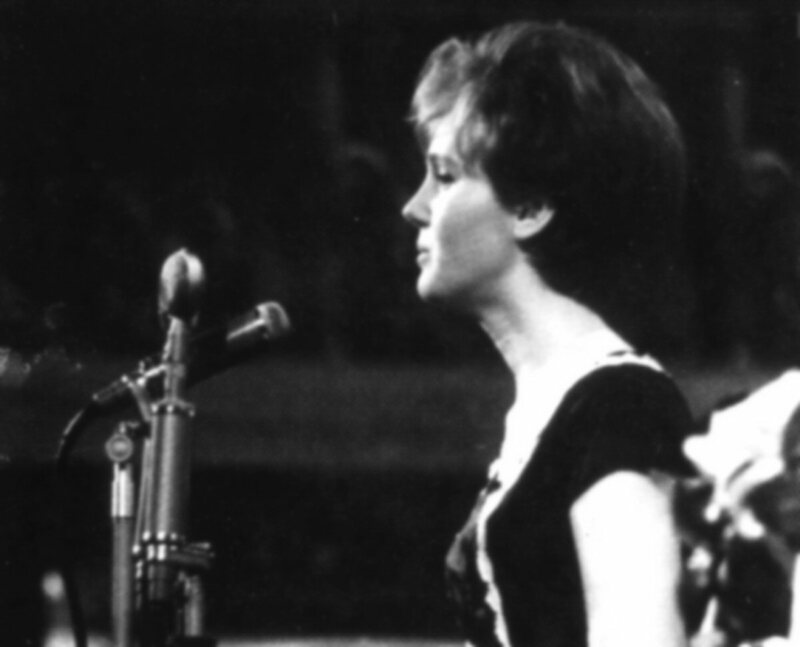 Helena received Silver Nightingale as the second best female singer in Czechoslovakia.